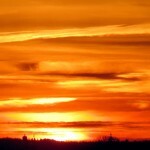 Well here we are, the last day of January. 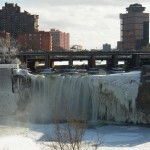 It was a very cold and snowy month. 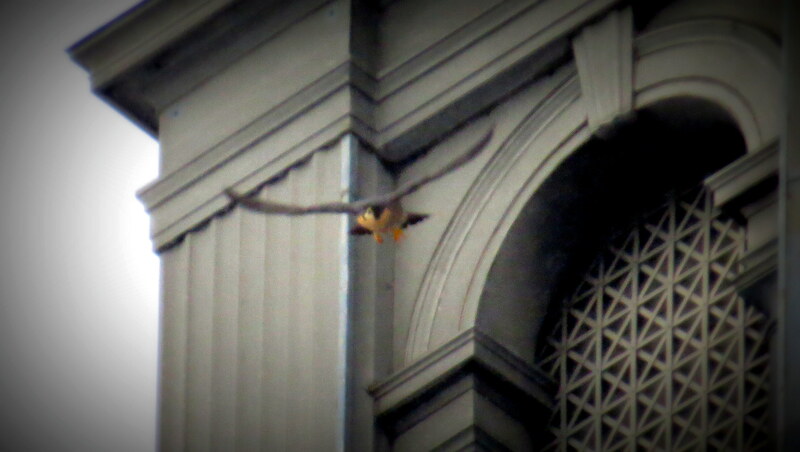 Today was no exception. 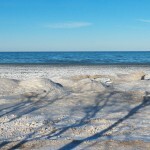 Lots of snow on the ground and temps in the single digits when I woke up this morning. 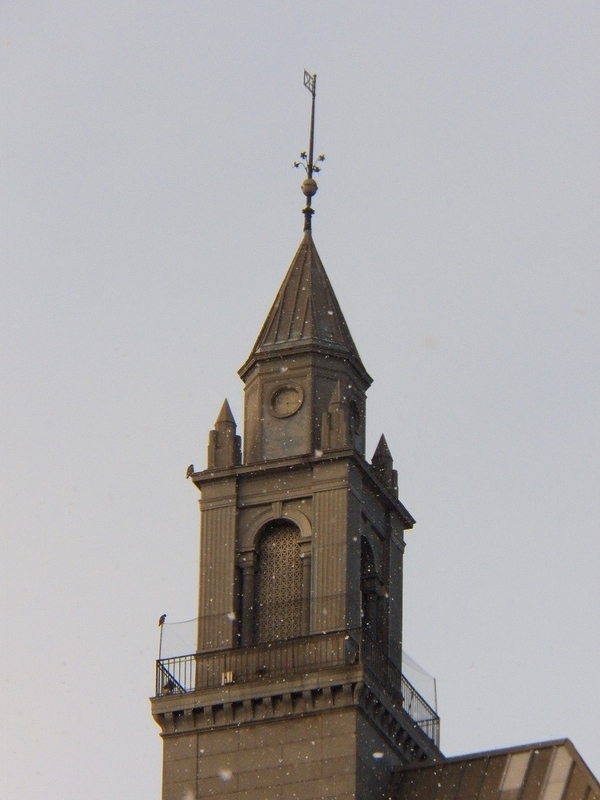 Today I started my watch at noon and ended it at 2:00 pm. 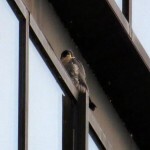 My first stop was the Kodak Park West location. 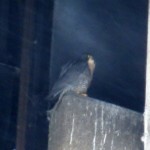 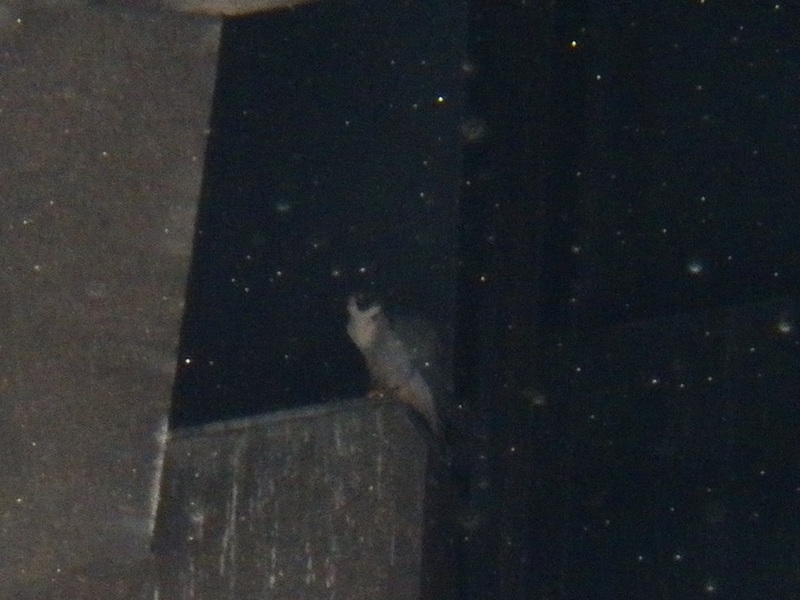 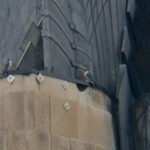 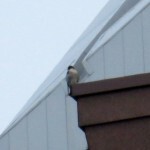 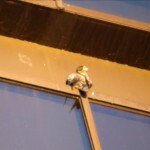 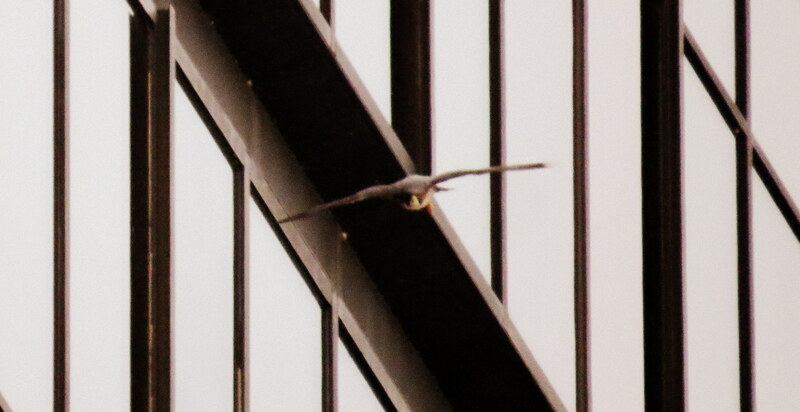 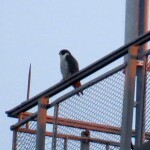 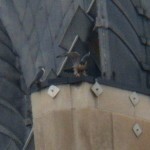 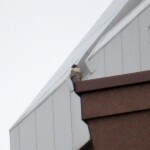 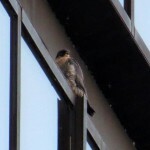 I found a falcon on the lower catwalk of the west stack on the north side. 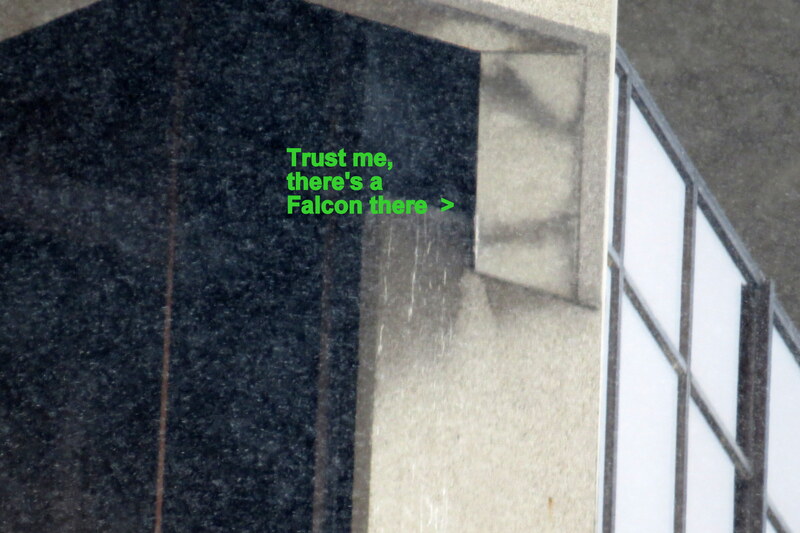 I remained there for about a 1/2 hour, hoping to see the falcon fly and possibly come a little closer. 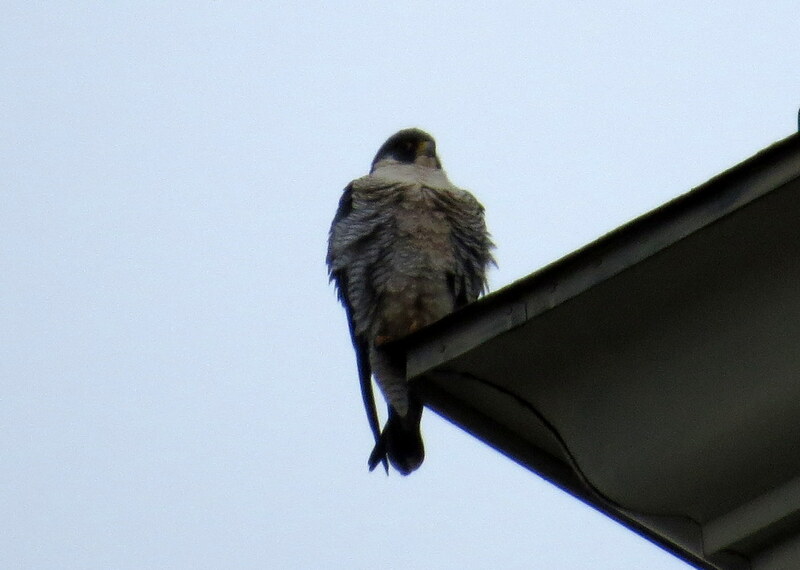 I would love to ID this falcon. 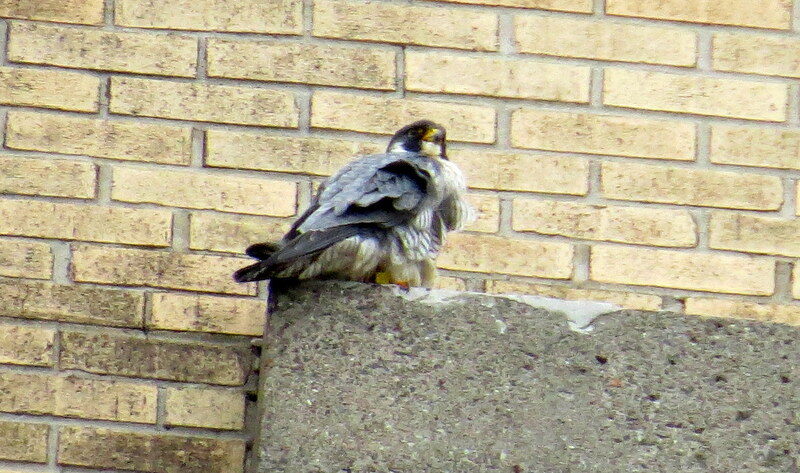 Was it a winter visitor or was one of our local falcons using this area for hunting? 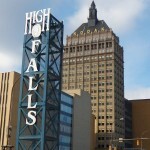 My next stop was downtown, which was extremely busy. 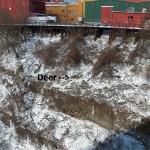 I found a spot down on Aqueduct St. (aka “the hole”). 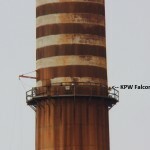 From there I could see one falcon on the south side of OCSR on the top IBeam. 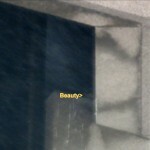 After checking my pics, I believe this was Beauty. 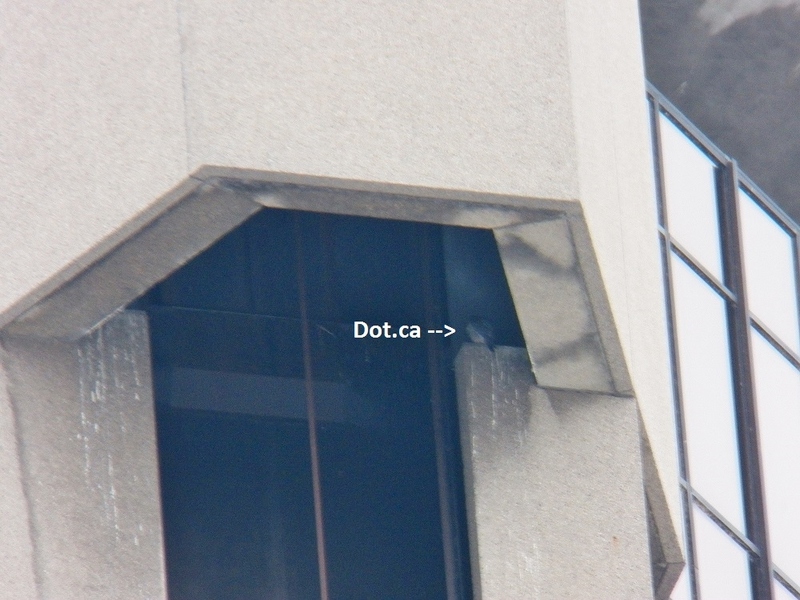 Dot.ca was up inside the elevator shaft on the south ledge. 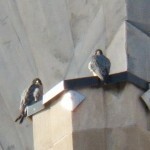 It was bitter cold, with very bright sunshine, which made it very hard to ID the falcons while I was there. 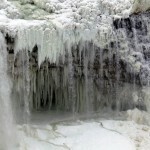 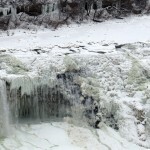 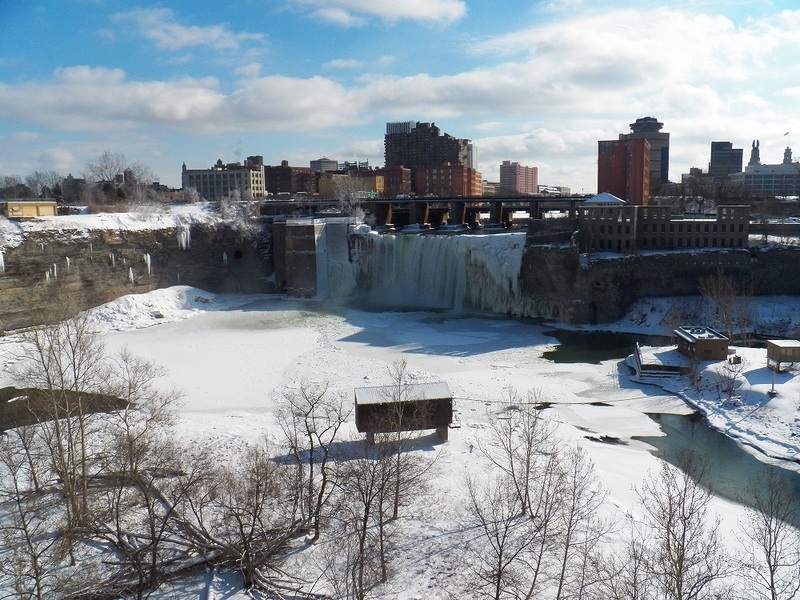 They seemed to be settled in their spots, so I drove over to the Genesee Brewery to check out the High Falls area. 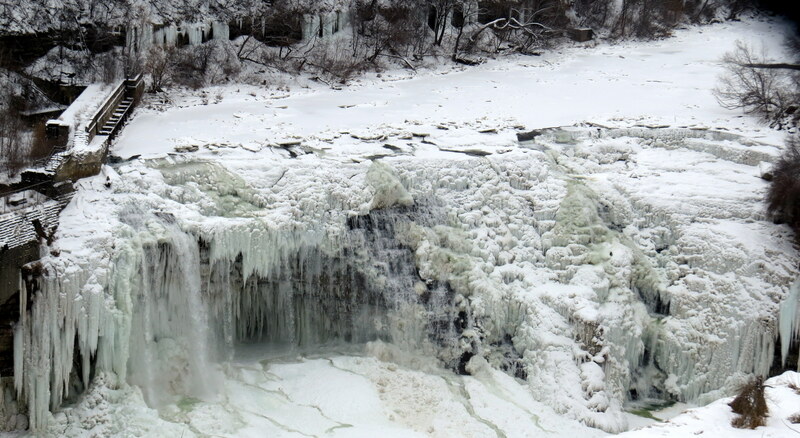 The falls, river and surrounding area was beautiful in the bright sunlight. 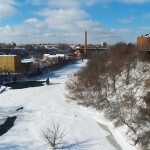 The river is mostly covered in ice. 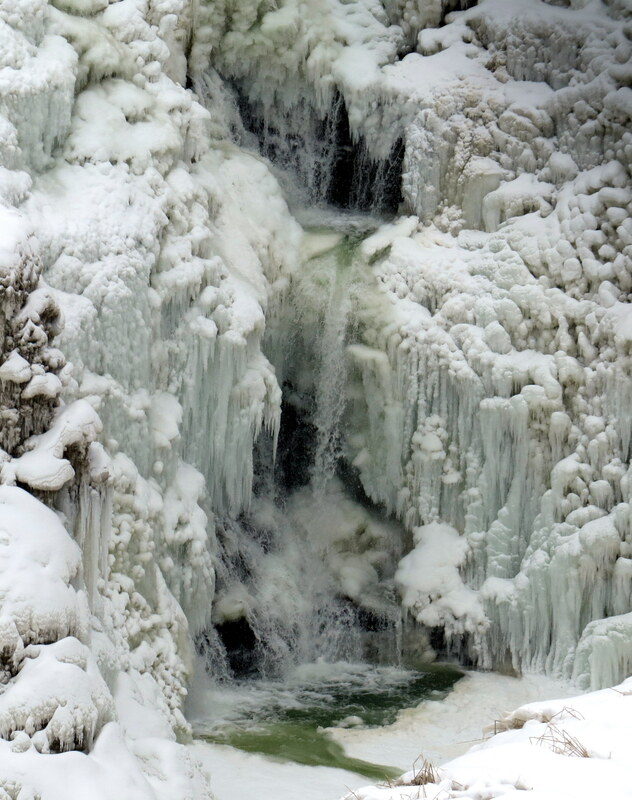 I was amazed to see all the animal tracks crossing the frozen river. 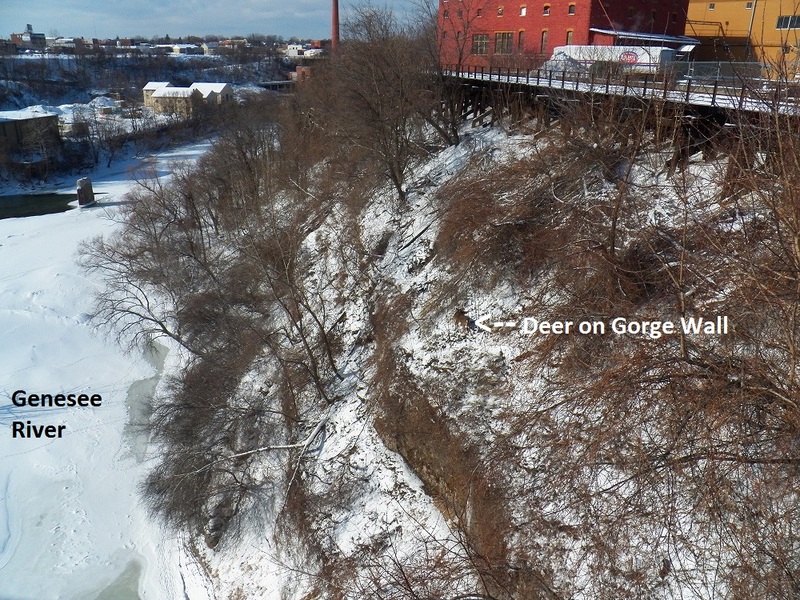 On my way back to my car, I spotted a deer on the gorge wall below the Genesee Brewery. 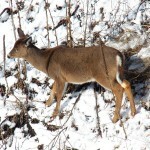 She was high above the frozen river foraging for food on the snow covered ground. 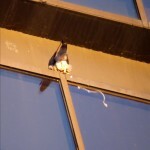 Yikes! 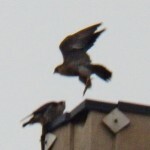 I was truly amazed to see how sure footed she was. 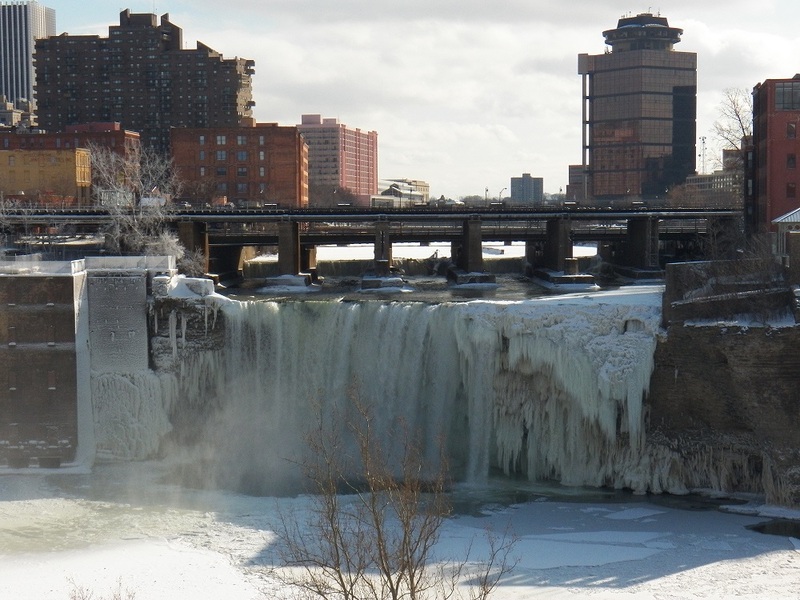 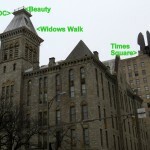 After leaving the High Falls, I checked Hawkeye, Seneca Towers and Russell Station. 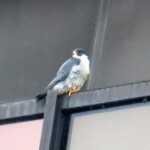 I found no falcons at any of these locations. 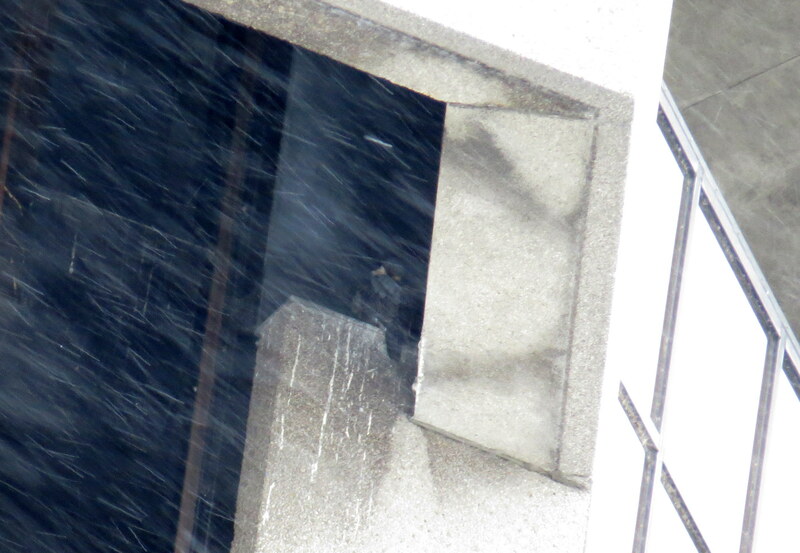 Hope everyone is keeping warm! 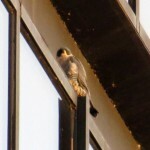 After finding no falcons in the OCSR elevator shaft I was greeted at the intersection of Broad St. and Exchange Blvd. 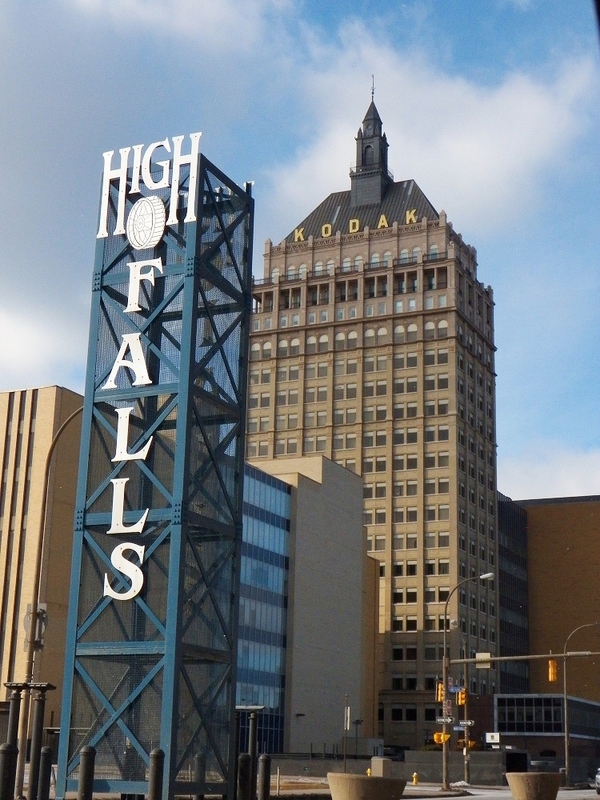 by police cars and officers placing cones all around the area for an event at the Blue Cross Arena. 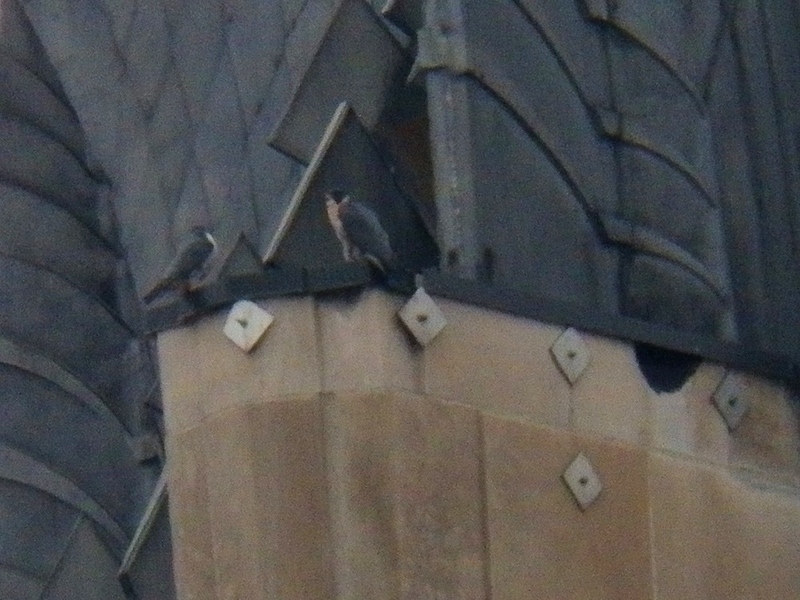 With no falcons seen from there I then went to the east side and came up empty there as well. 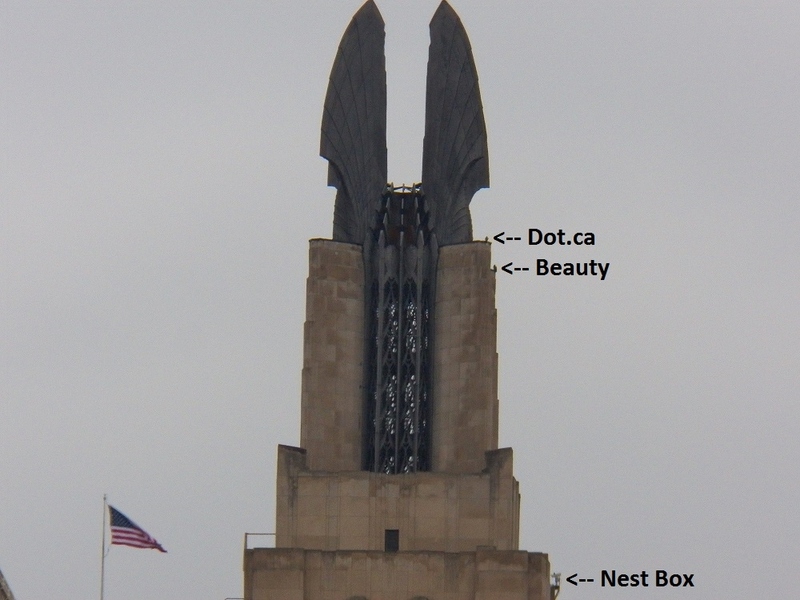 I made my way over to the Andrews St. bridge where I spotted Beauty on the south side arch of the Kodak Office tower (KO), so I drove down State St. stopping below KO. 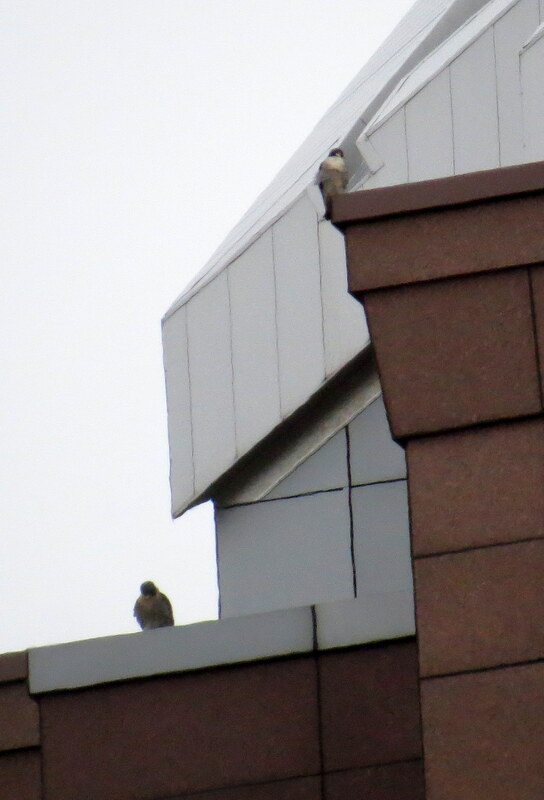 Beauty was watching something below very intently-I thought perhaps a pigeon was trying to hide from her by the Kodak letters on the buildings roof. 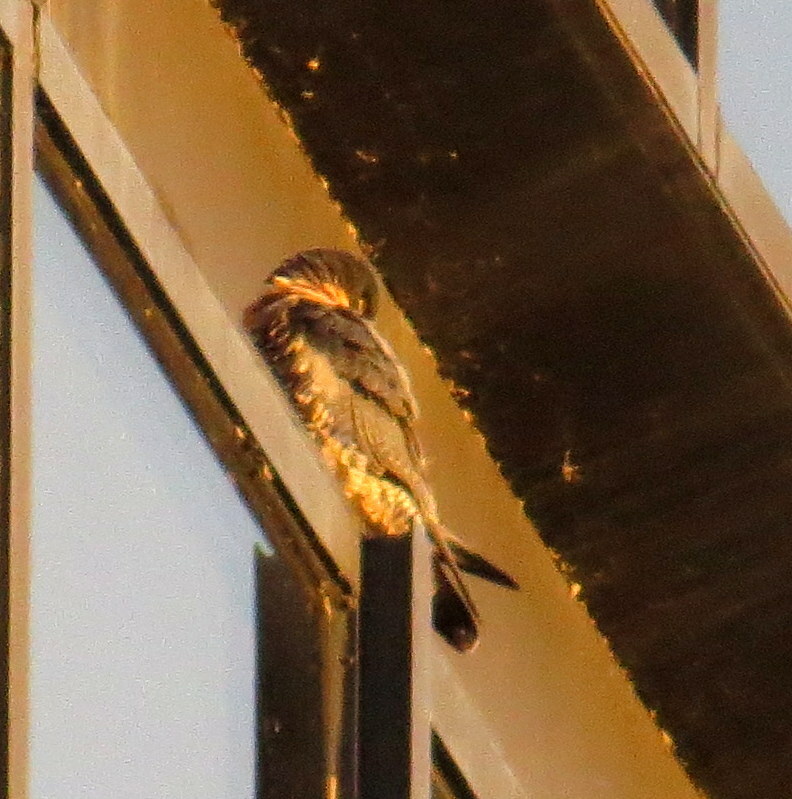 She was bobbing her head like crazy trying to focus in on whatever it was and I thought she would take off after it but she settled down to do a little preening. 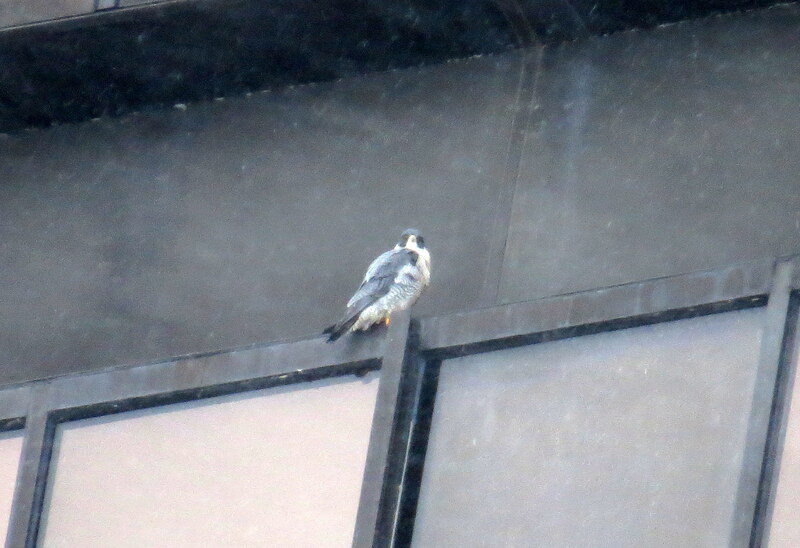 At 8:30am the Beautyful one must have seen Dot.ca (DC) go into the elevator shaft for she flew off heading toward OCSR to the south. 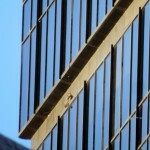 I followed behind, going to Bragdon Place first to check the south side elevator ledge. 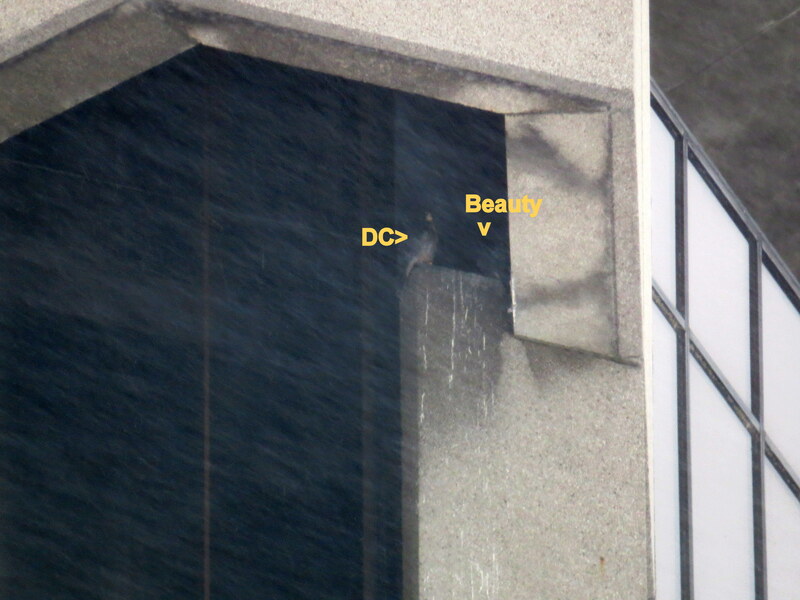 I believe it was DC because of the white I was seeing but it could have been Beauty too. 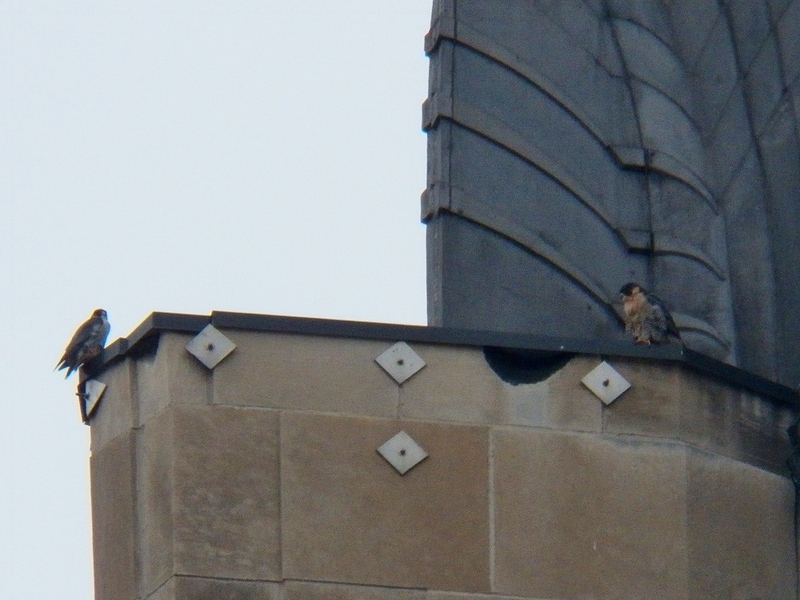 I then went to the Radisson Hotel near Main St. to check the north side ledge and way in with their back to me was the other half of our downtown pair. 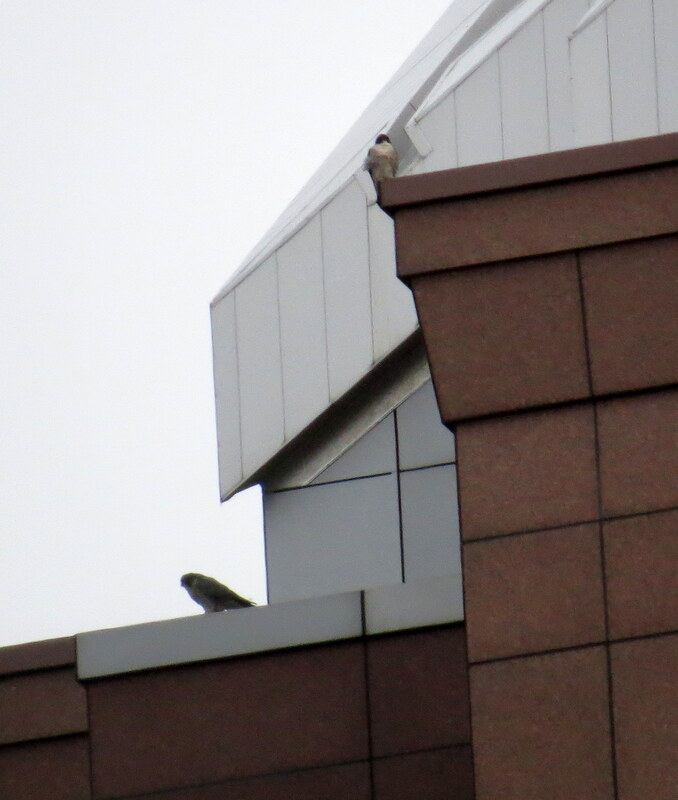 There was no way to tell who was on that ledge but the important thing is I saw both of our downtown Rochester Peregrine Falcons on watch this morning. 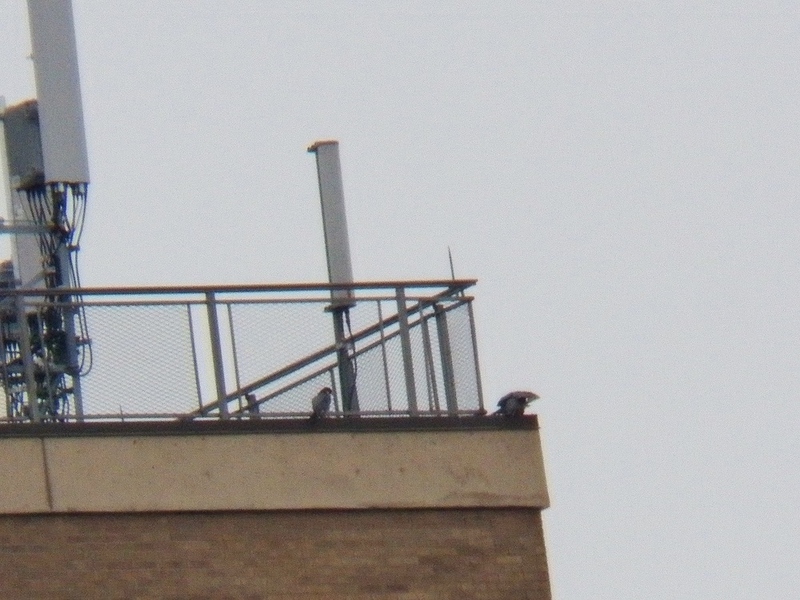 I ended my watch at 9am as it was obvious they were down for the count. 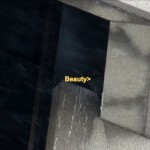 Keep smiling! 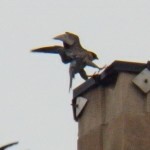 FYI-I recently wrote a letter to the owner/s of Seneca Towers asking if they would consider allowing the placement of a nest box on the roof for Billie and 99. 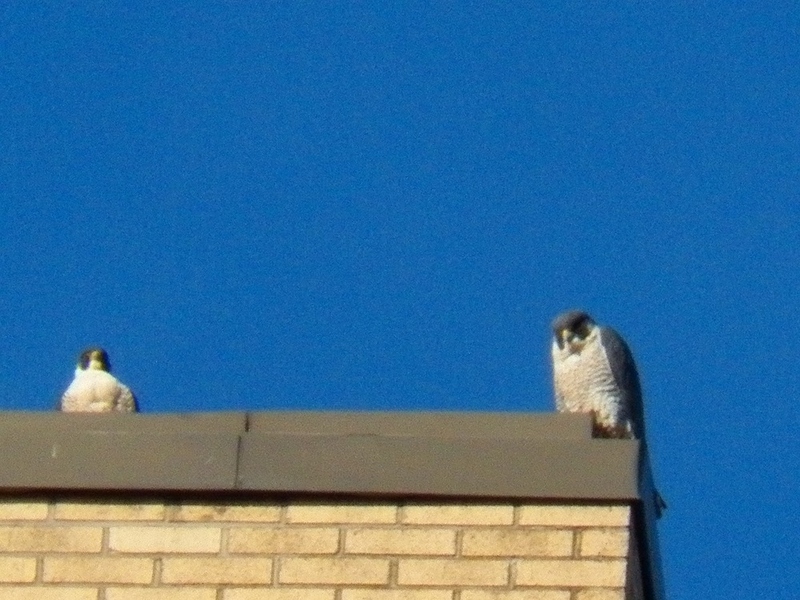 I received a response from them stating they cannot entertain my request but they would alert their staff to not disturb the falcons if they nest on the roof. 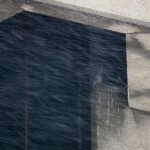 We got 3-4 inches of snow overnight and it’s still snowing lightly as I write this report. 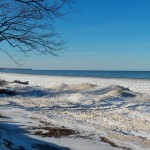 The temperature when I left for my morning watch was 29 (F) -2 (C) it dropped 6 degrees while I was out and there was a strong wind out of the north. 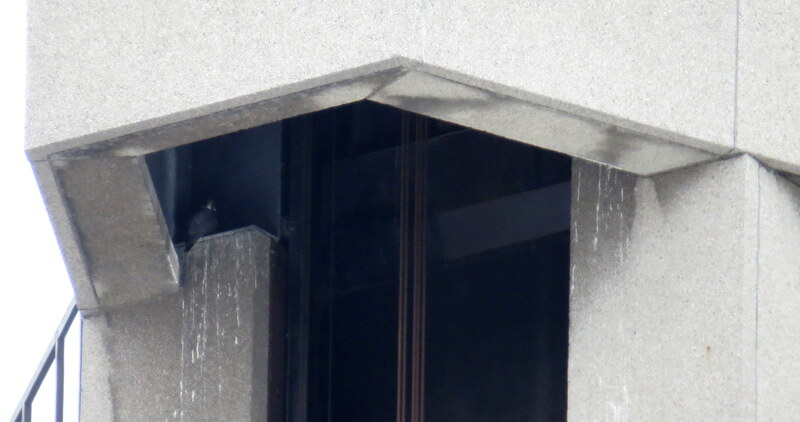 It wasn’t much of a watch today as Beauty and Dot.ca (DC) were hunkered down in the OCSR elevator shaft for the most part. 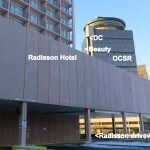 When I first arrived parking by the Radisson Hotel near Main St. 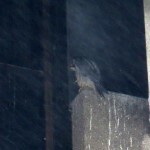 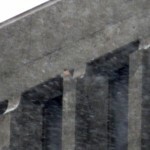 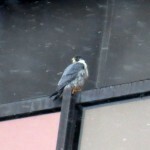 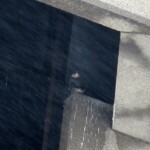 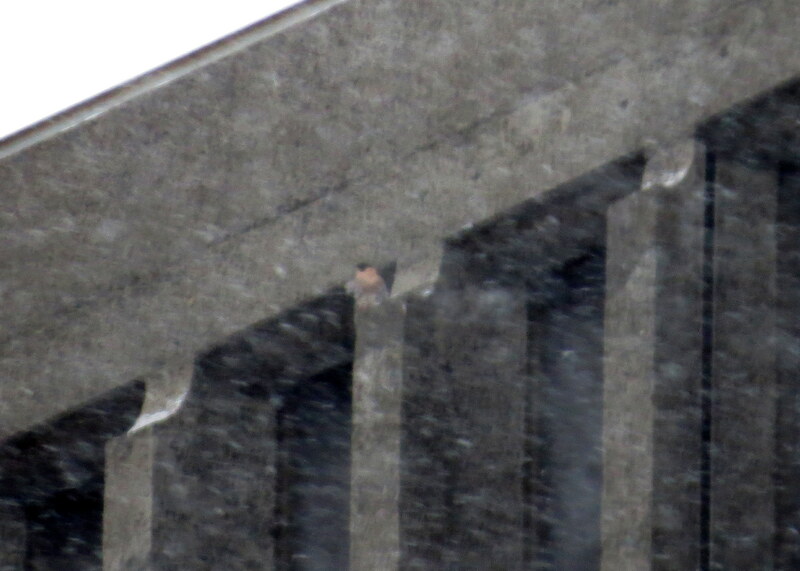 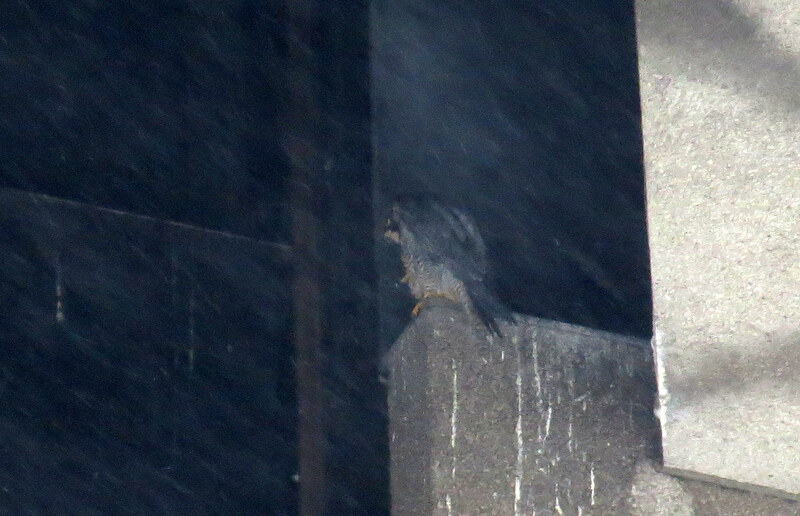 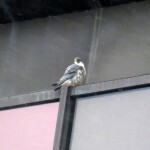 I saw one falcon and wasn’t sure if I was seeing a 2nd falcon tucked back in on the north ledge because it was snowing too hard to see clearly. 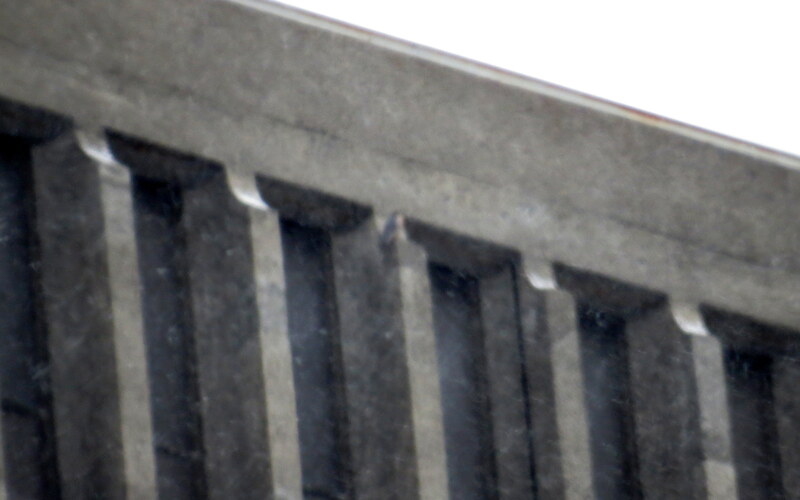 Finally I got a good look and could identify DC on the end of the ledge and Beauty tucked in on the same ledge. 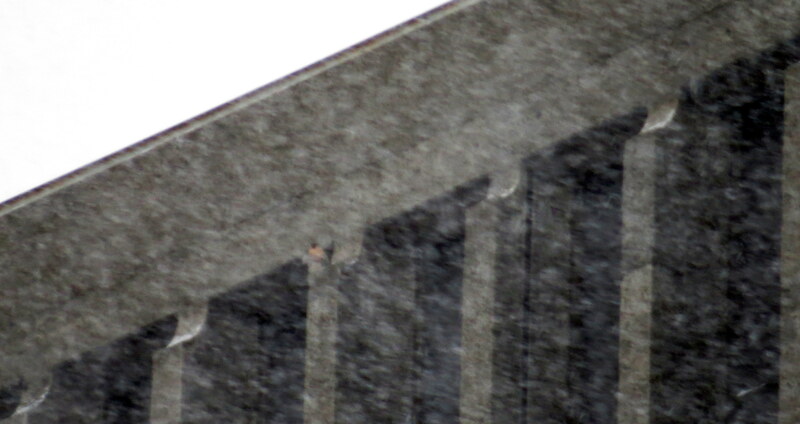 My camera was having lots of trouble focusing on anything but the snow so there is no snippet movie today and very few pics. 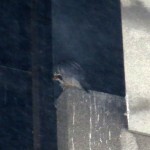 I was able to see through my binoculars that the Beautyful one was eating as DC watched. 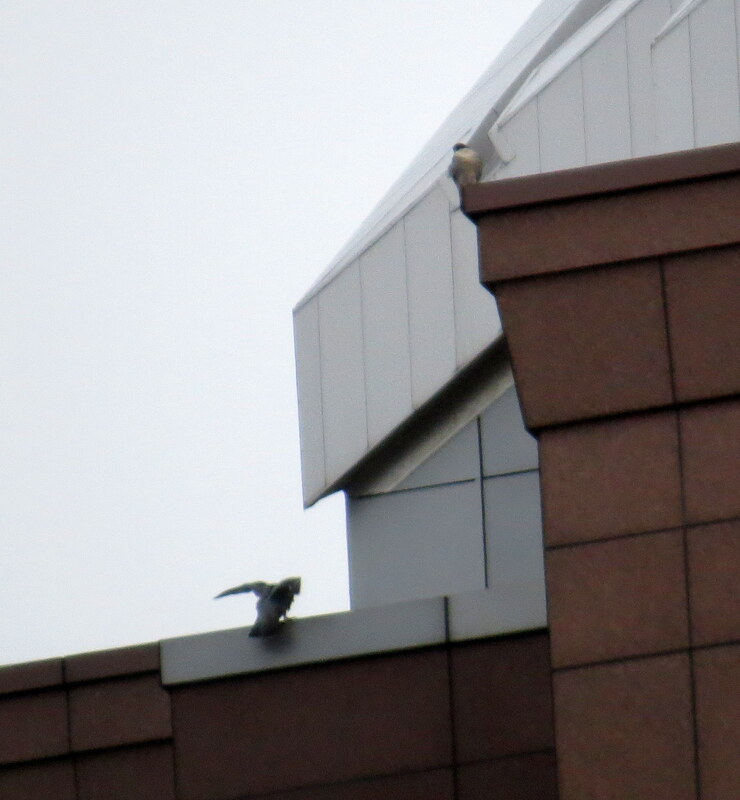 He made 2 attempts to grab it from her then he flew out and over to the top ibeam southeast side of OCSR. 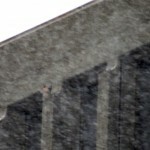 The snow had lightened up and with his bright whiteness there was no missing DC up there. Beauty came out from the depths of the ledge after she was done eating and with her back to me started cleaning herself up. 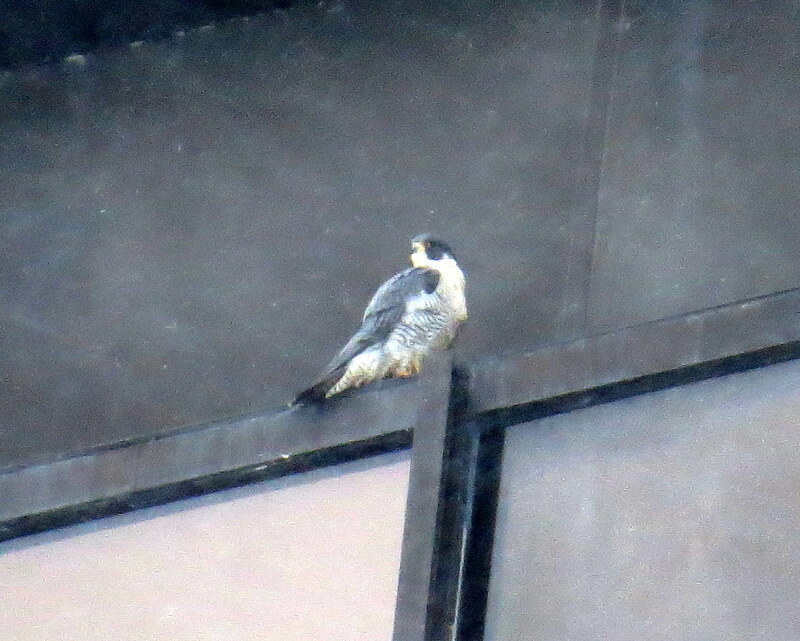 Somehow without me seeing him, DC managed to fly back into the elevator shaft going to the south side across from his mate. 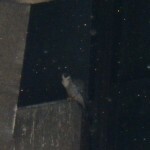 I didn’t know where he was until I drove down to Bragdon Place where I could see that side of the elevator shaft. 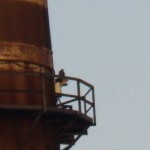 Always the sneaky one! 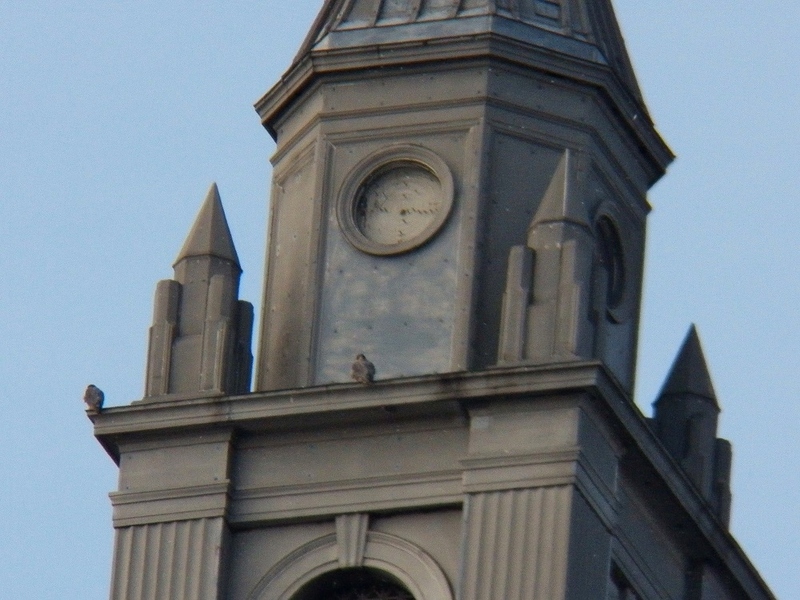 I ended my watch at this point as I didn’t think there would be much going on with these two. 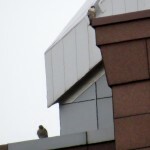 It was a sweet little watch with our dynamic duo that sent me off with a smile at 9am! 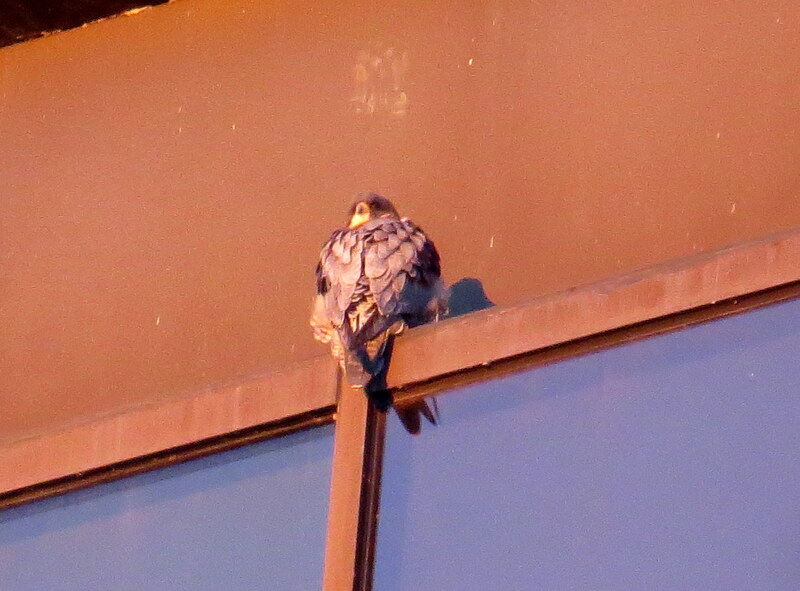 After starting the day with that spectacular sunrise I got to see both Billie and 99 on the northwest corner -she was on the roof and he was above her on the railing. 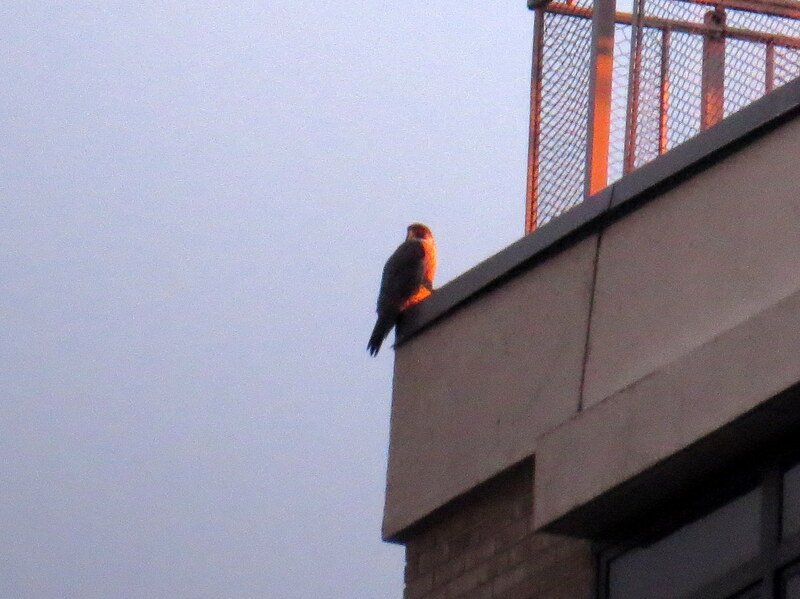 The sun left us after a couple minutes and it was back to gloomy skies. 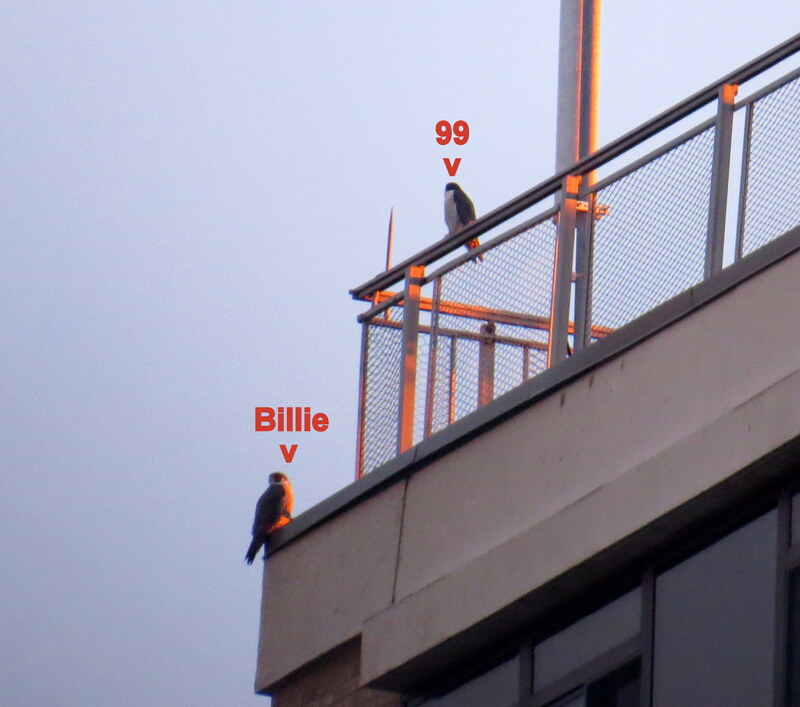 Buffalo Billie and 99 were looking to grab some breakfast on the fly as they took off to the south with 99 leading the way as Billie watched then joined him. 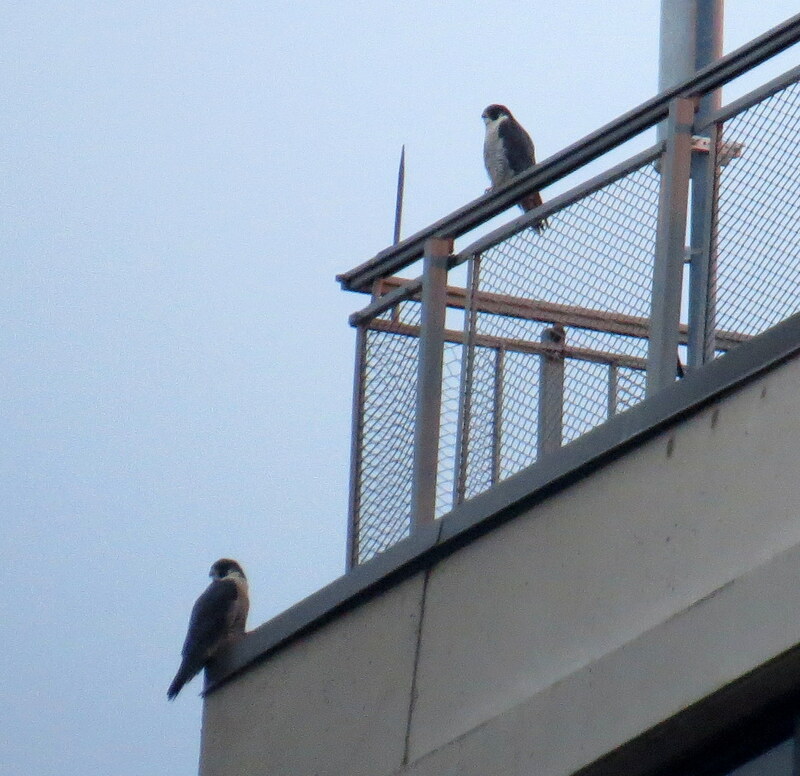 They didn’t return in the few minutes that I waited for them. 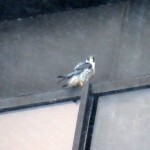 I moved on to downtown and from the Broad St. Bridge (BSB) I spotted a falcon, whom I believe was Beauty, on one of the northwest corners of Bausch & Lomb (B&L) eating with her back to me. I took a chance by deciding to go up on the South Ave. garage roof for closer viewing but as luck would have it when I got up there she was gone. 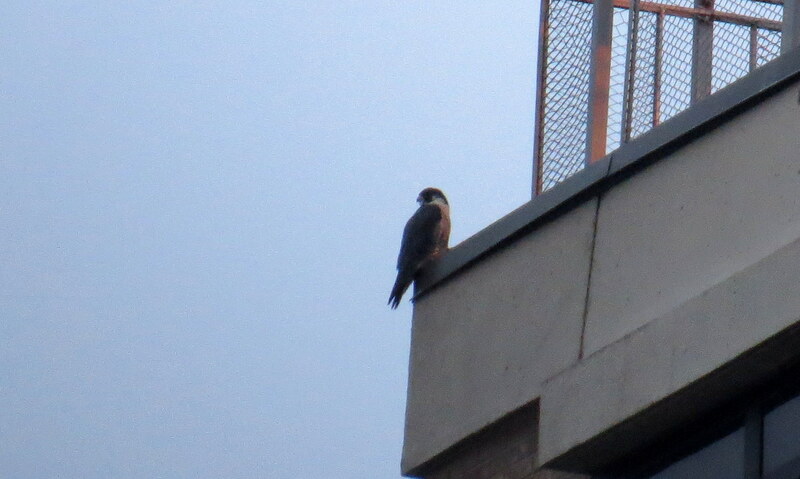 After a look around on the east side of the river I went to check the elevator shaft of OCSR from Bragdon Place. 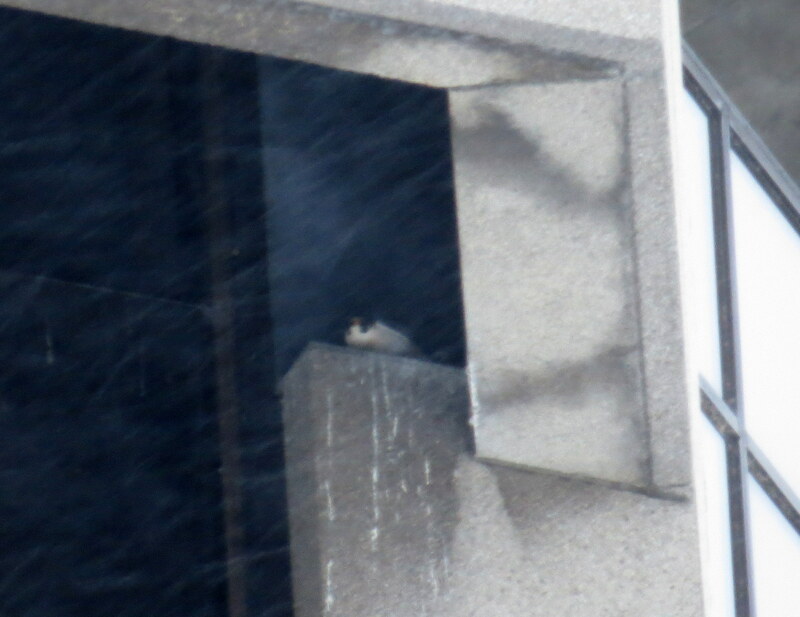 Lo and behold Dot.ca (DC) was up on the south side ledge in the same spot and positioned the same way as when I left him yesterday. 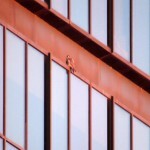 He’s so predictable! 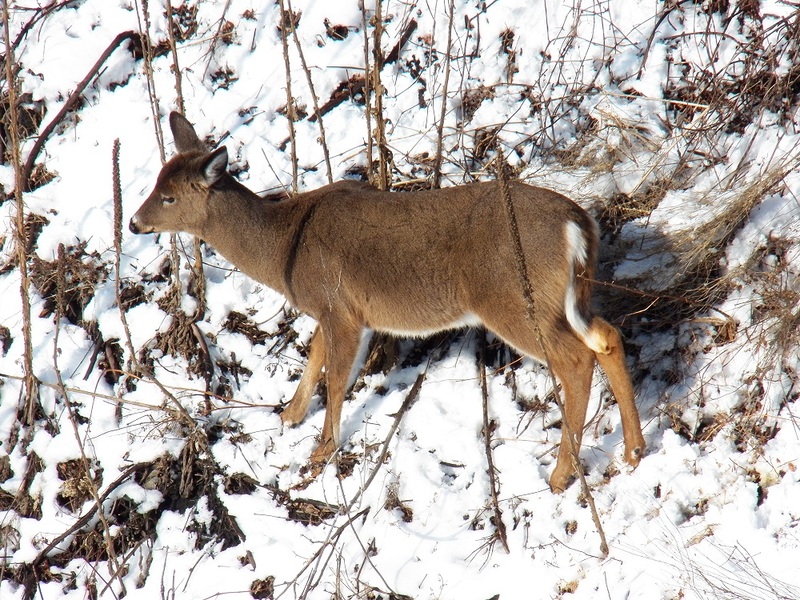 I left the boy to nap in his man cave with food in his crop as I went out in search of the Beautyful one. 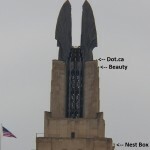 I didn’t have to go far-as I was pulled over on the Andrews St. bridge I spotted Beauty on the top ibeam northwest side of OCSR. 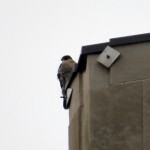 Of course her back was to me as I pulled over on State St. across from the Rochester Plaza Hotel to share space with her. 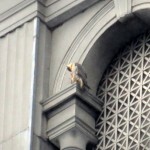 Beauty looked like she had food in her crop too so I imagine they both ate up on B&L before I got downtown this morning. 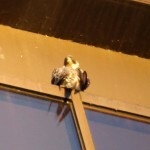 Beauty was also napping at times with her head tucked in behind her shoulder then she would preen a little and so forth. 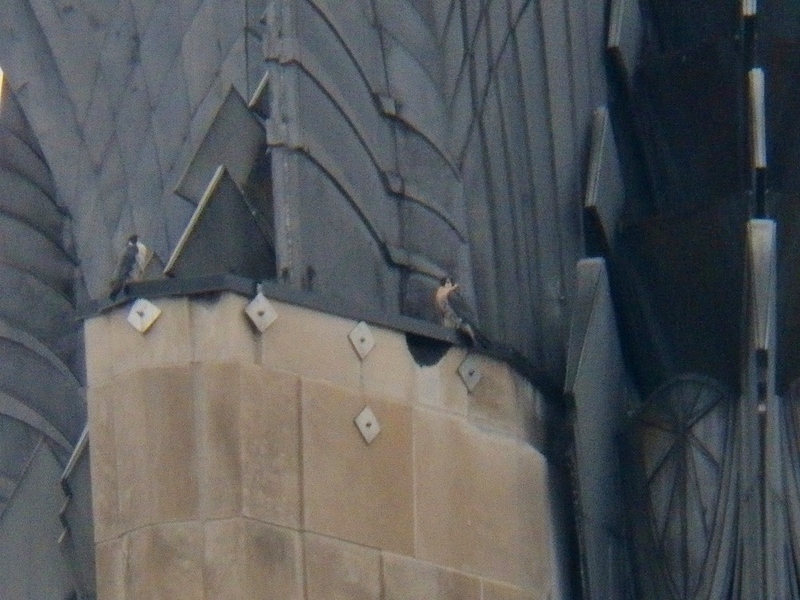 I decided to leave them to it at 9:10am and end my watch-Beauty left me with this parting shot. 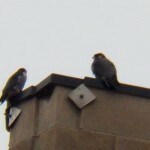 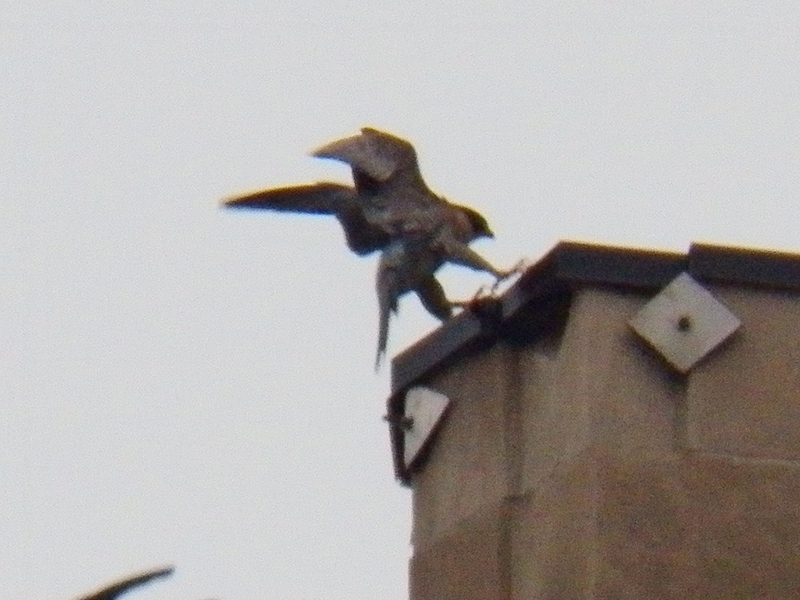 Now after that and seeing all 4 Rochester Peregrine Falcons how could I leave without smiling! 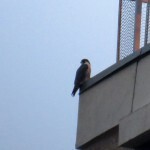 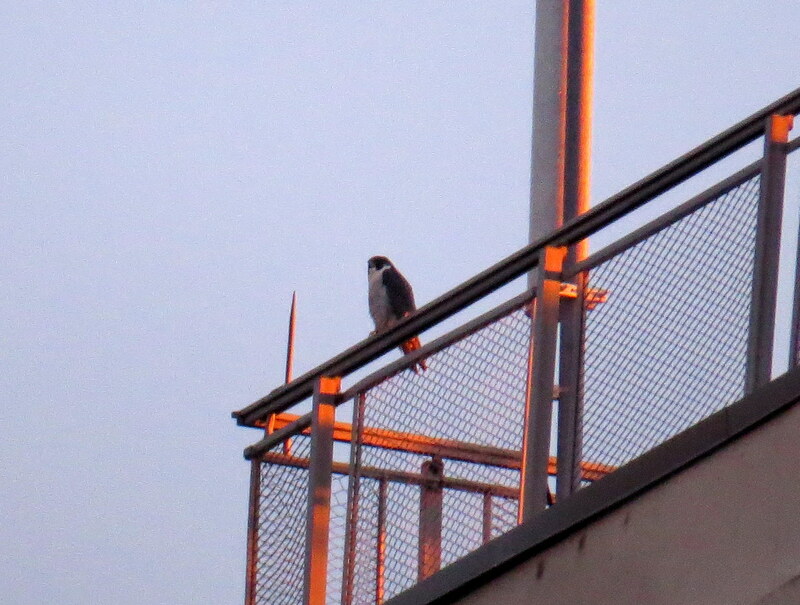 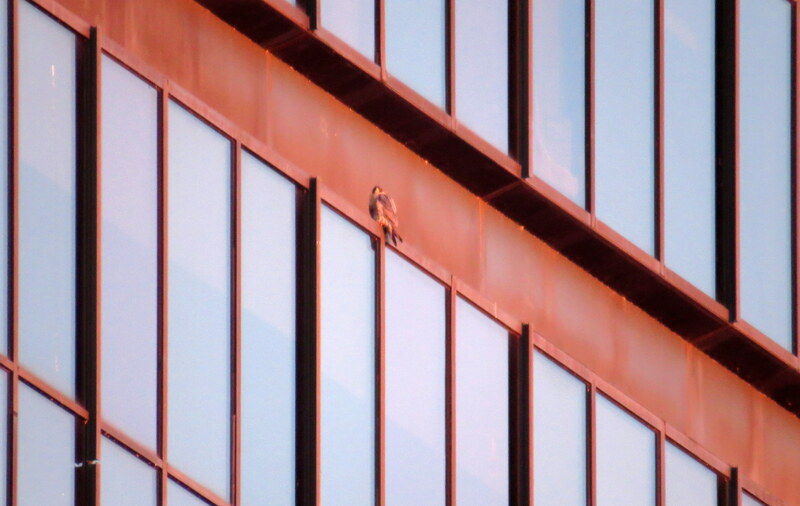 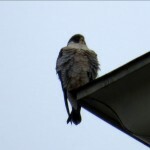 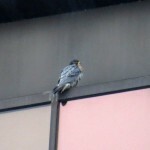 I didn’t see any falcons at Seneca Towers this morning when I left or when I returned home from my downtown watch. 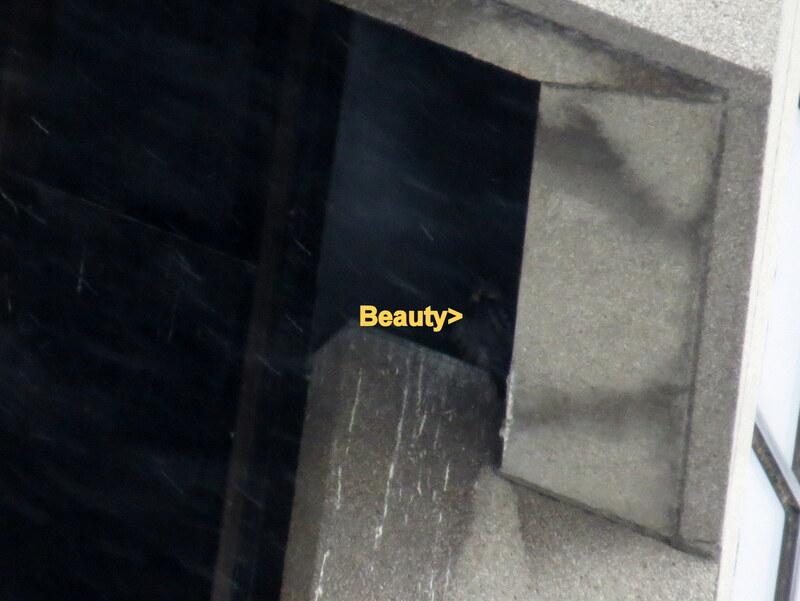 I found Beauty on the top ibeam southeast side of OCSR from the Broad St. bridge after checking the OCSR elevator shaft and finding nobody up in there. I first went to Bank Place and Aqueduct St. in the hole to check her out. 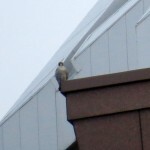 When she turned her back to me I went over to the Radisson Hotel by Main St. for a better angle on the Beautyful one. 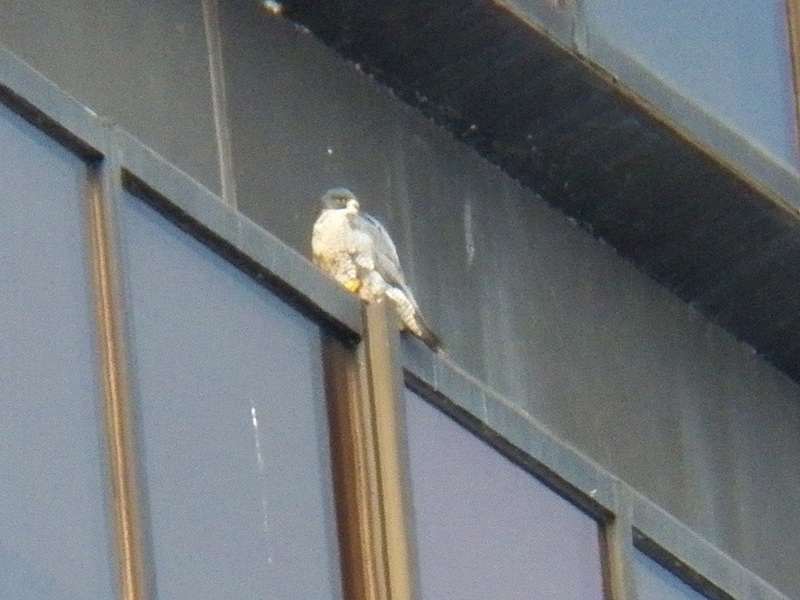 I expected Beauty to take off after that but she had other ideas, as in preening and pulling little white down feathers from herself. 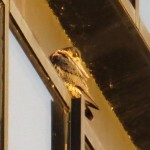 This went on for most of the rest of my watch as she was really doing a bang up job of preening in the sweet sunshine. 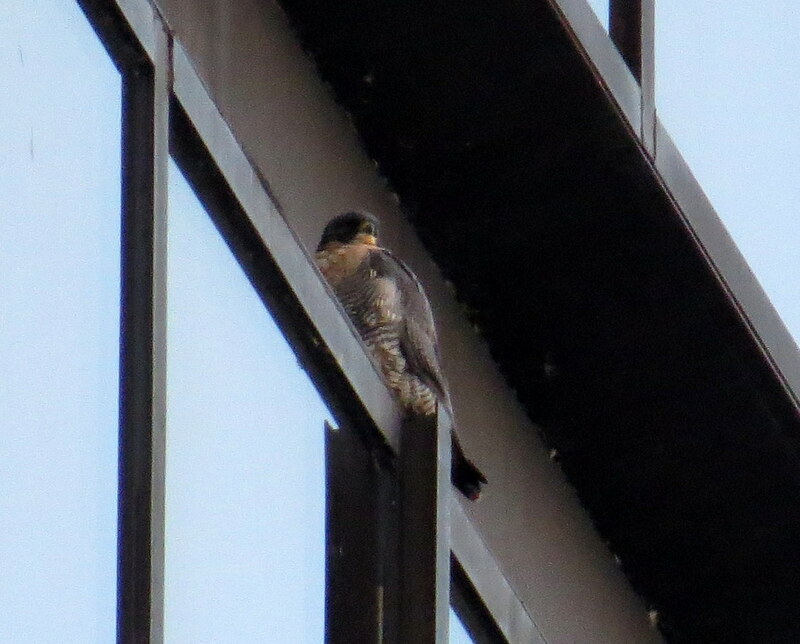 Around 8am I decided to look for Dot.ca (DC) and I didn’t have to go too far. 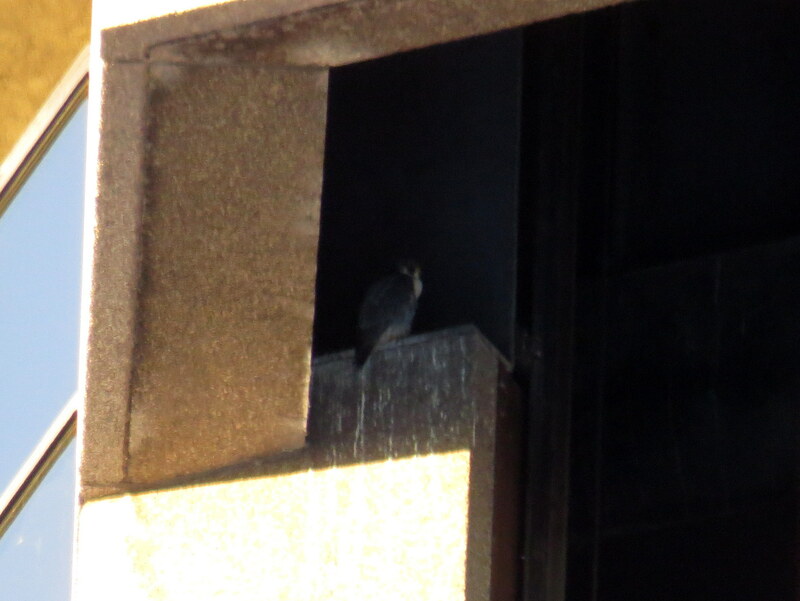 I checked the north side ledge of the OCSR elevator shaft first, then down to Bragdon Place to check the north side ledge where I found him. 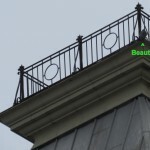 I had to park up the hill further than I usually do to keep track of Beauty over on the top ibeam as well. 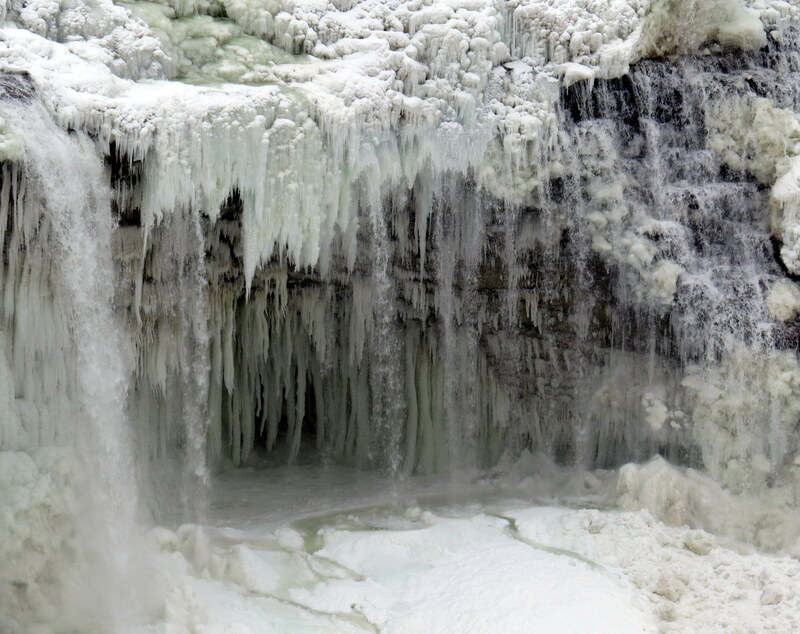 The cold temperatures really messed with my camera today making it hard to stay focused so not too many pics good enough to post but that’s ok you get the picture right!? 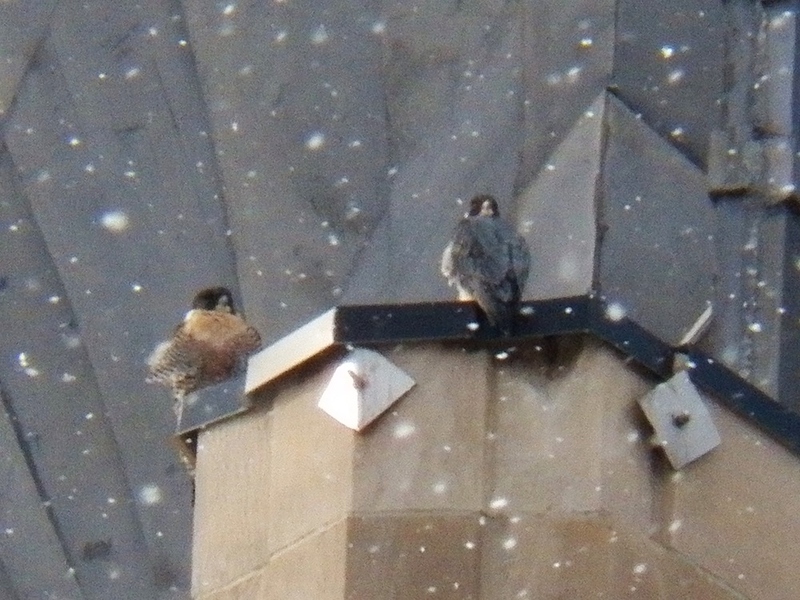 lol I left them to resting and preening as my feet were frozen thus ending my watch early at around 8:45am, but I was still smiling as I drove off! 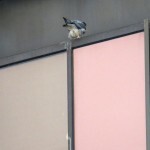 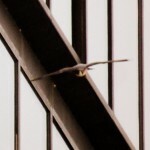 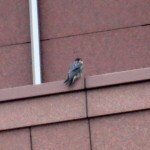 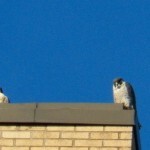 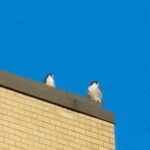 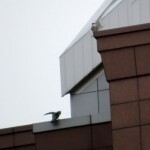 As I made my u-turn on Seth Green Drive to face Seneca Towers I spotted falcons on the south end of the building. 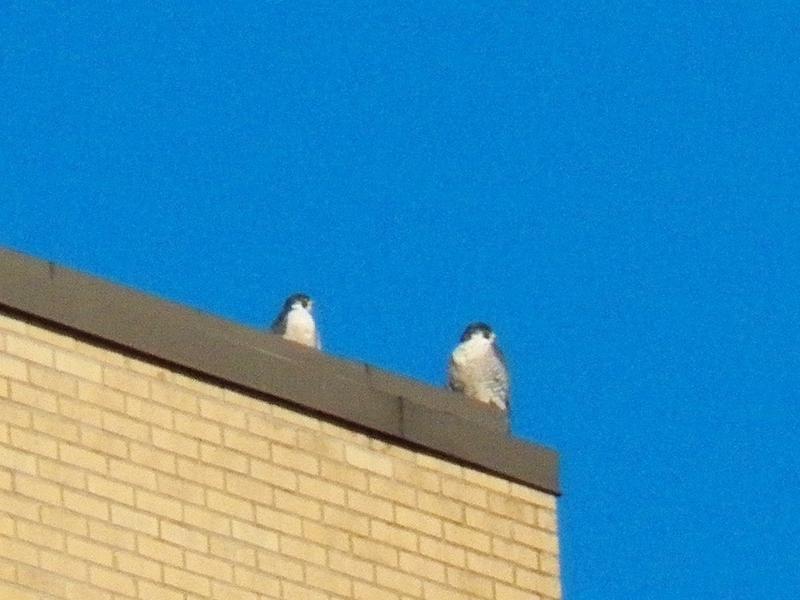 I went back to my parking lot and as I stopped the car they left-1 from the top window ledge and the other from the southwest corner. 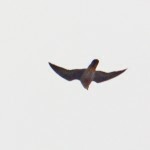 They headed up river to the south and didn’t return. 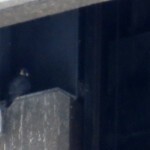 Off to downtown I went, where I found Dot.ca (DC) on the north side ledge of the OCSR elevator shaft from the south side of the Radisson Hotel. 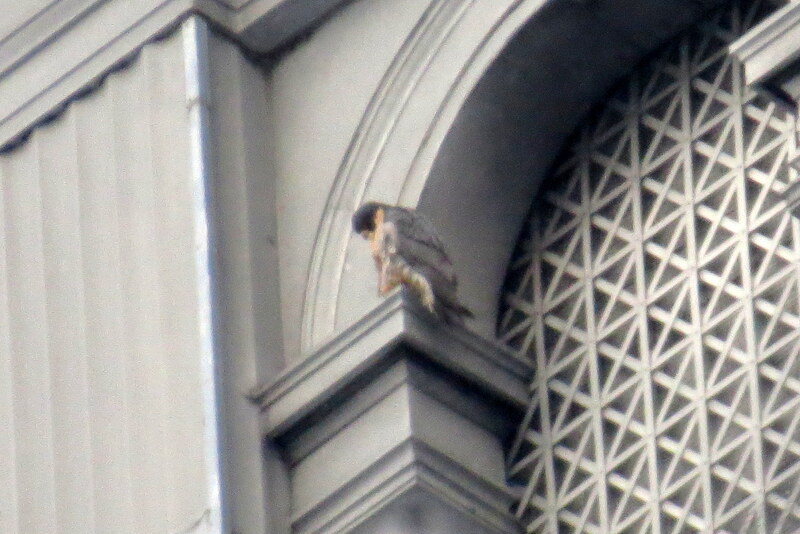 I watched DC for only a few minutes after he moved to the back of the ledge and turned his back to me. 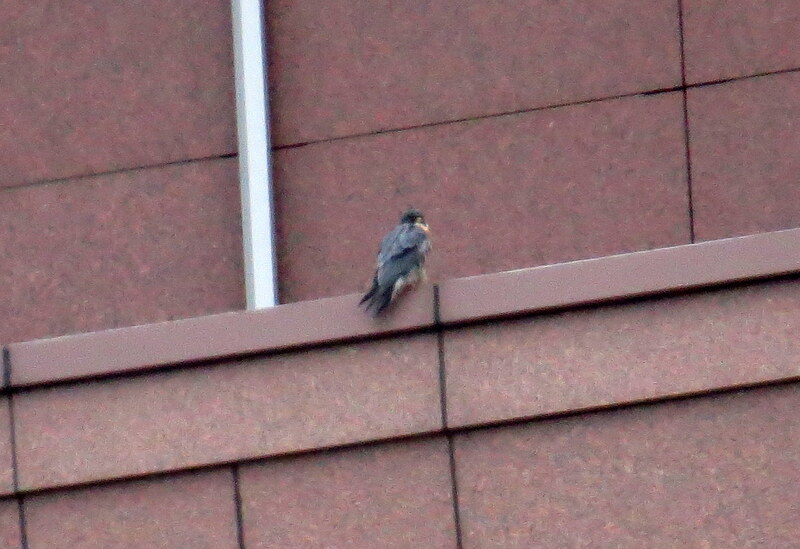 I then checked the south side ledge from the north side of the hotel for Beauty, but she wasn’t there. 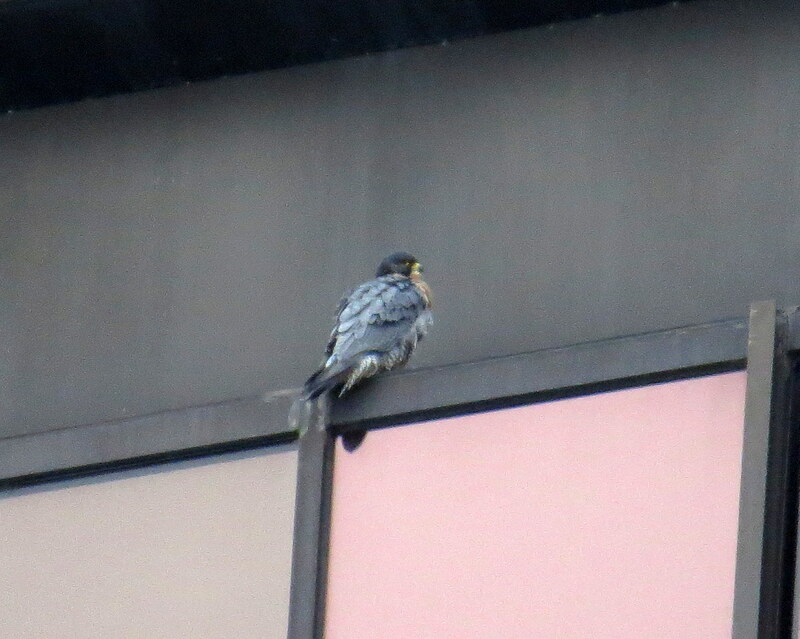 It wasn’t until 8:30am that I found the Beautyful one on Xerox from Woodbury Blvd.-she was on the 6th south side column over from the southeast corner. 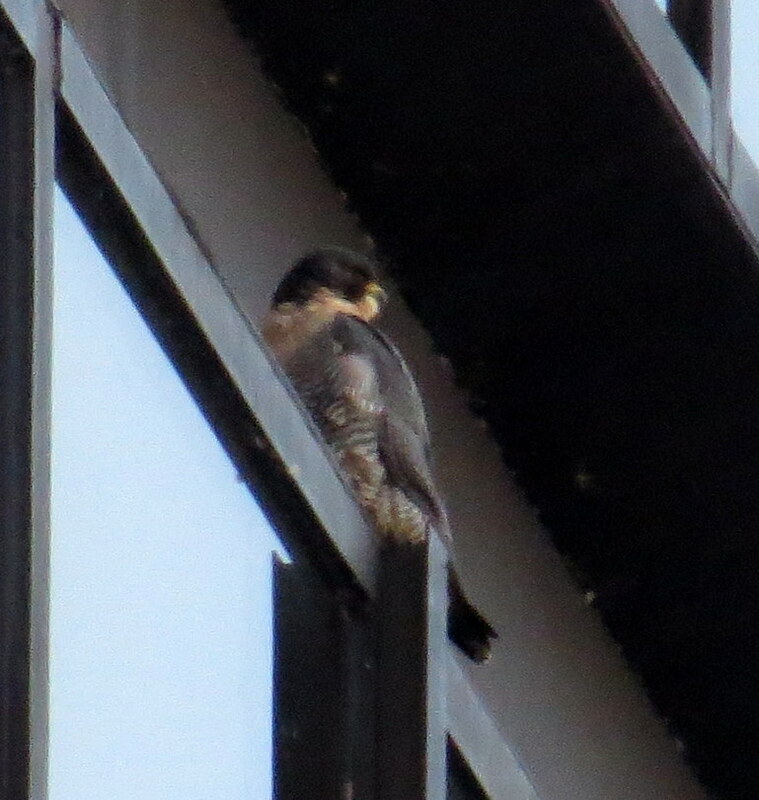 I drove over to Chestnut St. by Martin Luther King Jr. park to get a better look at her as she was looking for a meal to fly into her space. 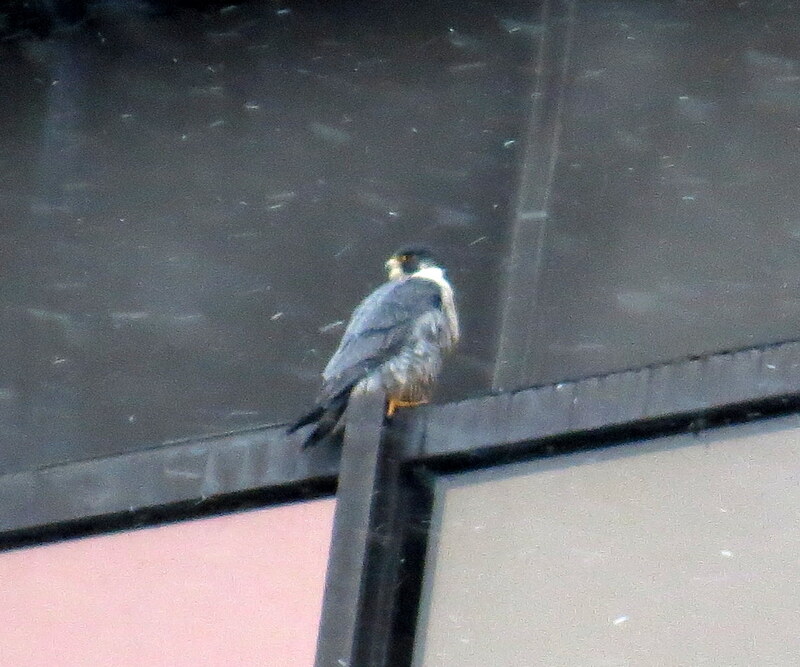 Beauty also did some preening as the snow fell on her like it was just business as usual, which for her, it is! 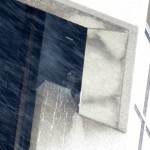 As I was tweeting about her nonchalant demeanor with the cold and snow she left the building. 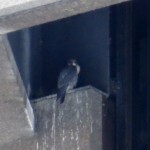 I left and had a look around for her, stopping for coffee on my rounds before checking the elevator shaft for DC again. 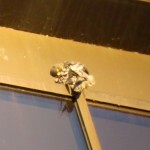 He was still up there and tucked in further than when I left him earlier. 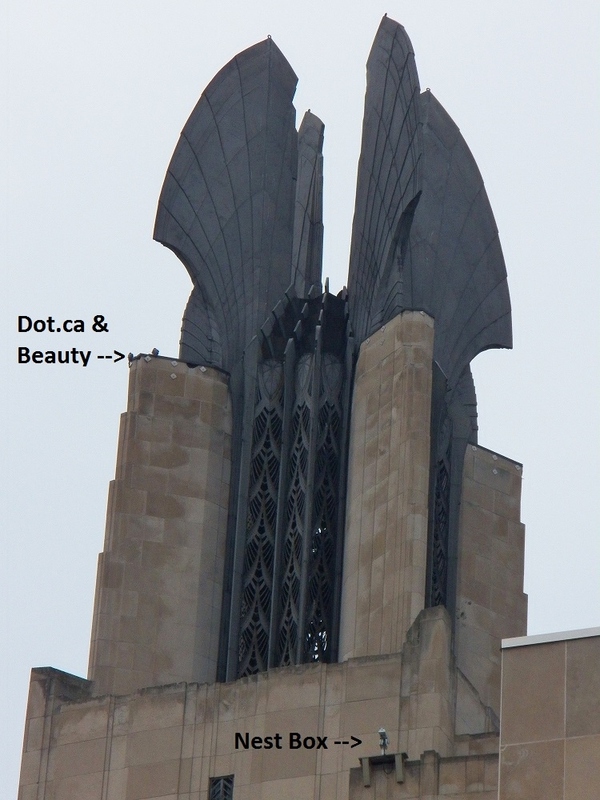 I then went to the Andrews St. bridge where I spotted Beauty over on the south side arch of Kodak Office. 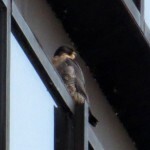 I drove down to State St. and parked below her to share space with her for a few minutes. 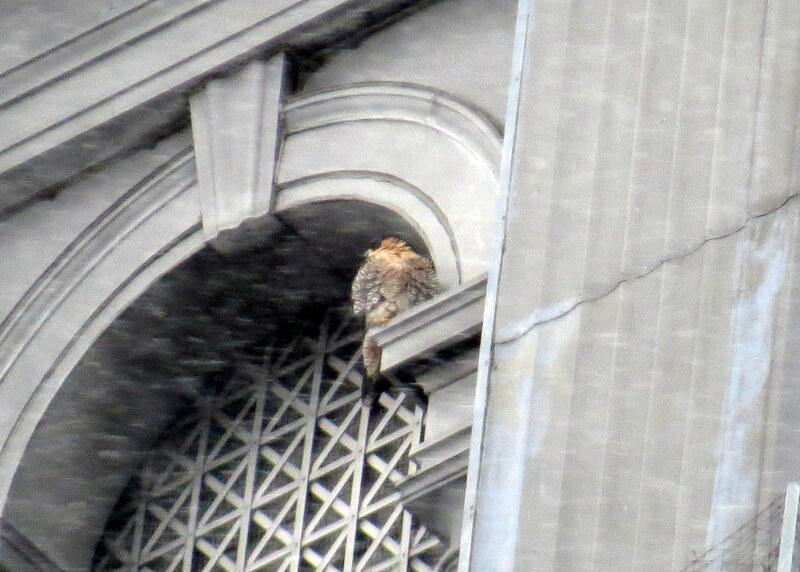 Beauty was all foofed up to stay warm as the northerly wind blew up her feathers. 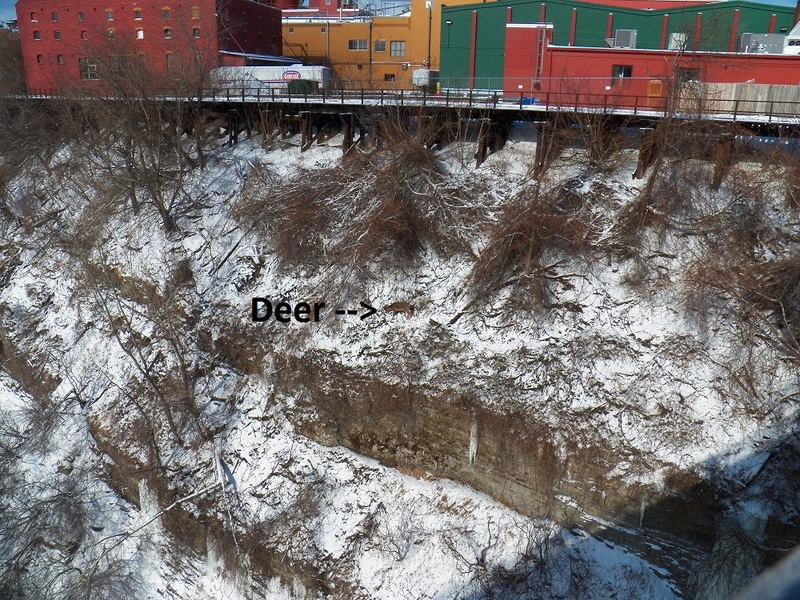 I left her there at 9:15am and ended my watch after stopping by the Lower Falls below the Driving Park bridge on my way home. 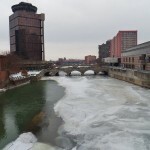 They were mostly frozen but the river was still flowing down over the ice in spots. 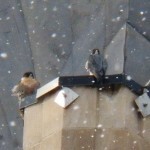 After seeing all 4 Rochester Peregrine Falcons and a lovely scene of frozen water falls how could I not be smiling!? 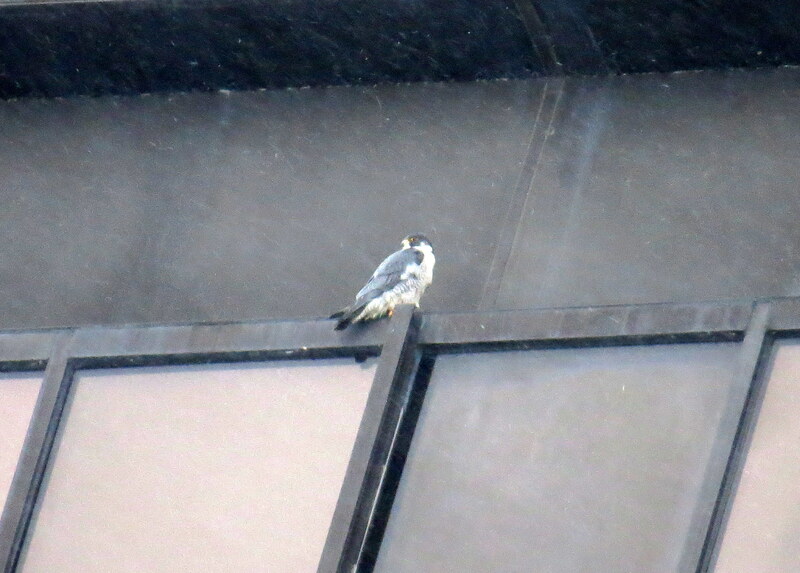 No falcons at Seneca Towers when I left this morning but when I got home 99 was on the south end top window ledge with a full crop. 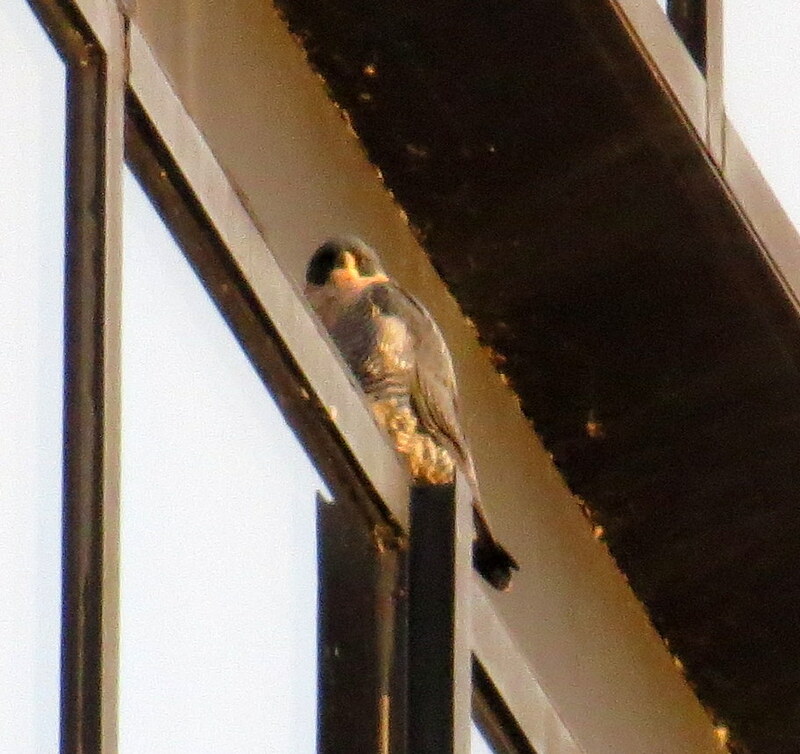 I had to go take care of some business and when I got home at about 2pm both Billie and 99 were on the same windows at each end facing each other. 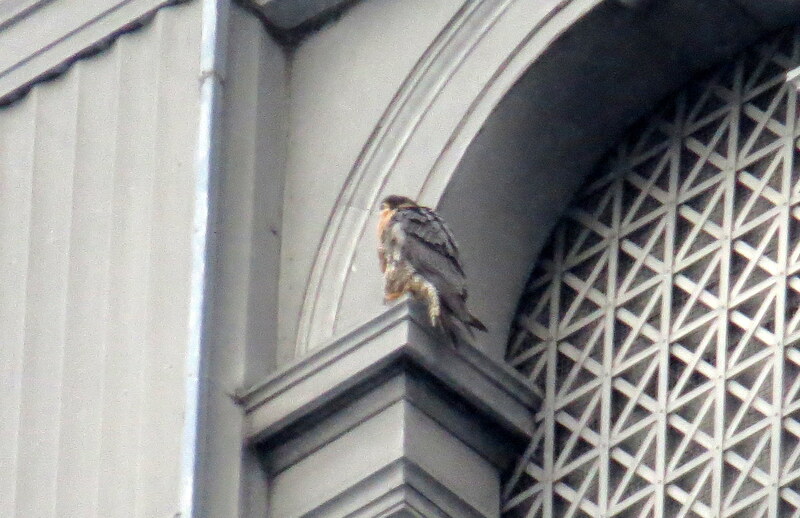 I had no camera with me at that time but I got a couple pics of 99 from earlier. 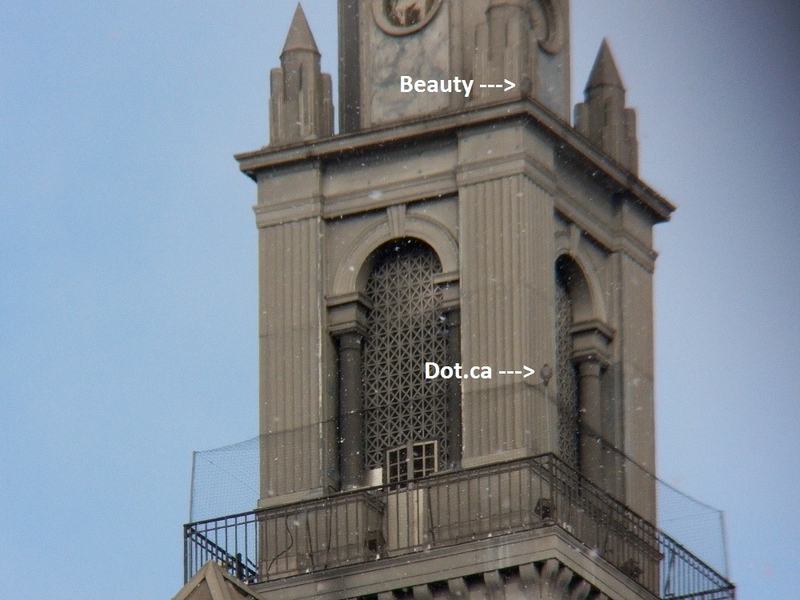 On to the downtown part of my watch-I didn’t find Beauty and Dot.ca (DC) until 8:30am as I was heading east on the Court St. Bridge. 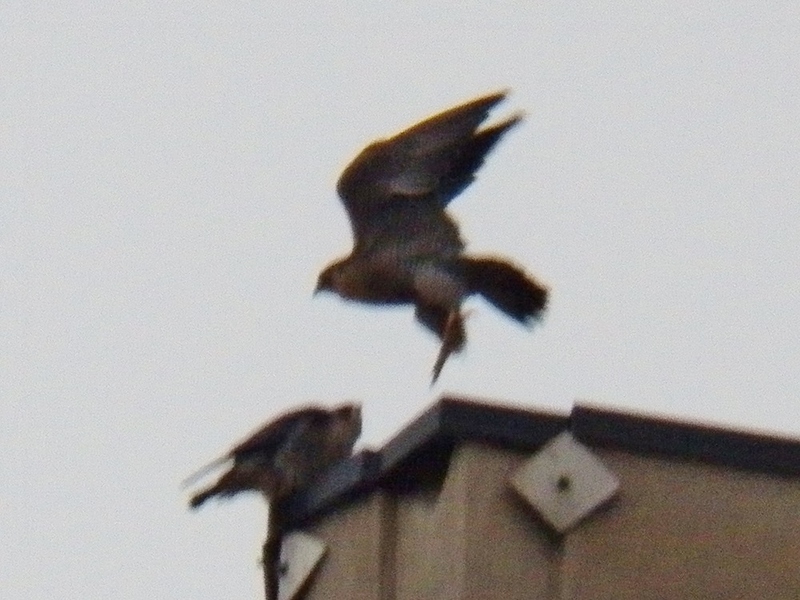 They were both on the west side of Bausch & Lomb-DC on the northwest corner and Beauty farther down heading toward Archer’s corner. 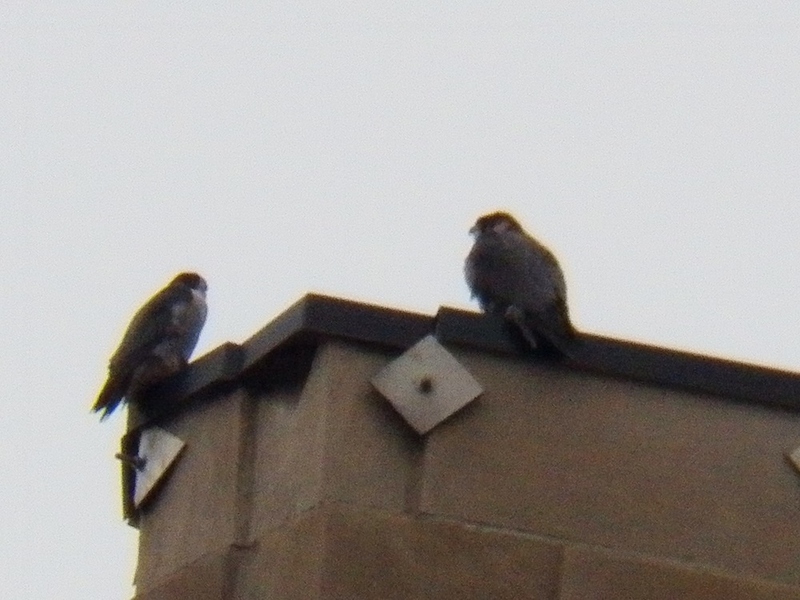 They just stayed perched that way for a while, both looking around their surroundings and at each other. 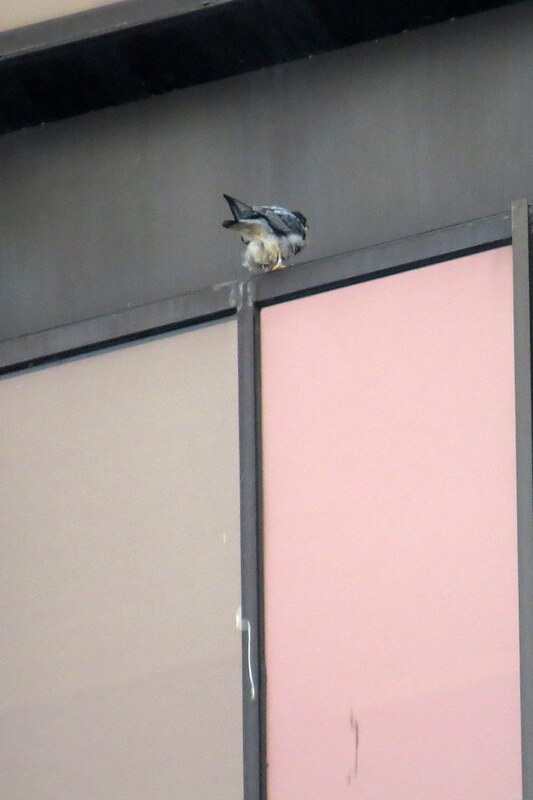 DC walked back away from the corner out of sight for a couple seconds then returned to the corner and at 8:34am Beauty flew over to the corner behind DC. 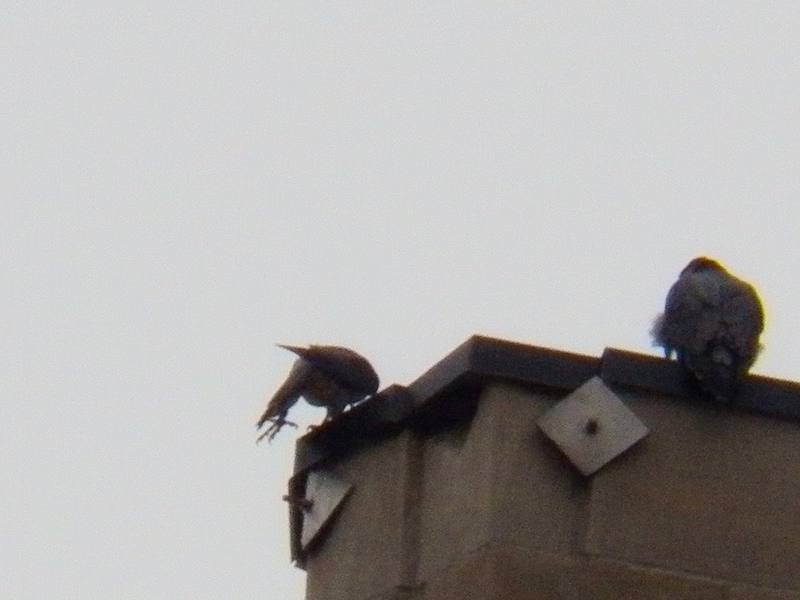 I think all this might have had something to do with food but can’t say for sure. 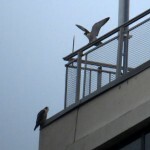 Today’s snippet movie includes both of these activities. 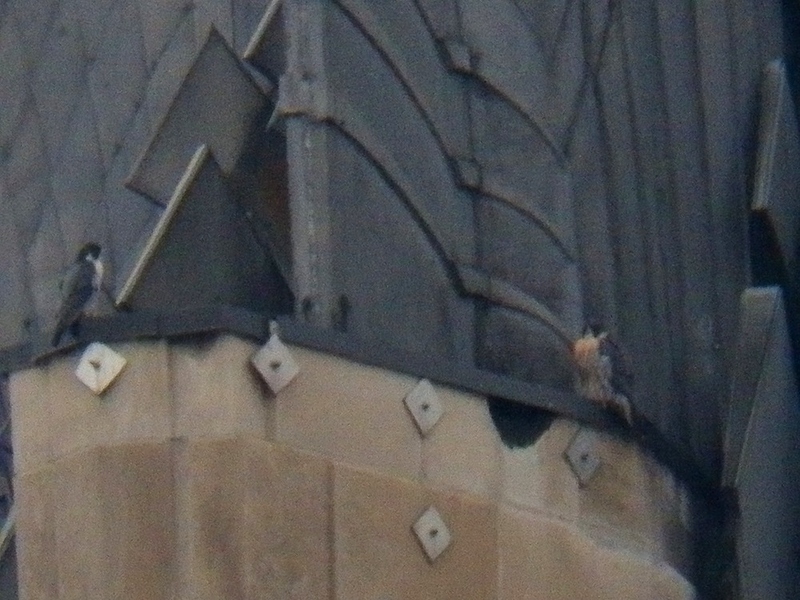 The Beautyful one also walked back a few steps then came back to the corner and tried to “Shake it off” lol as DC watched her every move from over his shoulder. 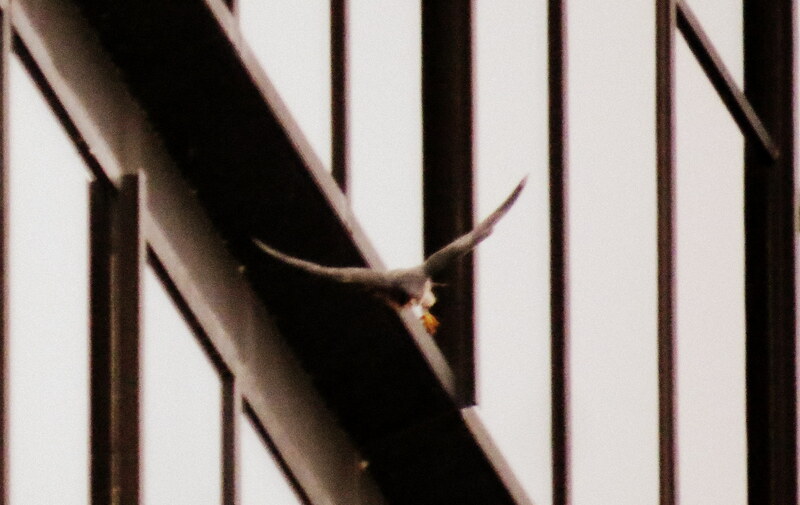 My camera battery had been flashing that the charge was low and I was trying to hold out until after they took off but I chose to change it out with a new one before it died all together. 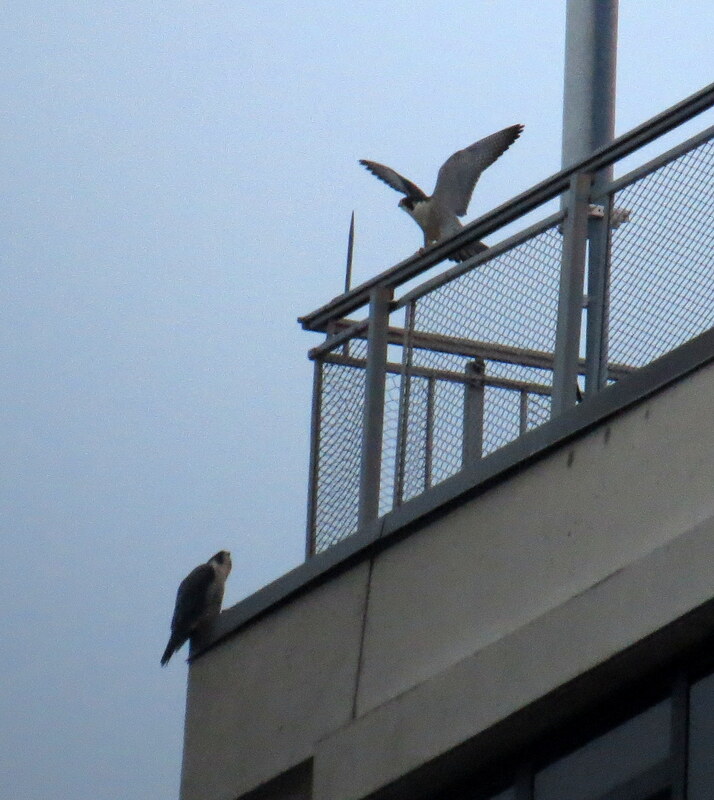 Of course while I was doing so Beauty and DC checked out on me so I had no idea what direction they flew off to. 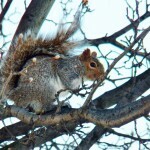 I took a ride around downtown and after no luck stopped to get some coffee at the Main and State St. Tim Horton’s. As I was walking to my car, I spotted DC on the northeast corner of Widows Walk with his back to me. 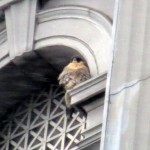 I drove over to Broad St. and parked in front of the Ebenezer Watts building where fellow falcon watcher and good friend DebbieH works. 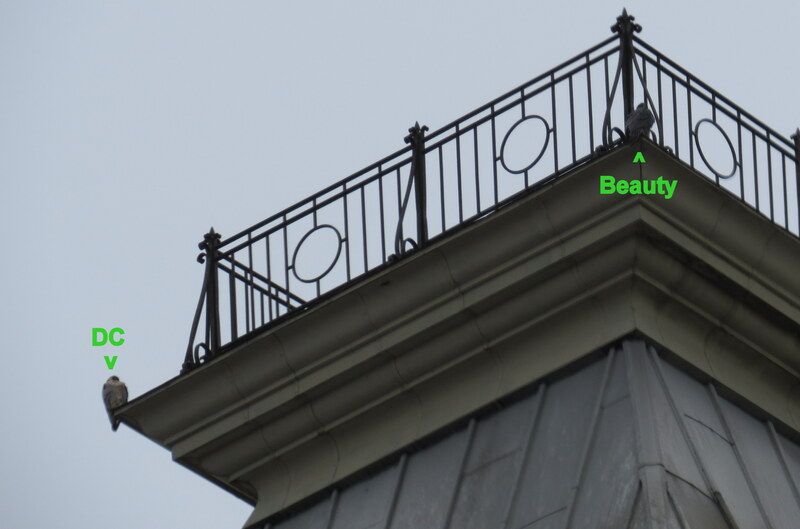 From there I could see Beauty was on the southwest corner across from DC. 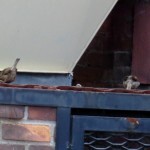 Once again they snuck off while I wasn’t looking as I tweeted out their whereabouts. 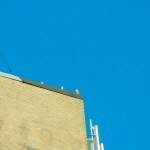 Some days are like that! 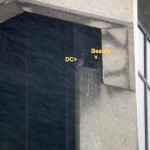 After another trip around downtown I found DC up in the OCSR elevator shaft on the south side ledge. 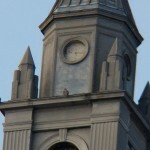 This is where I ended my watch at 9:30am. 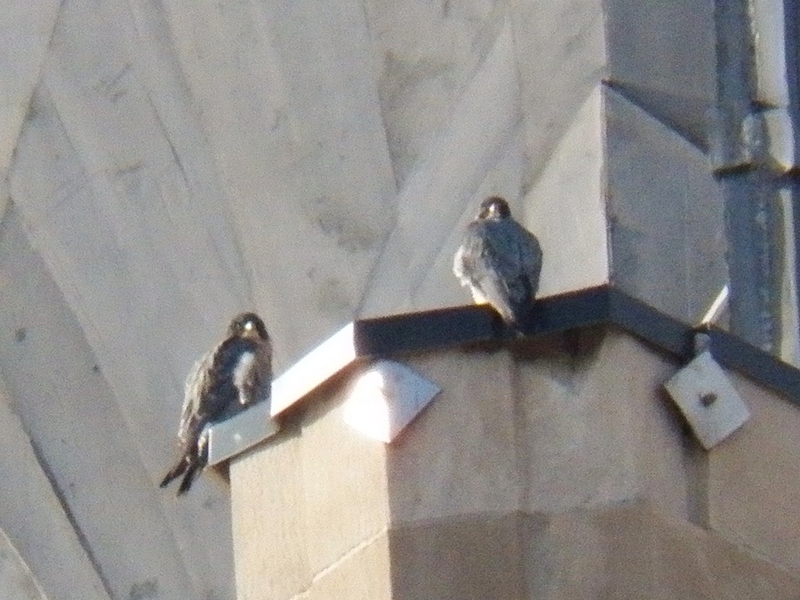 It seems that the theme these days is together-Beauty and DC plus Billie and 99 are all staying close to each other getting ready for the coming season of courtship and bonding. 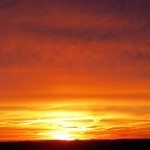 This makes me smile! 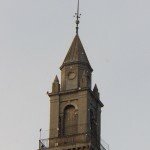 Today I started my watch at 12:30 pm and ended it at 3:00 pm. 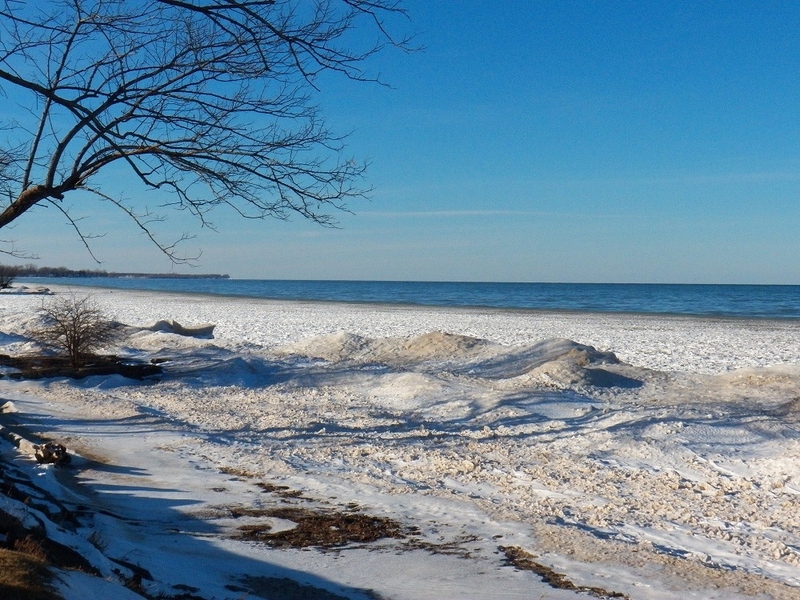 It was much colder today, but the bright sunshine made up for the bitter cold 17 degrees (F), especially when sitting in my car. 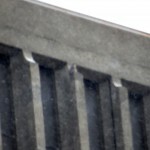 lol It lightly snowed on and off. 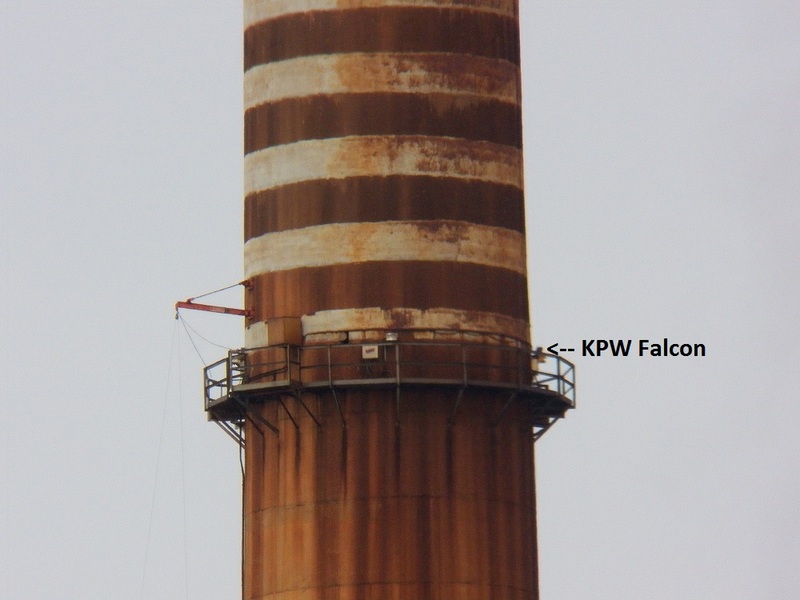 My watch started at Kodak Park West, where I found no falcons. 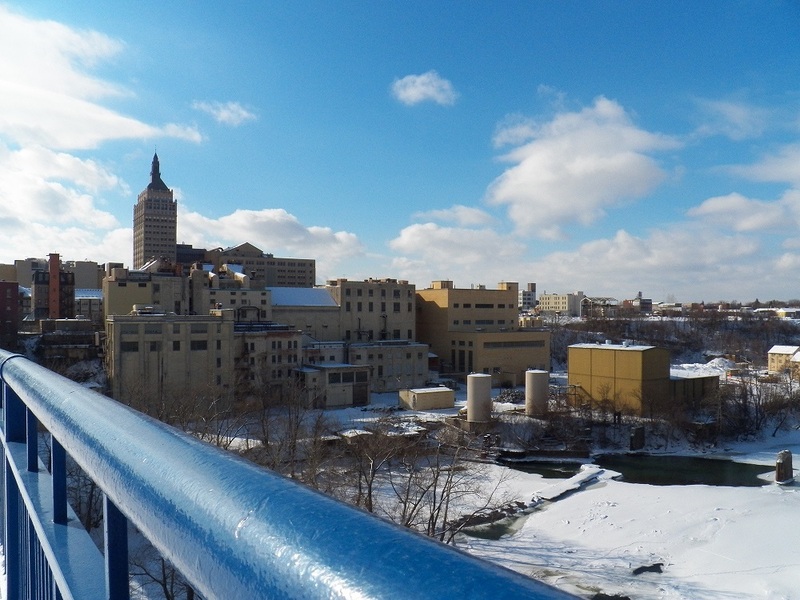 I headed downtown and pulled over on the Morrie Silver Way to check out the Kodak Tower from the west side. 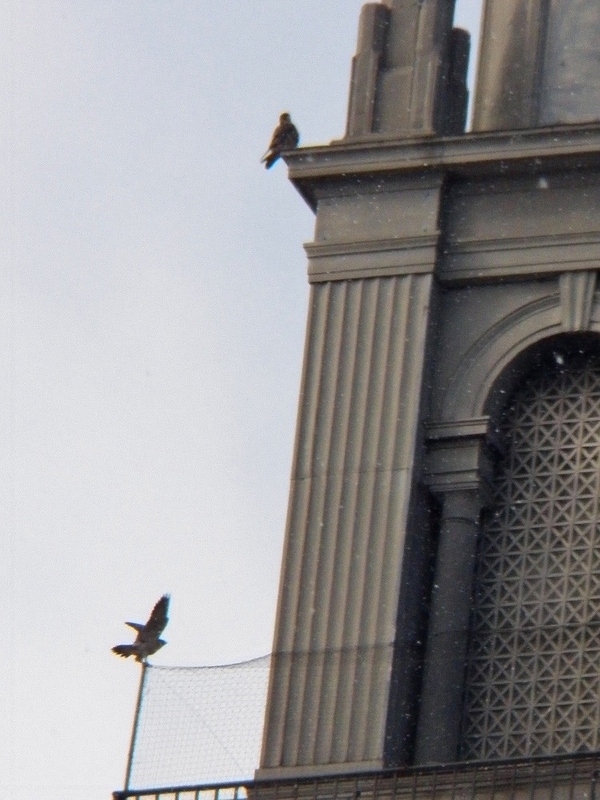 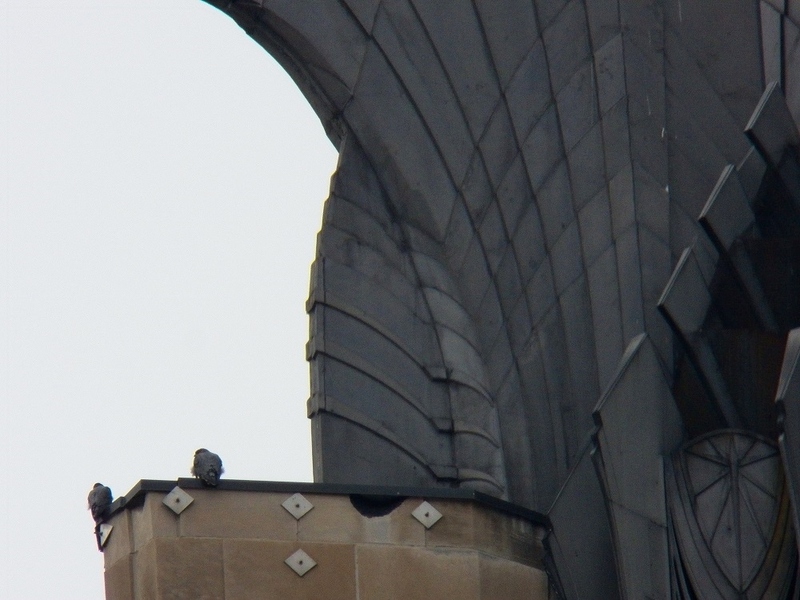 I immediately spotted two falcons on the tower. 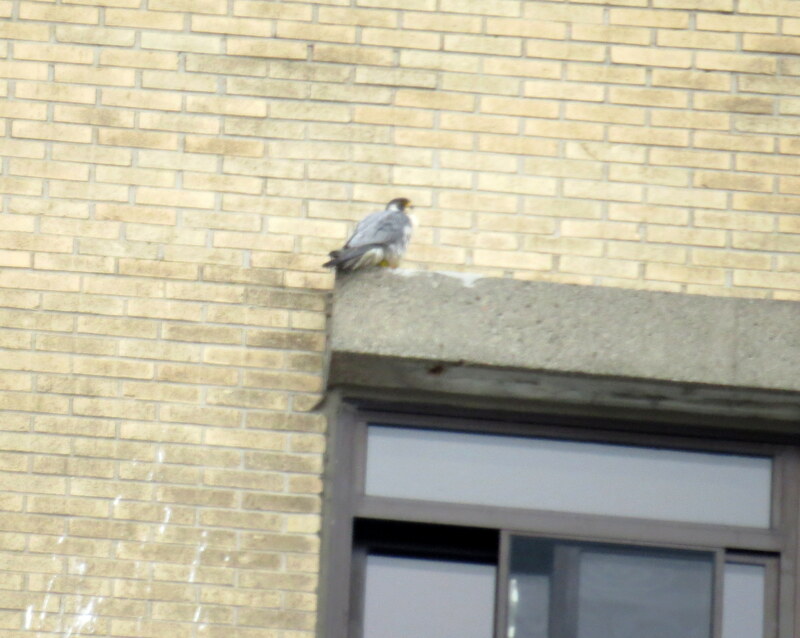 Beauty was on the southwest corner of the launch pad and Dot.ca was just below her on the southwest corner of the playpen netting. 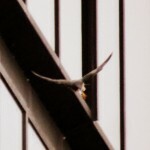 You can click on any pictures you would like to see larger. 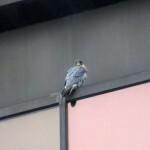 I found a spot to park my car on State St in front of WXXI. 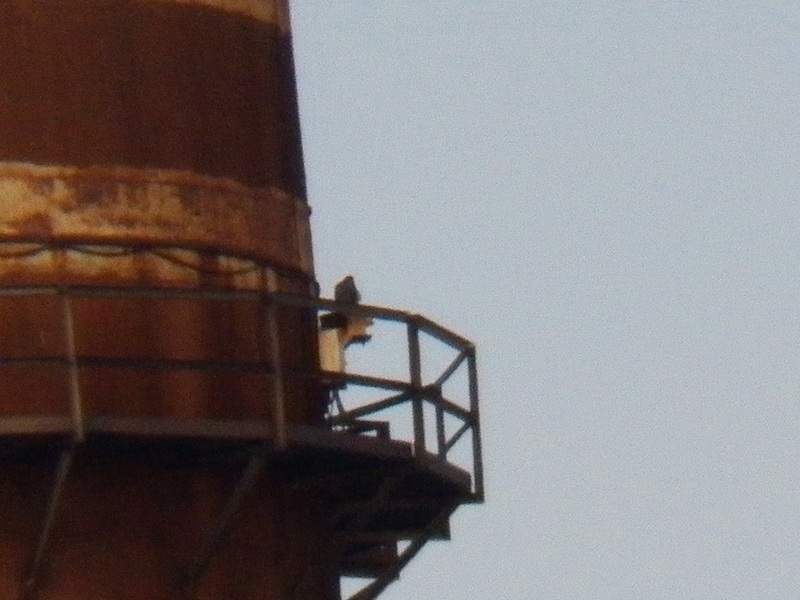 From there, I had a better view. 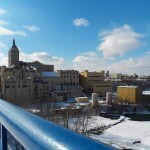 This was my view from the south side of the Kodak Tower. 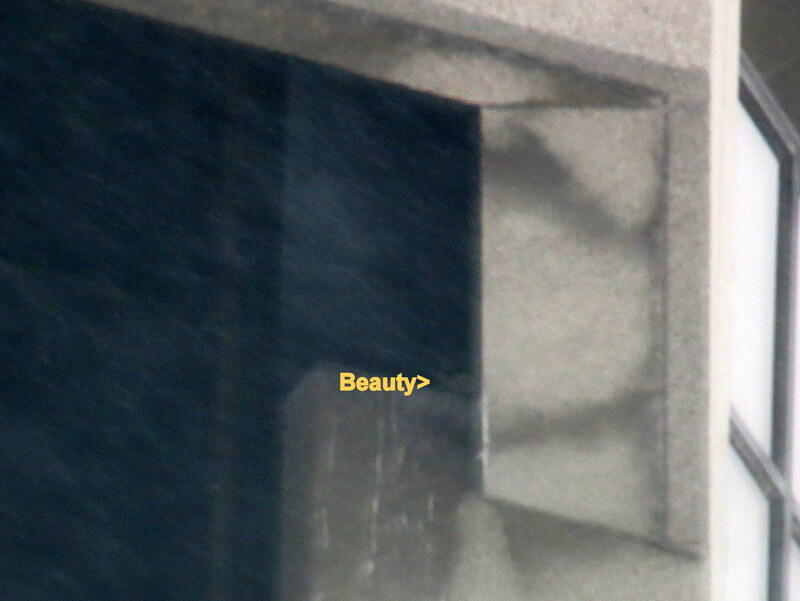 First Beauty and then Dot.ca took off. 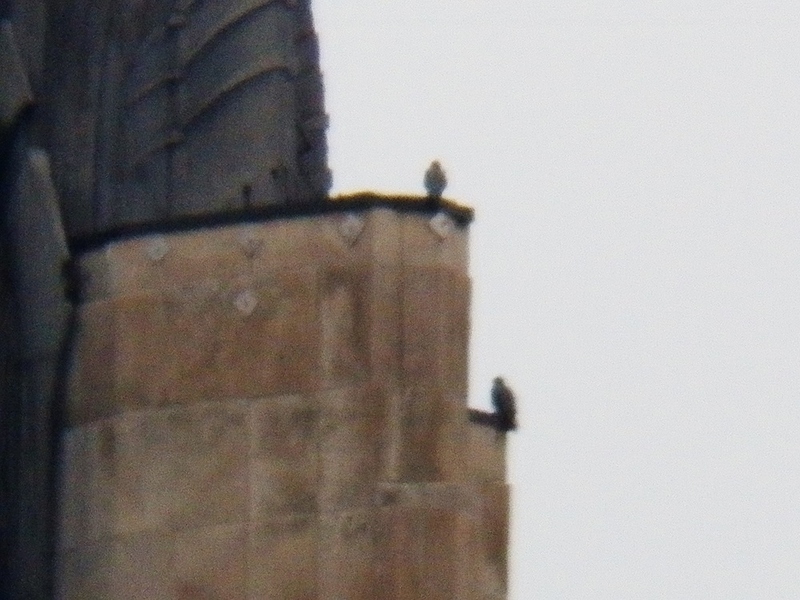 They both circled the tower and landed on the south side of the launch pad. 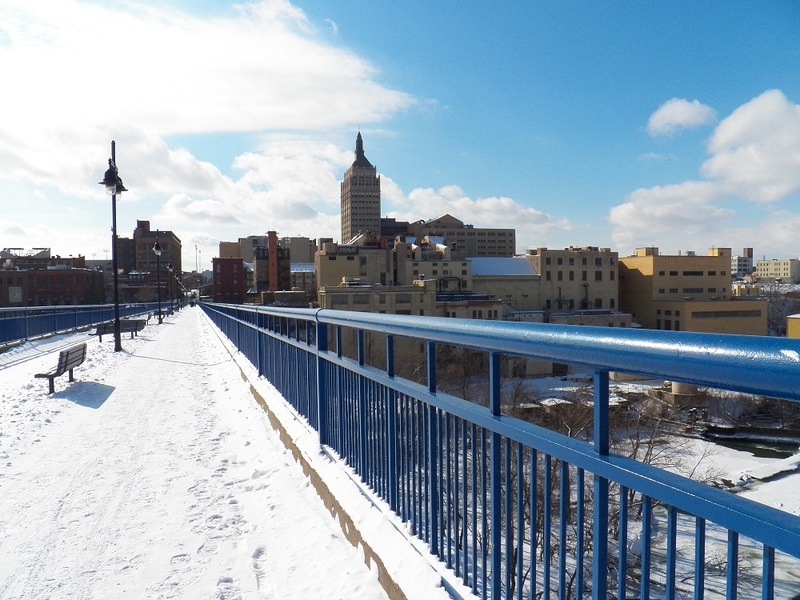 There was yet another function at the Blue Cross Arena (aka the Rochester War Memorial) and Broad St was filling up fast. 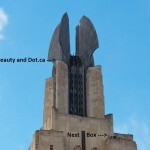 I left Beauty and Dot.ca up on the Times Square Bldg soaking up the sun. 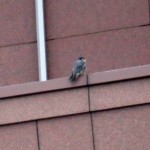 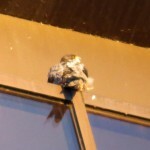 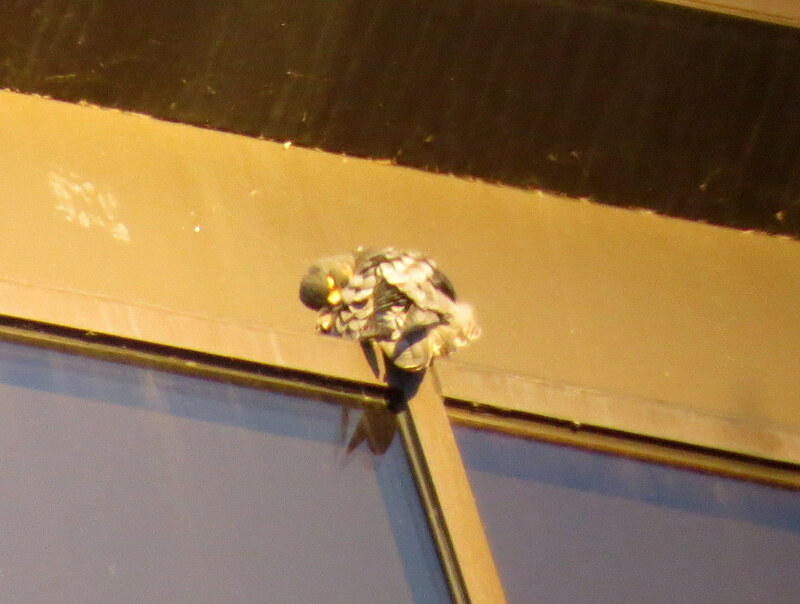 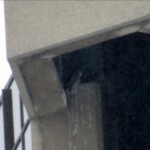 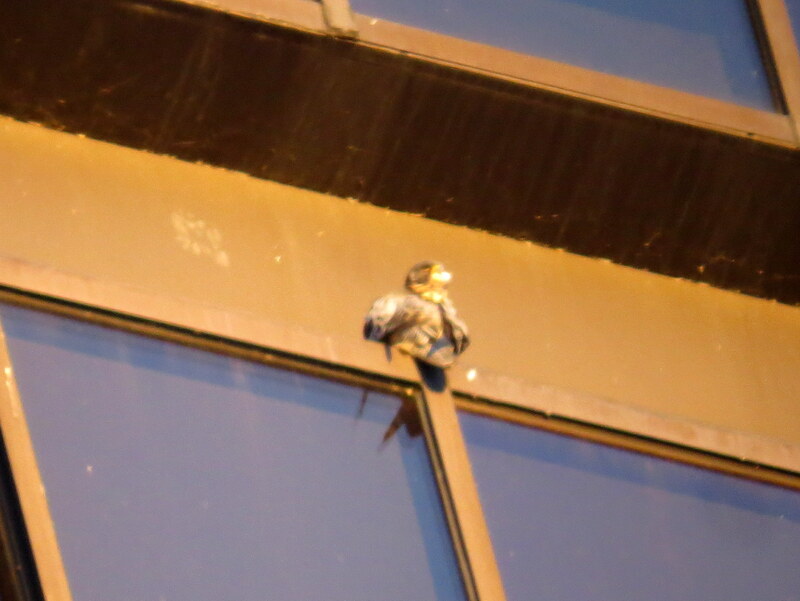 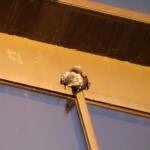 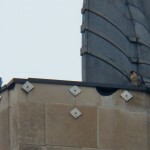 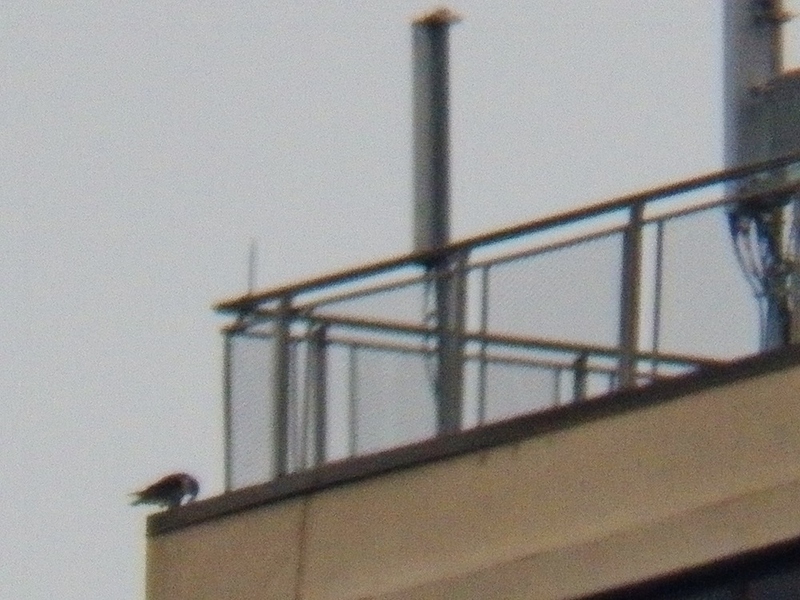 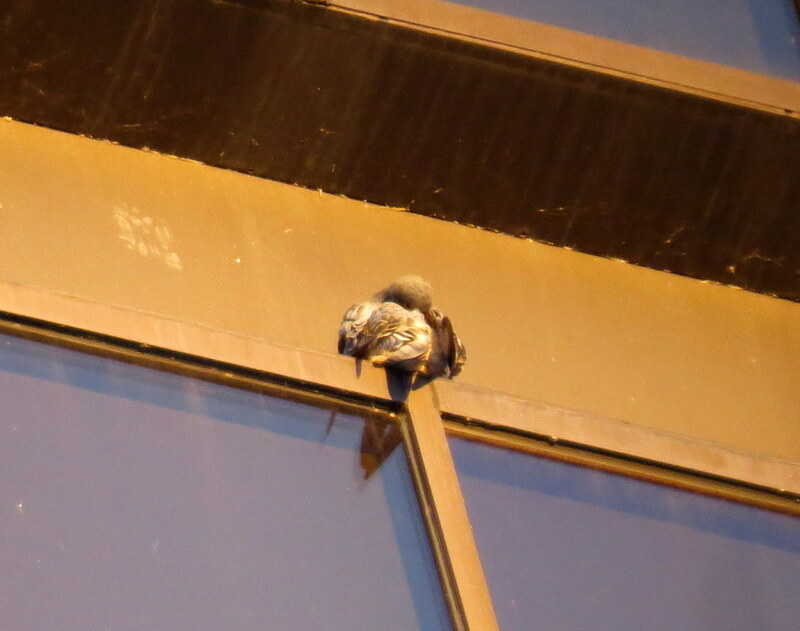 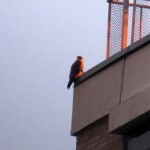 My watch continued at Seneca Towers where I found two falcons on top of the building at the south end. 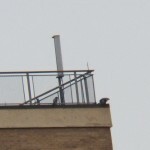 I was not able to positively ID them, but it certainly looked like Billie and 99. 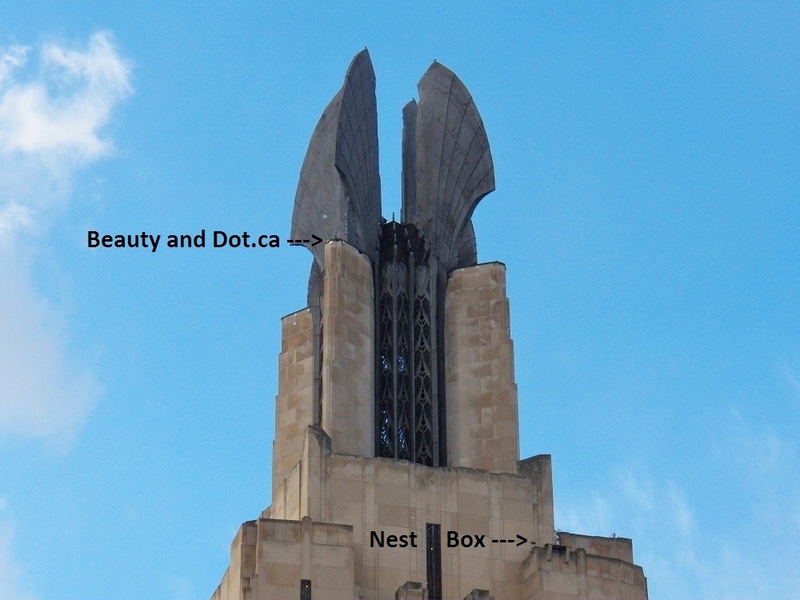 They were close together just like Beauty and Dot.ca had been. 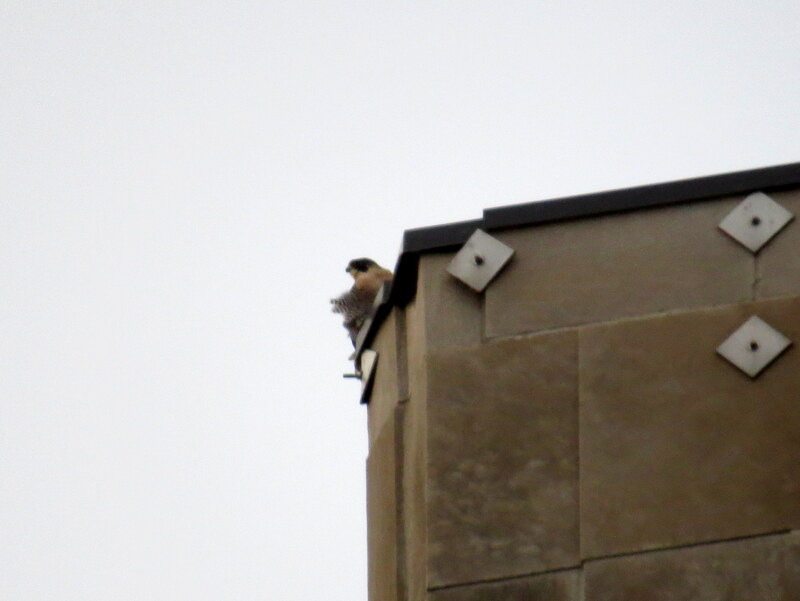 After seeing both pairs of Rochester Falcons, I ended my weekend falcon watch by checking out Russell Station on my way home. 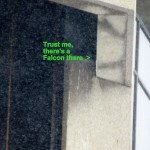 No falcons there. 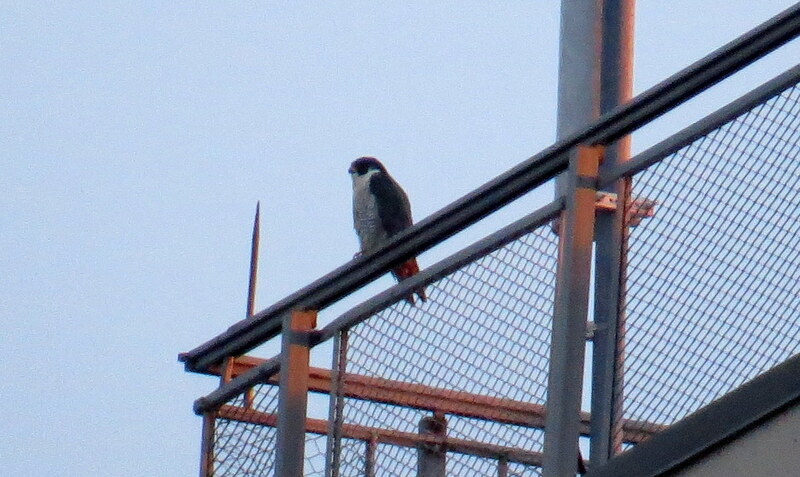 It’s been a long time since we’ve seen a falcon there. 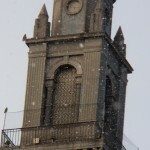 I’ll leave you with a few pictures from my travels. 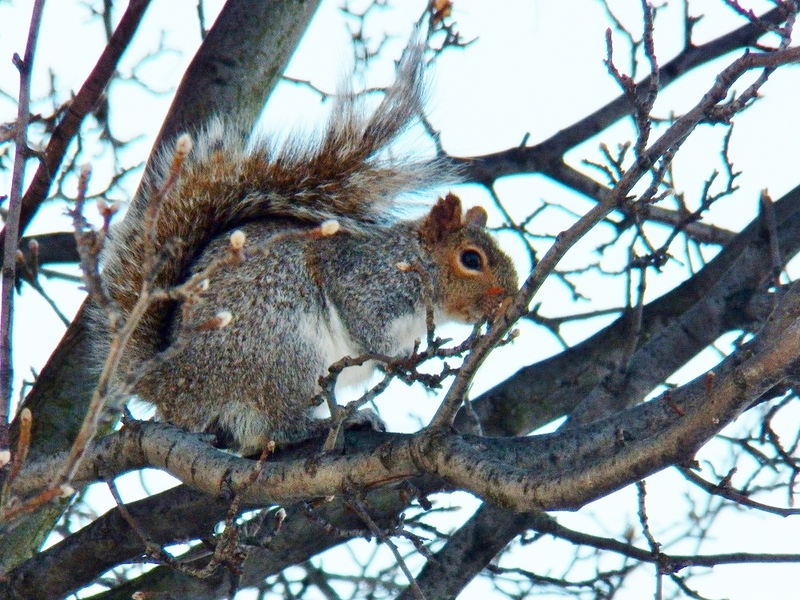 Have a nice week everyone and keep warm! 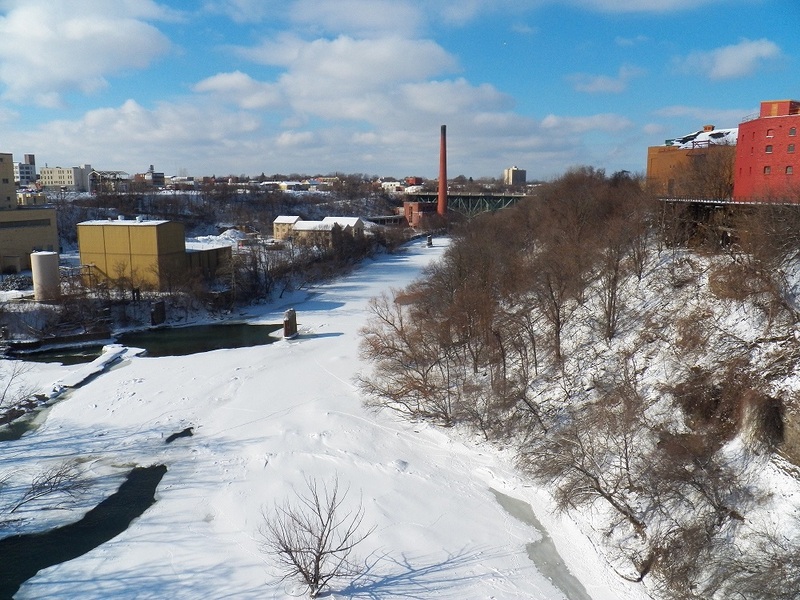 Spring will be here before we know it! 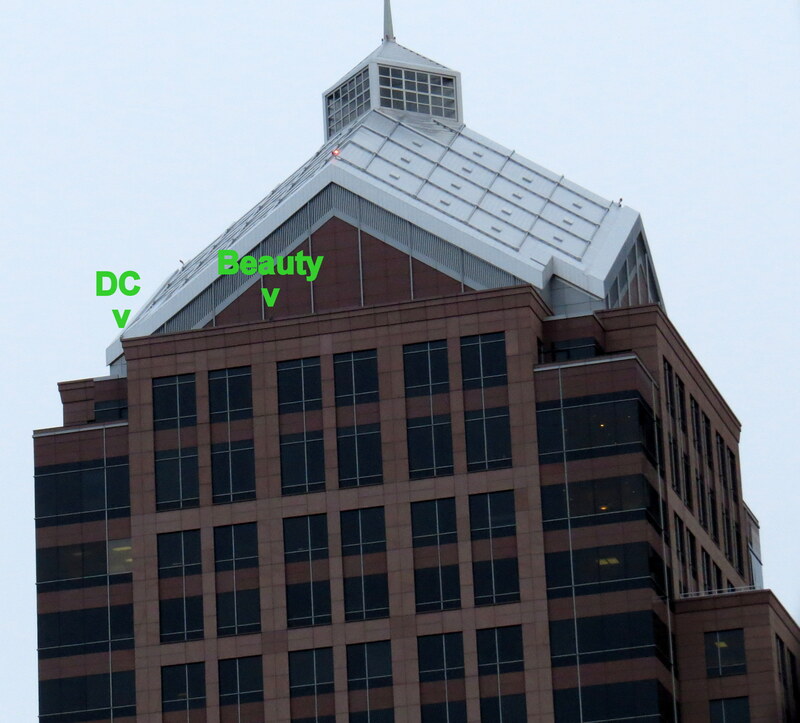 As has become my first check in the morning when I get downtown, there was nobody in the OCSR elevator shaft but I did spot Beauty on the top ibeam southeast side of OCSR from Bragdon Place. 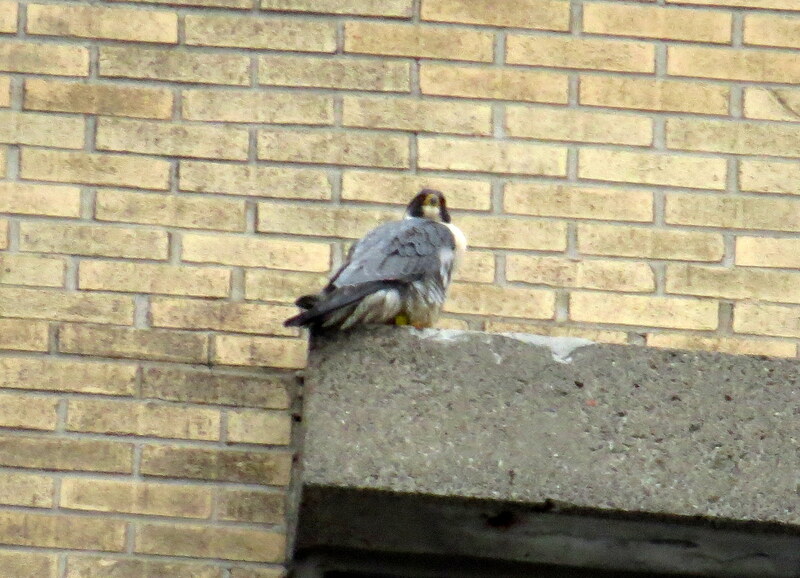 She had her back to me so I went to the hole parking lot to get a front view. 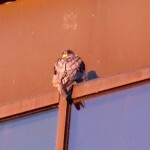 Beauty was looking around and preening when the sun poked its head out for a few minutes and shone down on the Beautyful one and I. 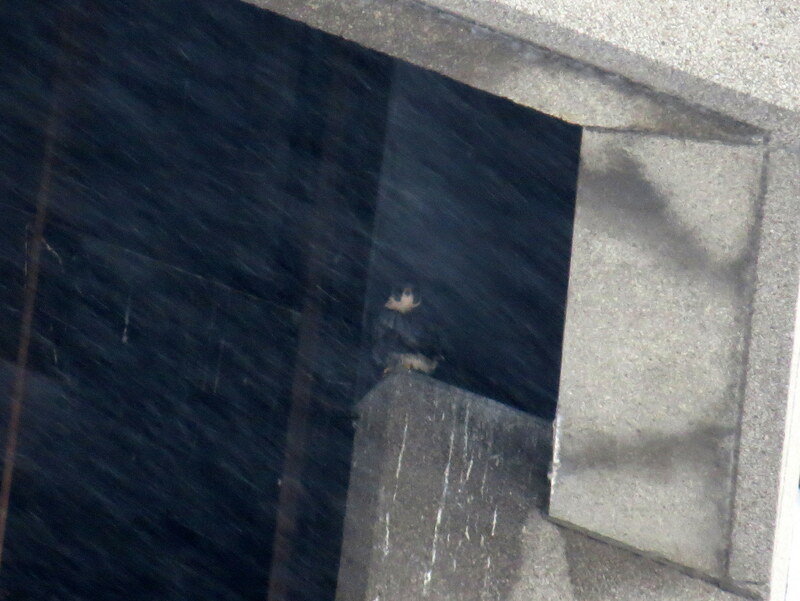 A bunch of house sparrows were entertaining me on the Aqueduct building for a few minutes, chattering and chasing each other around. 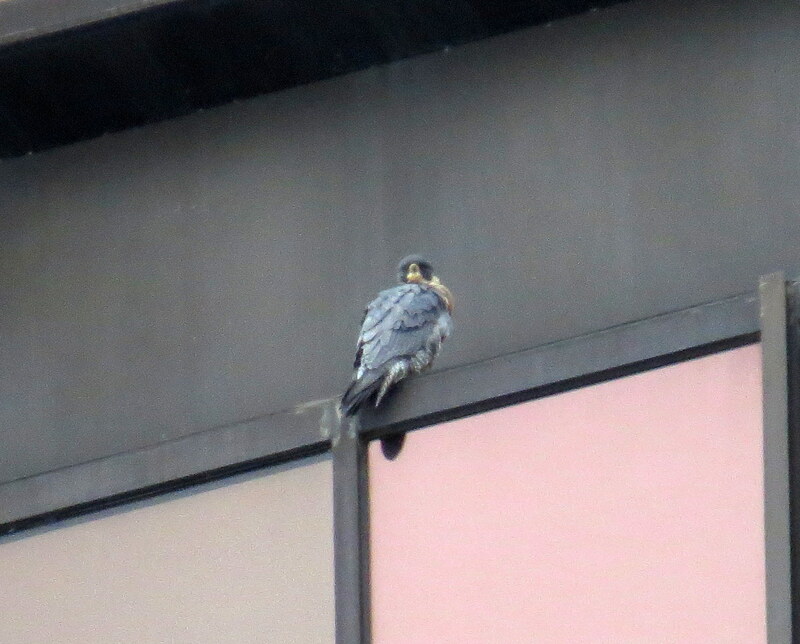 Then at 8:15am Beauty flew over to Times Square (TSB) coming to rest under the southeast wing where she kept looking down toward the nest box. 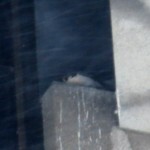 Little did I know Dot.ca (DC) was at the nest box as I would find out a couple minutes later when I received a tweet from cam watcher, Annette, saying he was there. 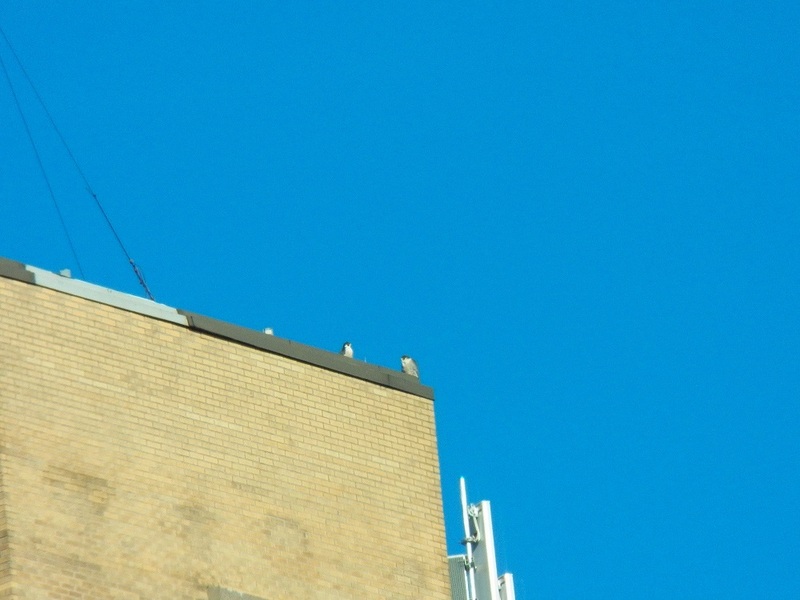 Oh these guys can be so sneaky! 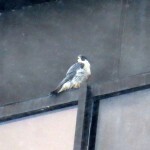 Beauty didn’t stay up there for long, as she flew off, I lost her behind the Thomson Reuters building and then I believe it was DC I saw flying above the Philipone building. 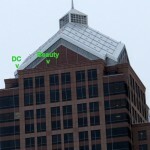 I thought it was Beauty and at the time was thinking, gee that looks small like DC! 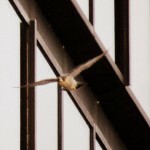 Then he left my field of vision out over the river and as I looked over toward OCSR I spotted Beauty fly up into the elevator shaft. 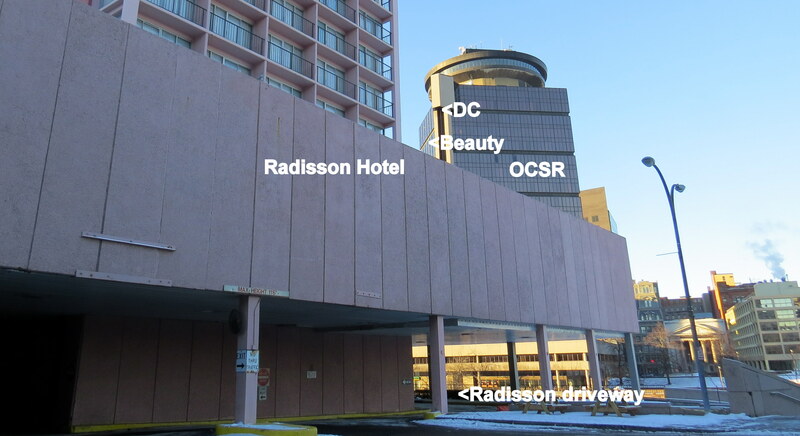 I drove over to the Radisson Hotel by Main St. to see which ledge she was on-north side and that’s when I noticed DC on the top ibeam southeast side. 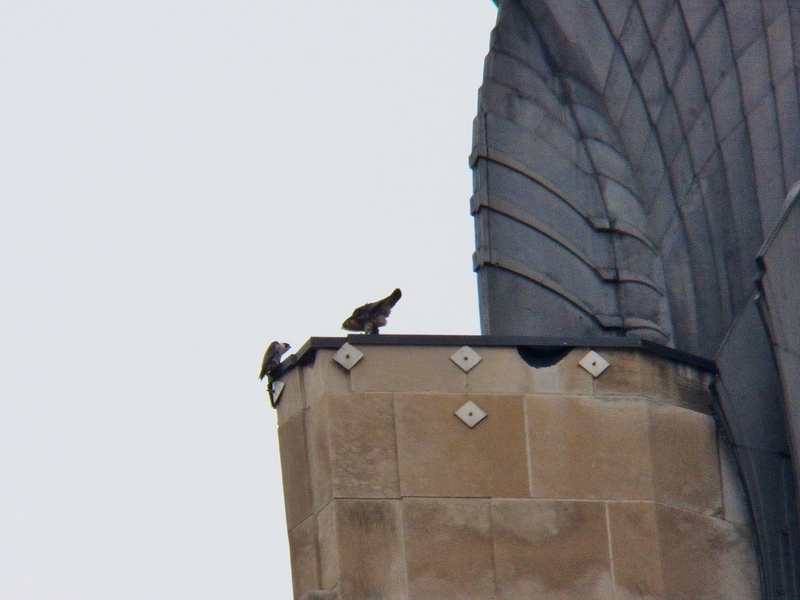 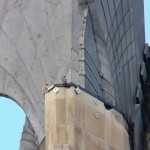 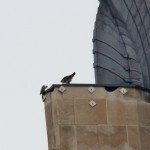 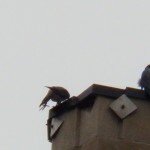 At first, Beauty and DC did some preening, then she went way back on the ledge and showed her back. 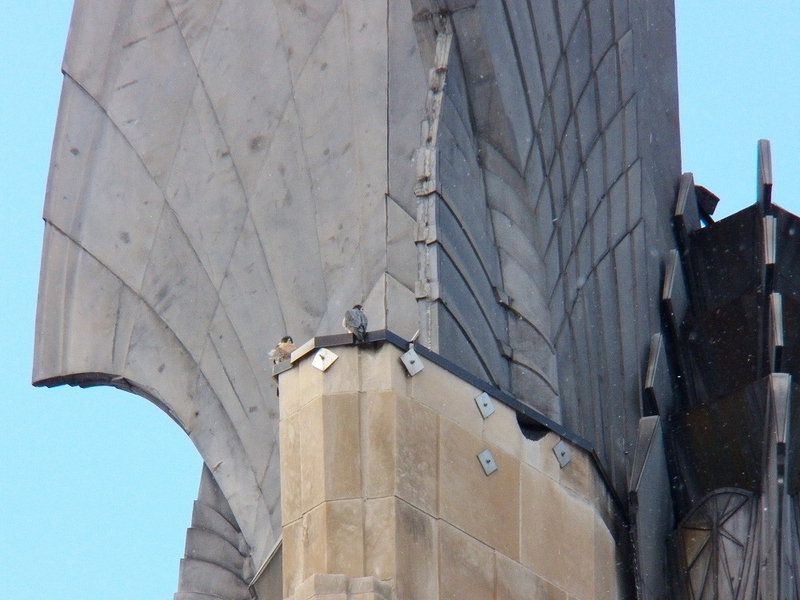 Meanwhile, DC stopped preening and started looking south. 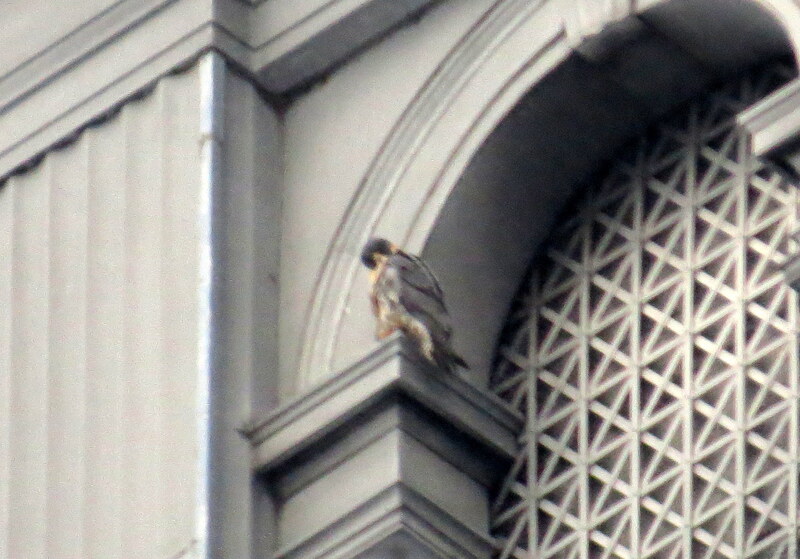 While DC continued to look south Beauty moved out from her hiding spot a little bit around 8:45am. 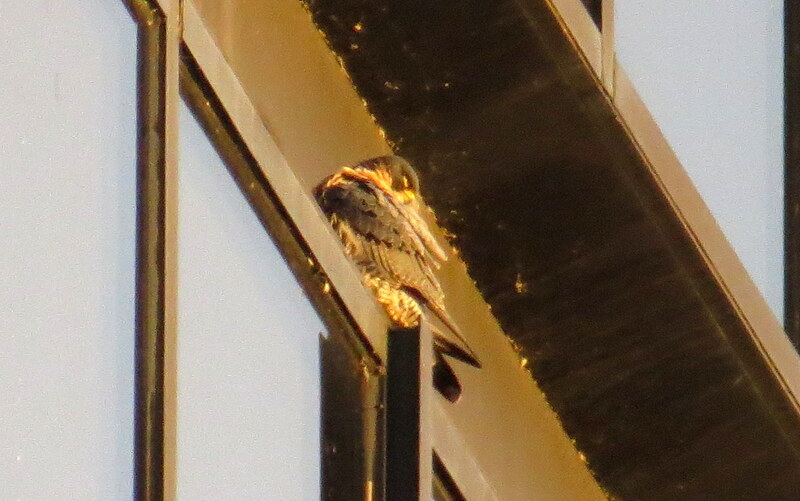 I thought for sure DC would join Beauty but he turned his back to me and seemed to get settled in on his ibeam as Beauty was comfy up on her elevator ledge. 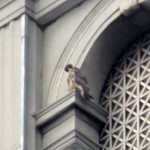 I decided to end my watch and go get comfy at home leaving downtown with a falcon fix smile! 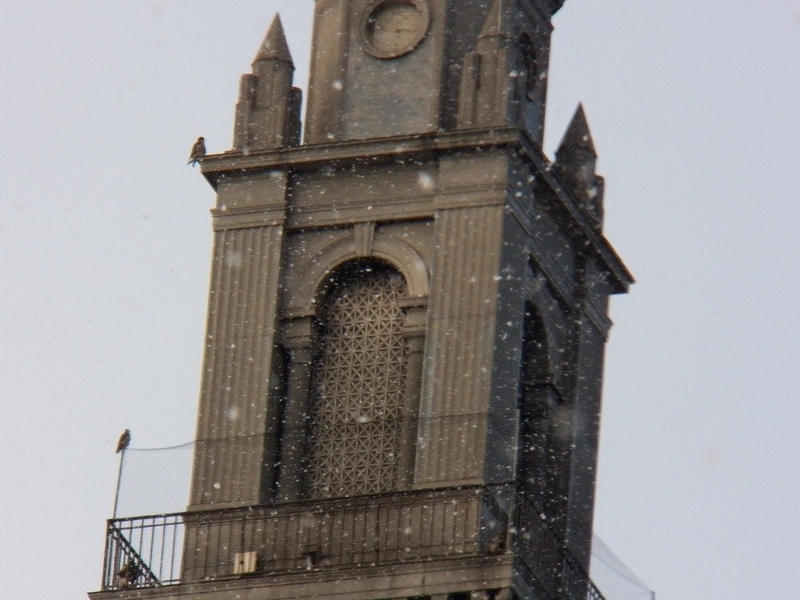 I started my watch at 11:00 am and ended it at 3:00 pm. 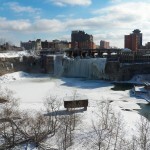 I made the rounds, starting at the west end of Kodak Park. 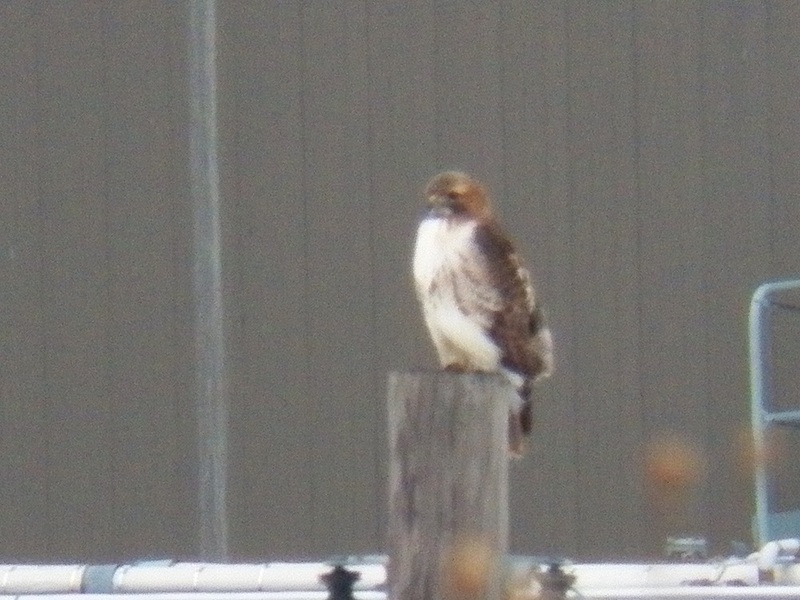 No falcons there, but I was happy to see a beautiful adult Red-tailed Hawk hunting over the field in front of me. 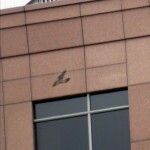 My next stop was the BS location. 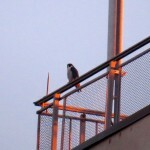 All was quiet, except for a few noisy Crows. 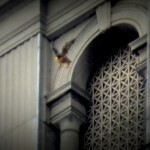 On my way downtown, I stopped on Exchange, south of the Times Square Bldg (TSB). 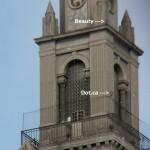 From there, I could see both Beauty and Dot.ca. 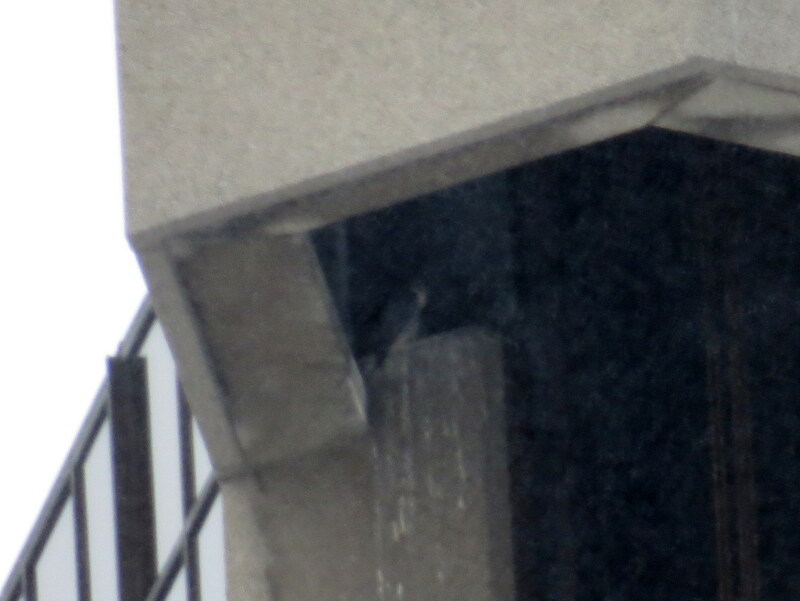 They were on the TSB, Beauty below the NE wing and Dot.ca (DC) under the SE wing. 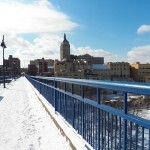 I moved on to the Broad St Bridge which was quickly filling up with Razor Shark fans. 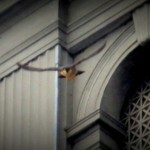 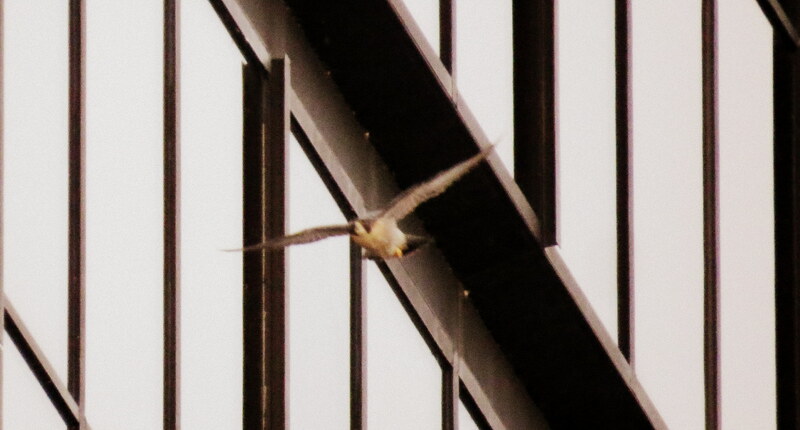 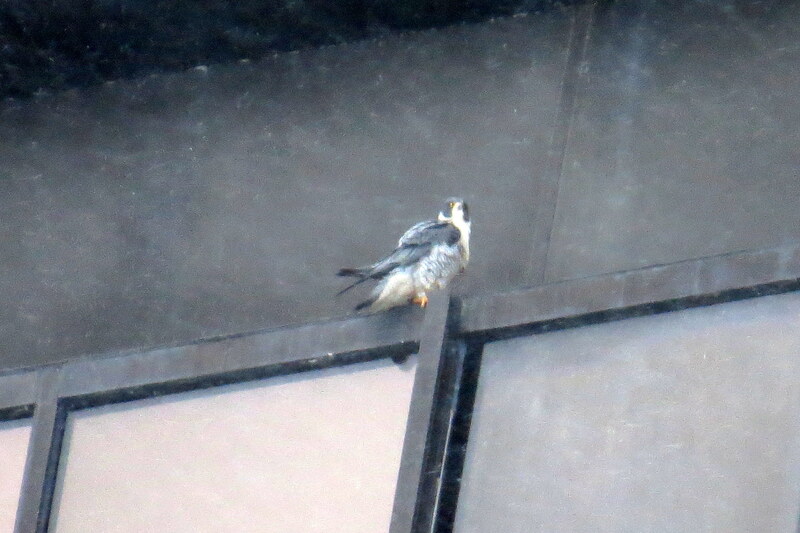 Beauty flew over to join Dot.ca on the southeast wing ledge. 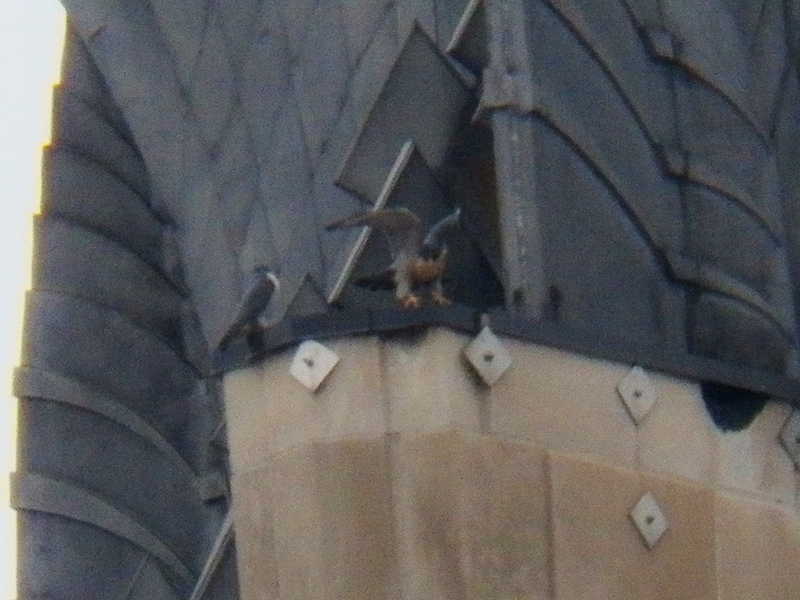 Both had very full crops. 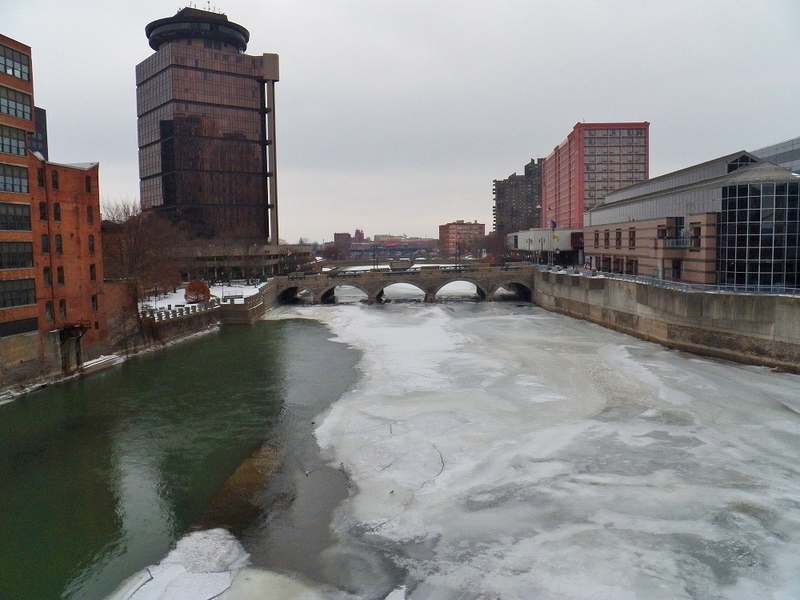 I got out of my car to check out the river, which was half iced over. 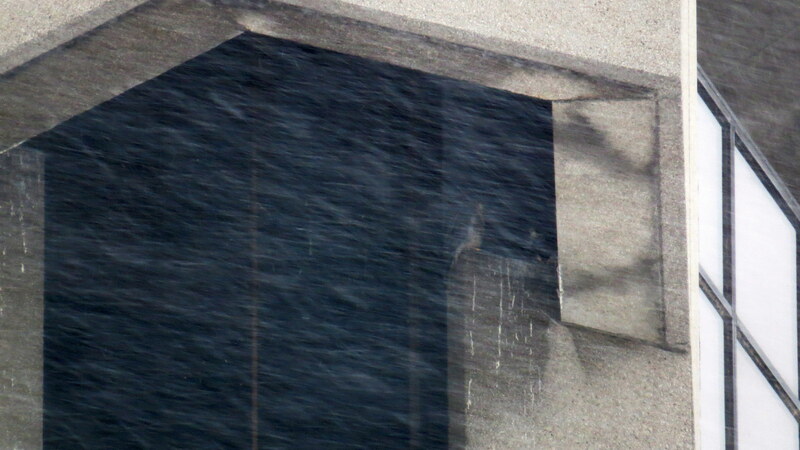 The gulls were enjoying it, but I saw no ducks. 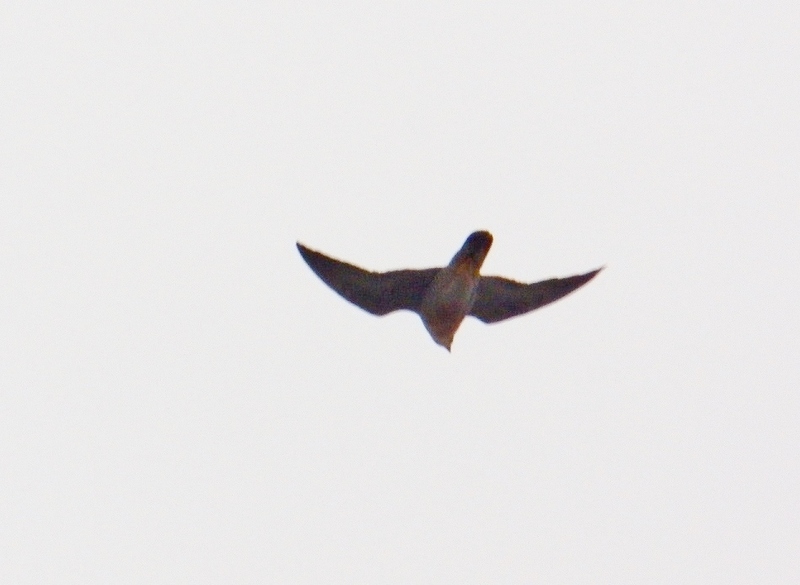 While I was watching the life on the icy river below, Beauty took off and flew over me heading east. 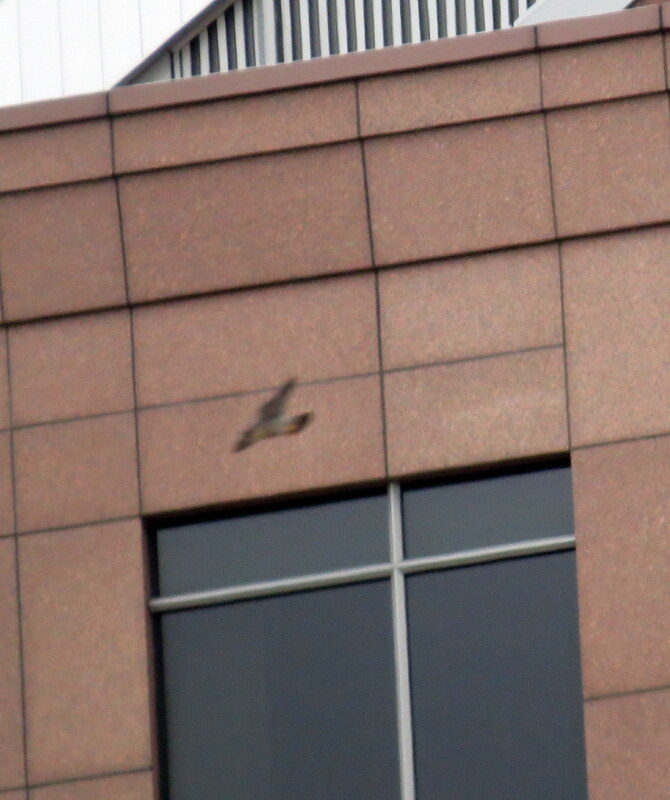 She flew past the old Midtown Plaza. 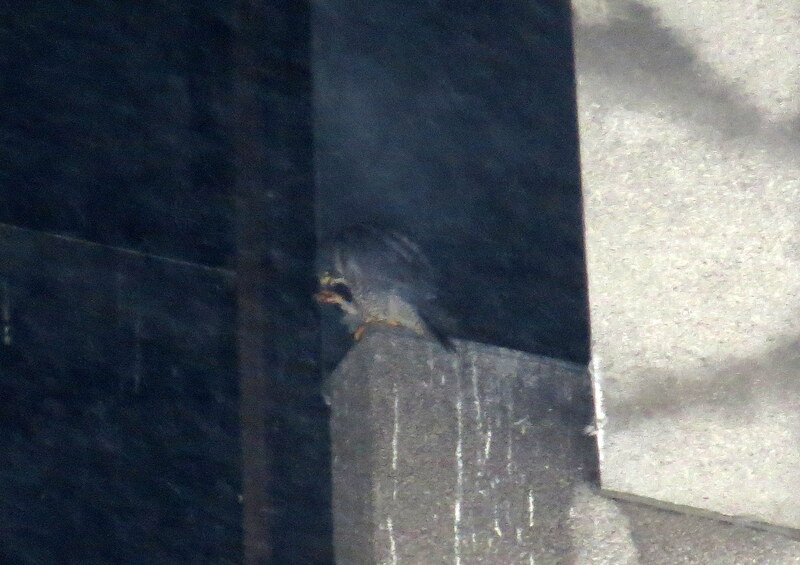 A few minutes later she returned, landing next to Dot.ca on the TSB. 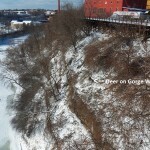 I moved down to Aqueduct St (aka “the hole”) for a different view. 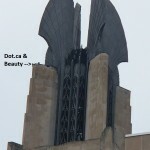 Beauty approached Dot.ca and spread her wings. 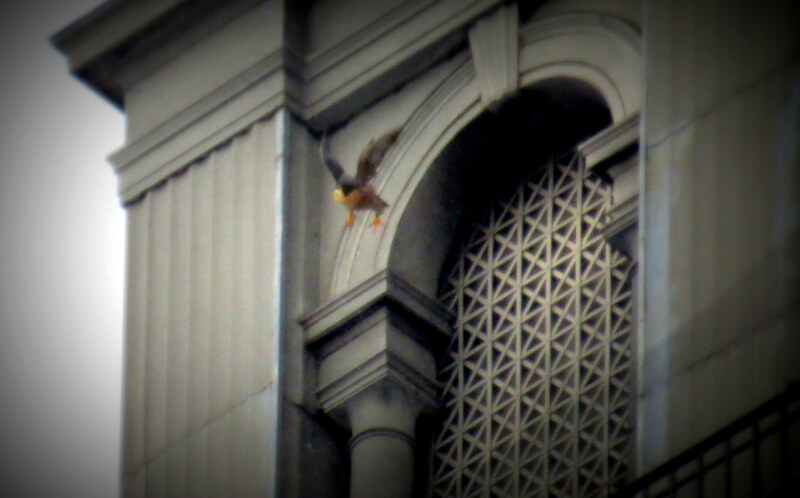 She launched herself from the building and flew south over Cornhill. Moments later she returned and knocked Dot.ca off his spot. 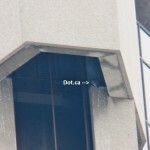 Dot.ca flew to the OCSR and up into the elevator shaft. 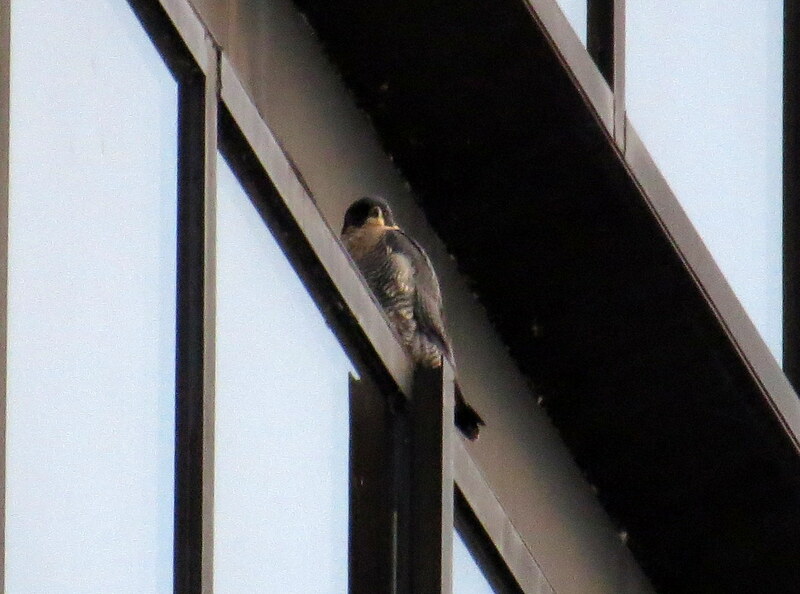 Before I left downtown, I checked on Dot.ca and found him on the north ledge of the elevator shaft. 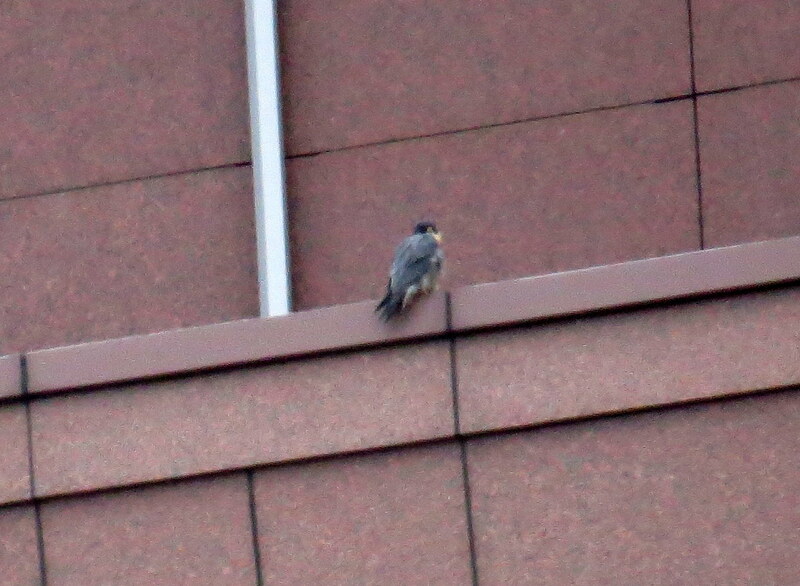 I left him there and Beauty on the southeast wing ledge to continue my falcon search. 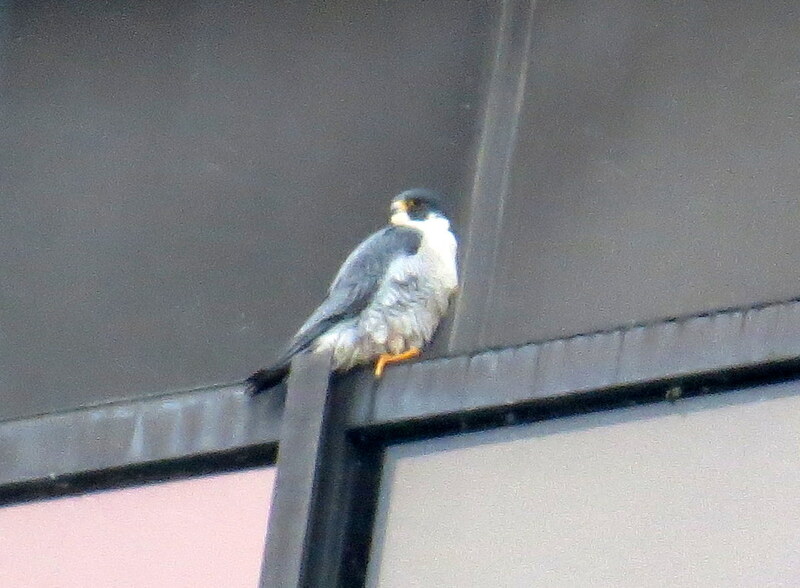 I drove past Hawkeye and saw no falcons hanging out at the nest box located there. 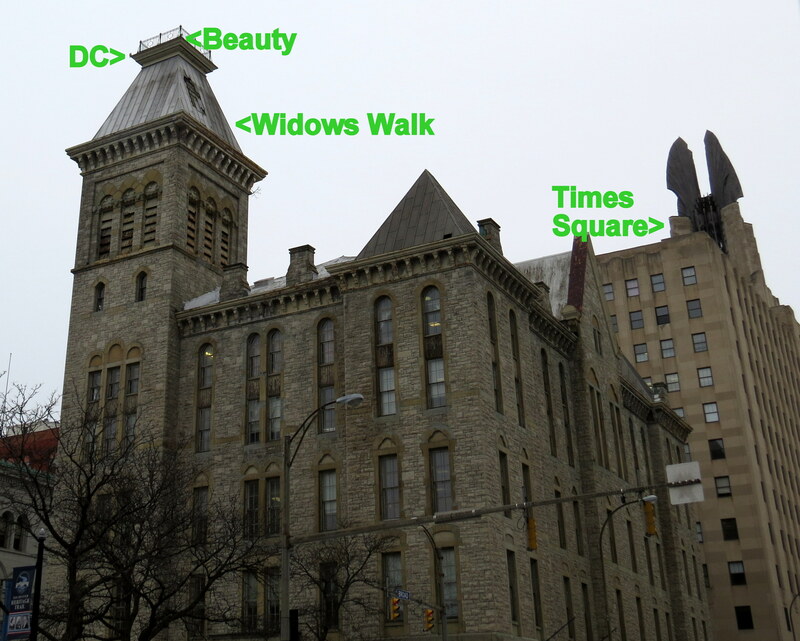 So I continued on to Seneca Towers. 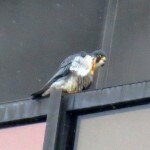 There I found a falcon eating on the northwest corner. 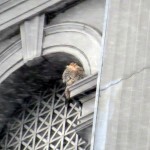 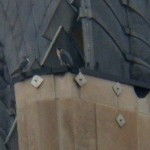 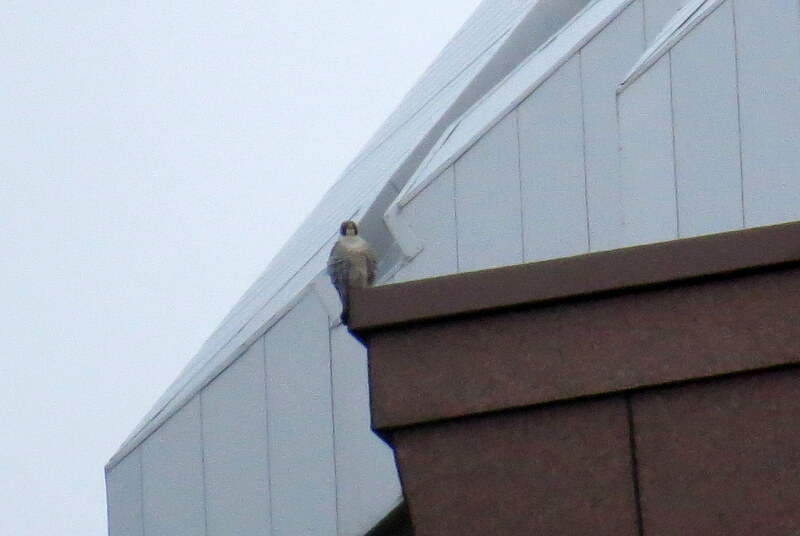 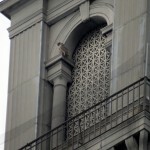 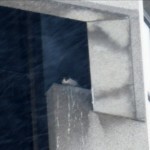 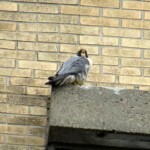 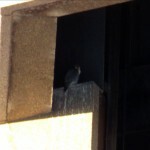 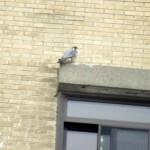 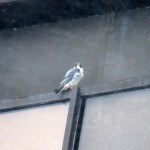 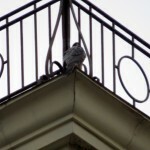 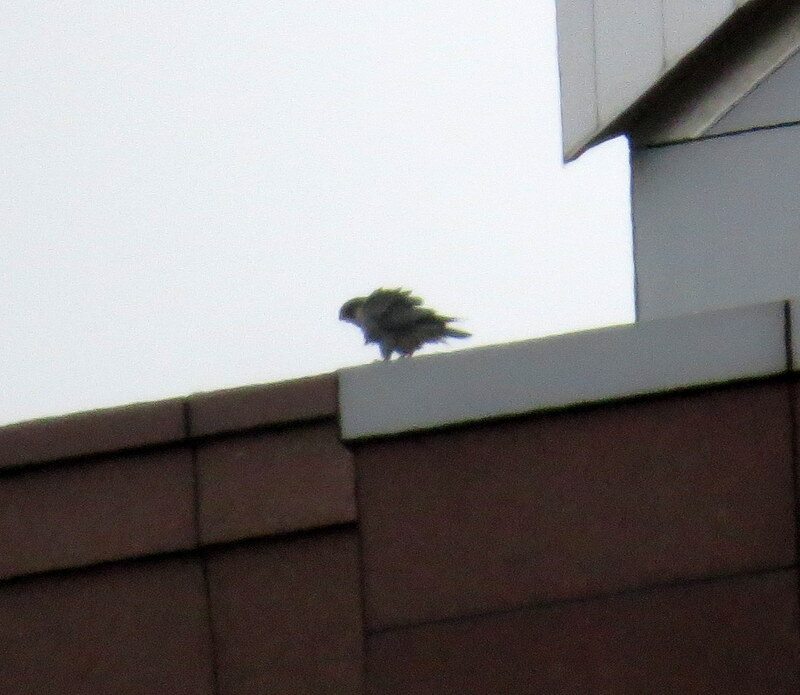 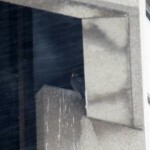 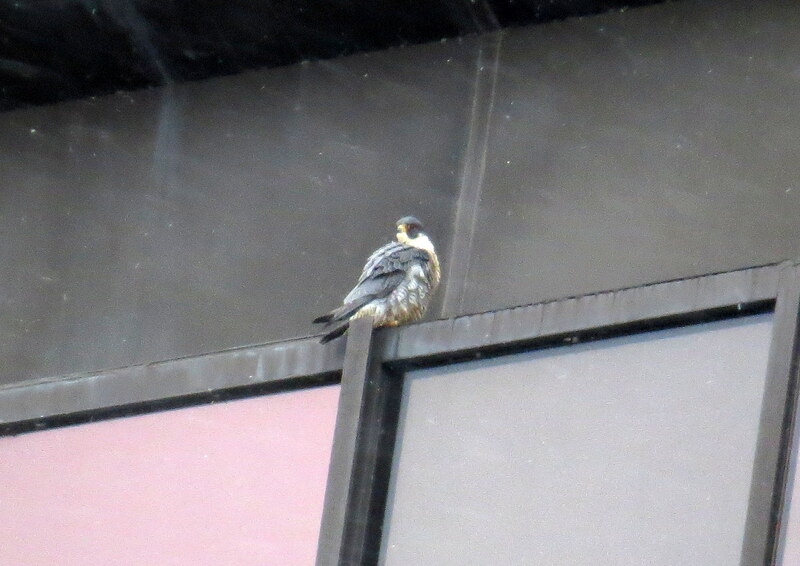 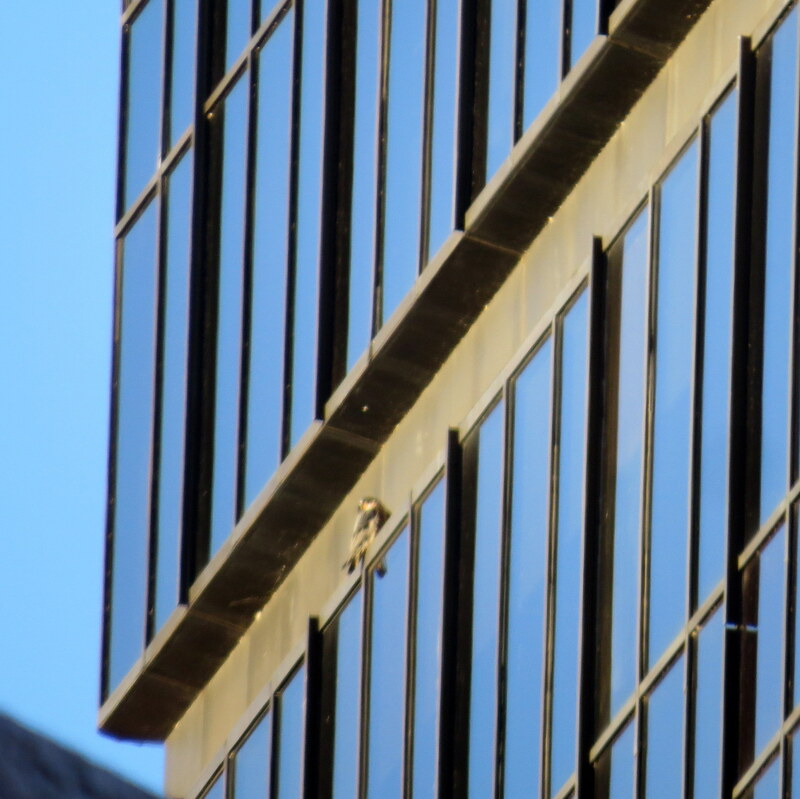 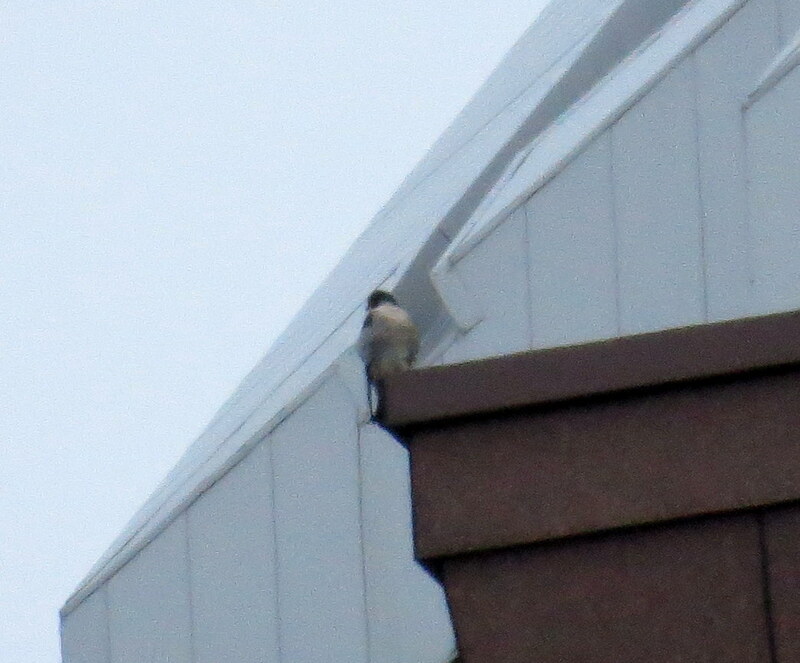 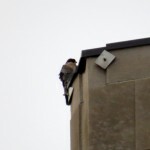 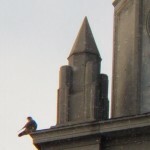 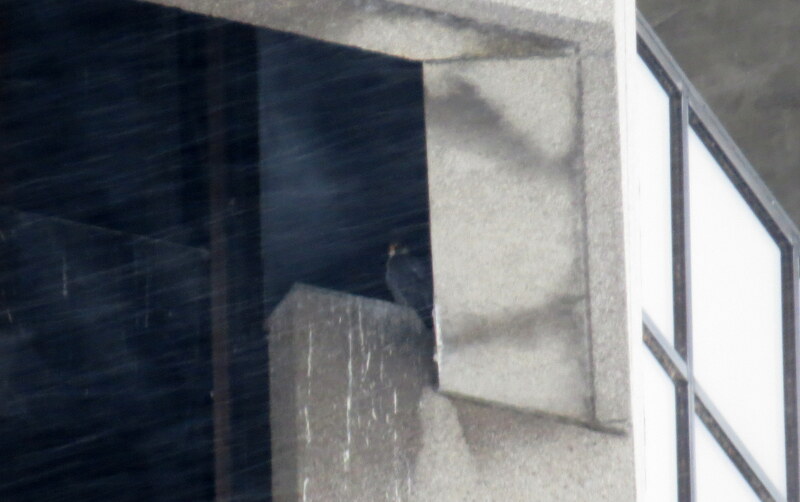 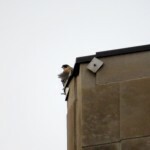 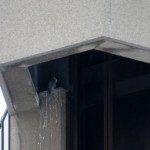 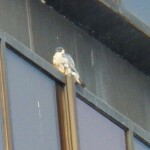 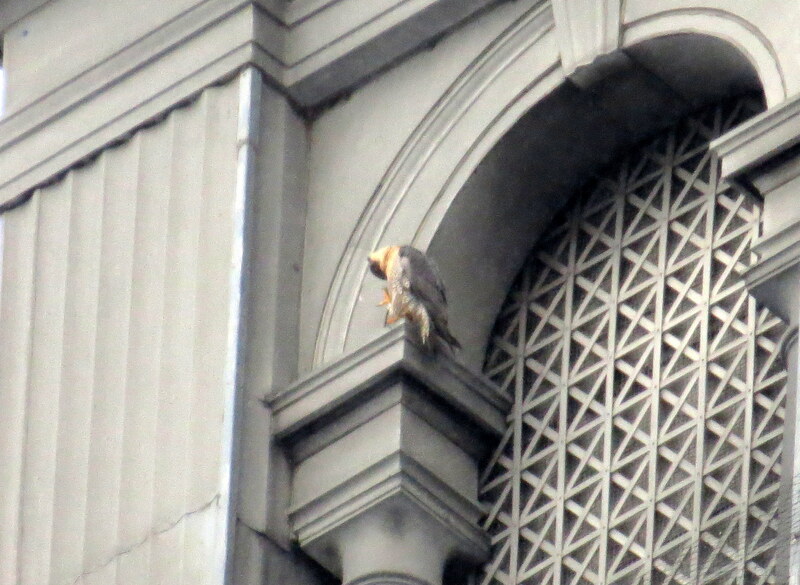 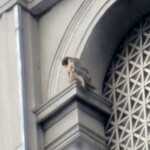 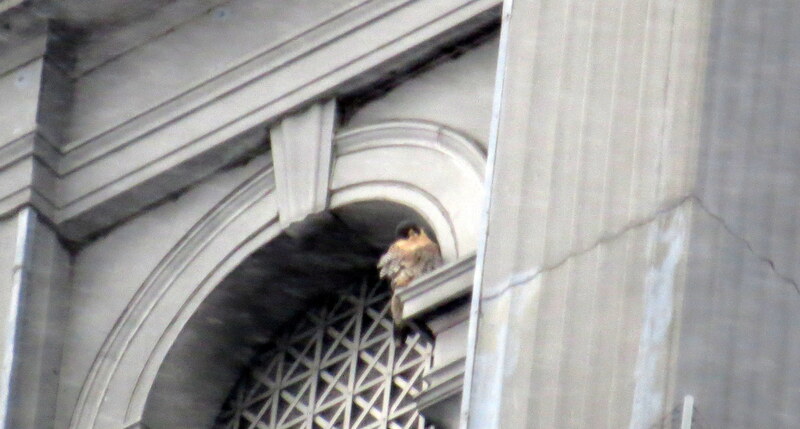 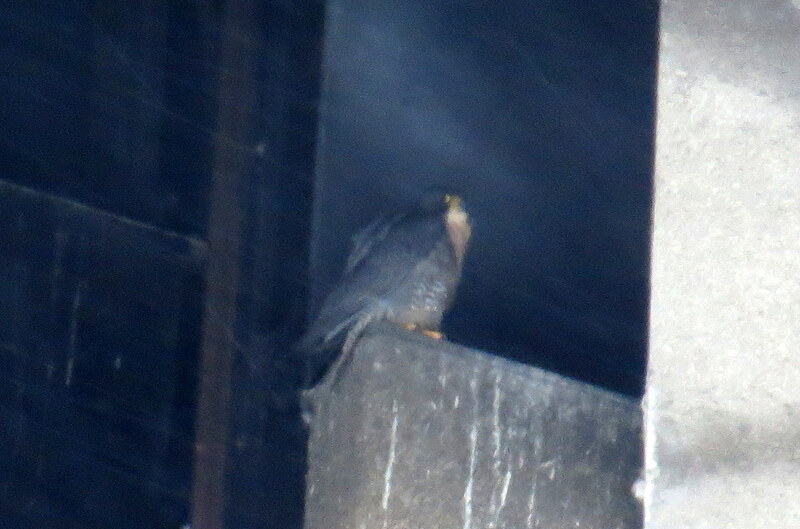 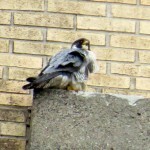 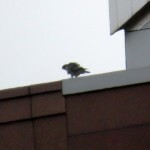 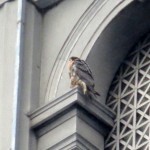 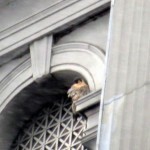 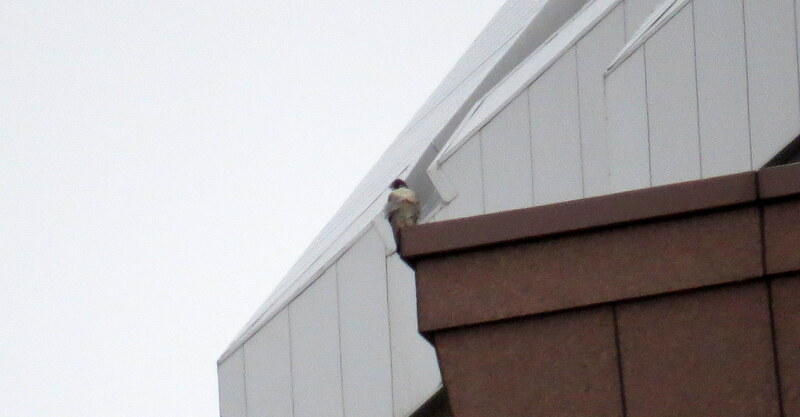 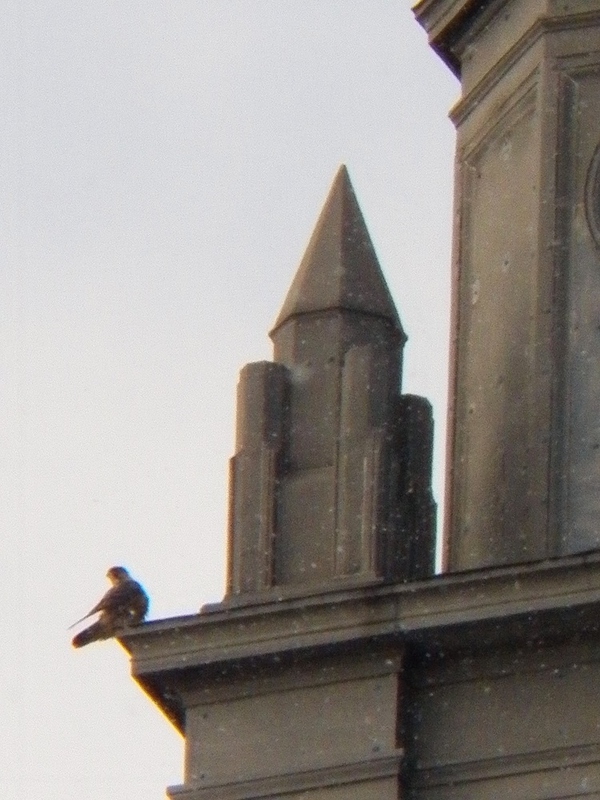 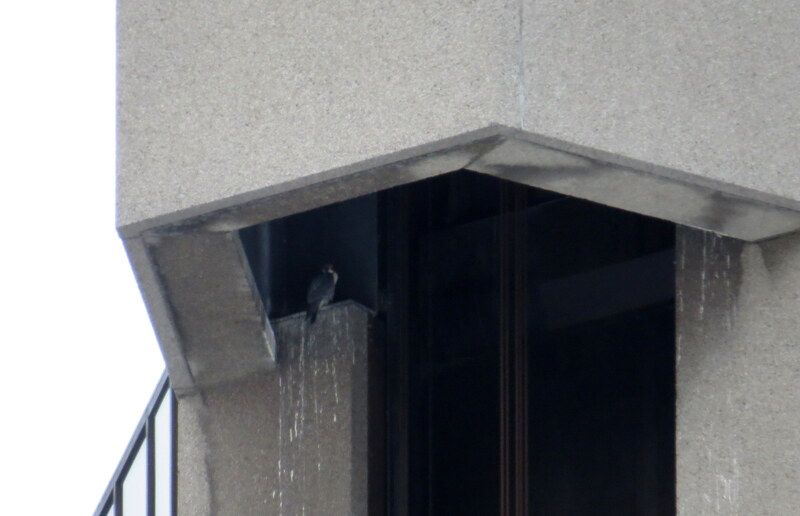 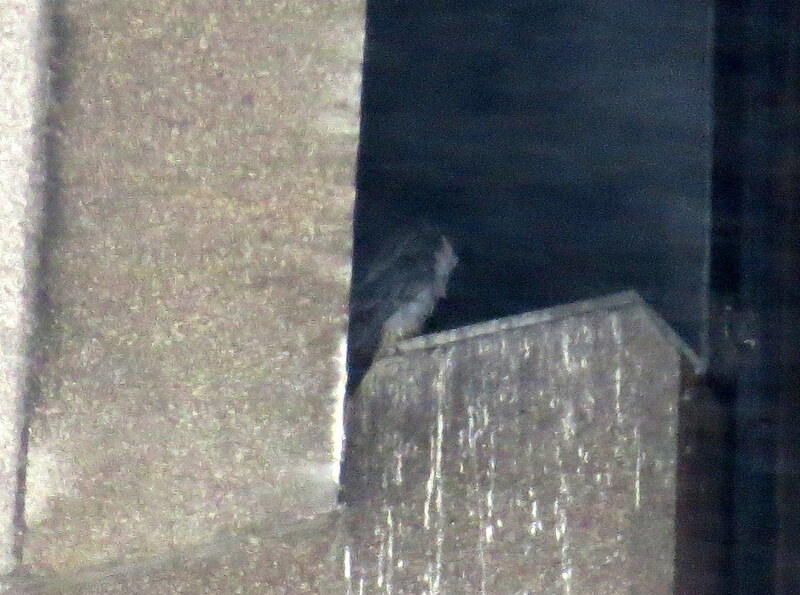 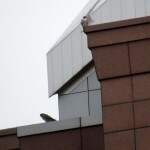 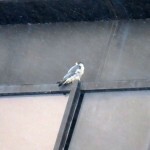 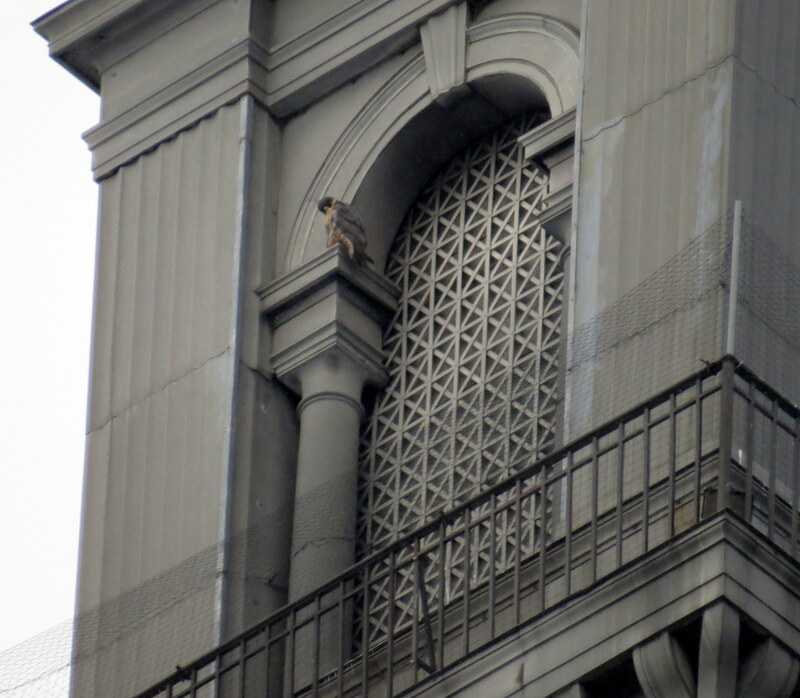 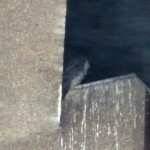 From the north side of the building I saw a 2nd falcon, waiting patiently for a bit of food. 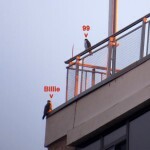 Assuming that this was Billie and 99, Billie was the one with the food on the corner and 99 was the one waiting patiently. 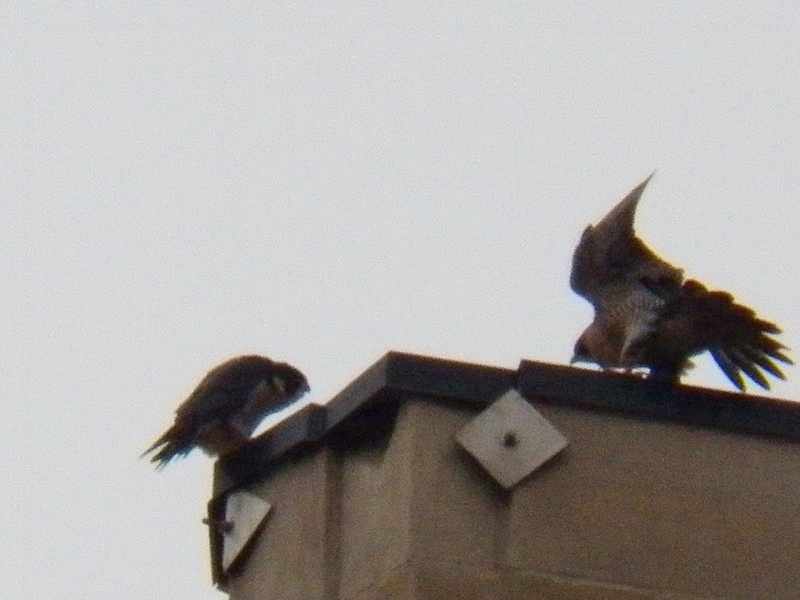 I left them to their dinner and continued on. 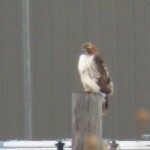 There was no falcon at Russell Station and no Snowy on Buck Pond. 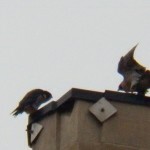 I was very happy to have seen all 4 Rochester falcons. 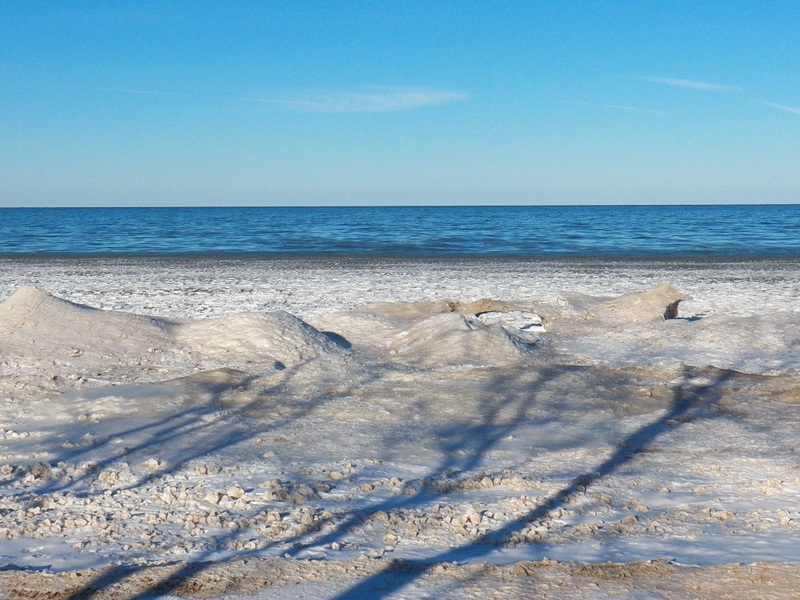 All was peaceful and quiet.